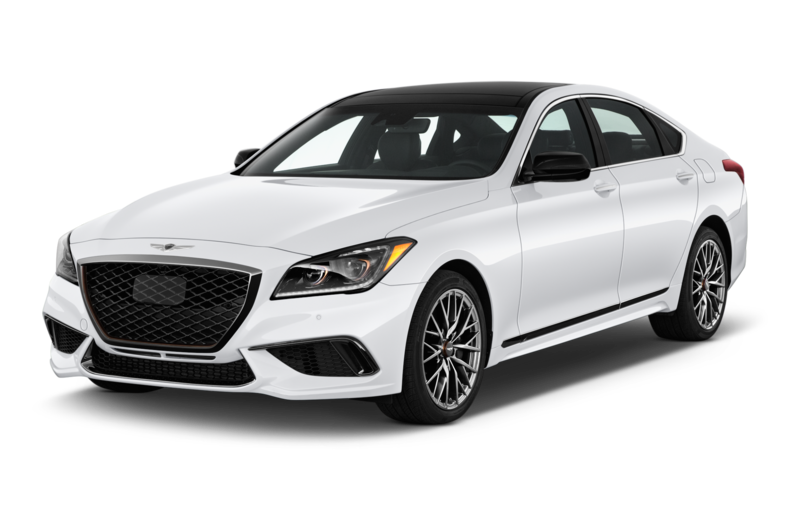 But a sport sedan? 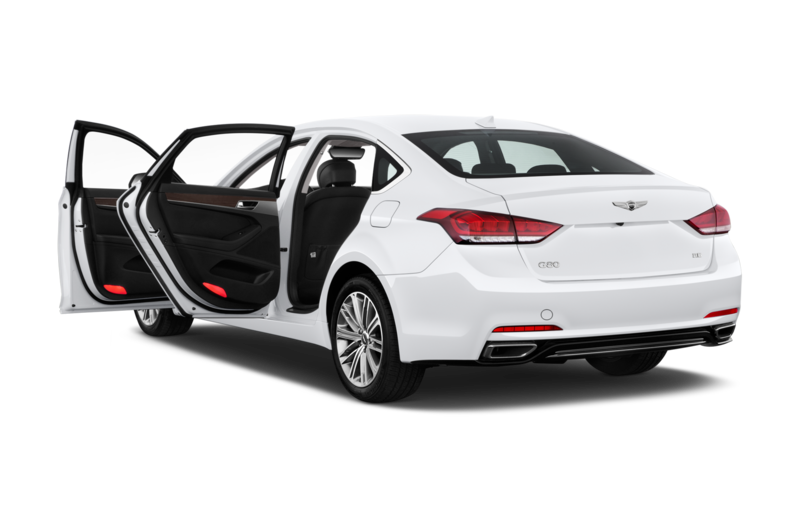 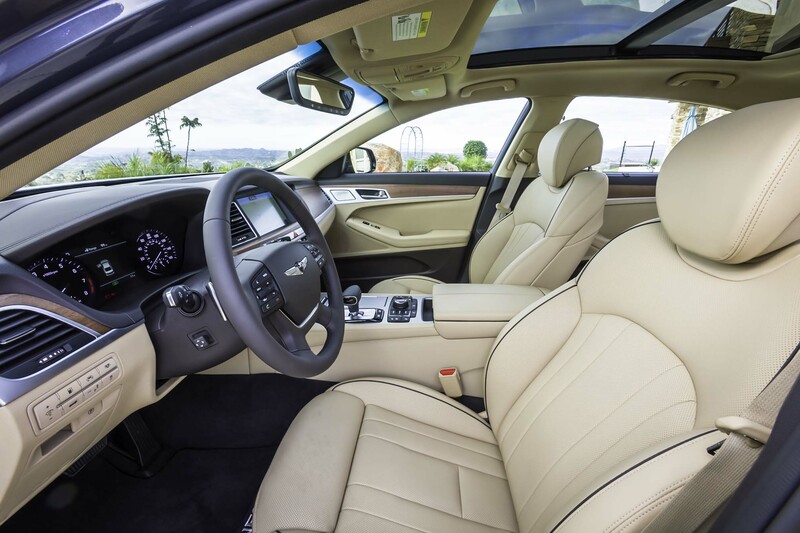 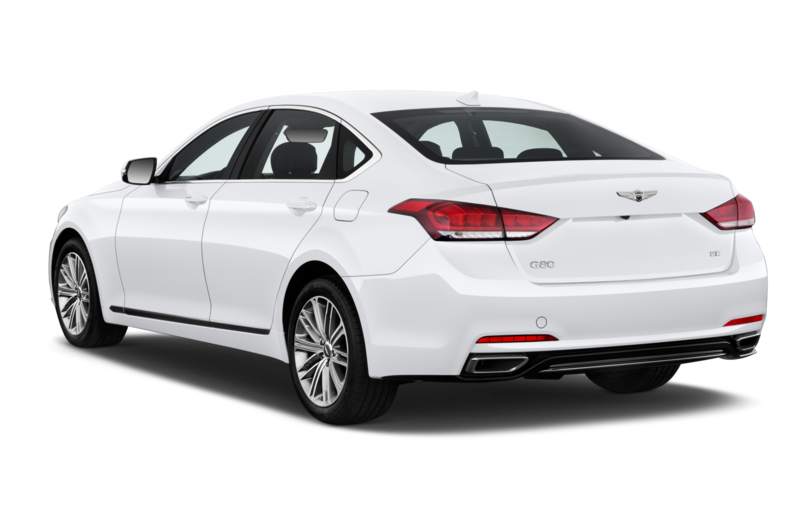 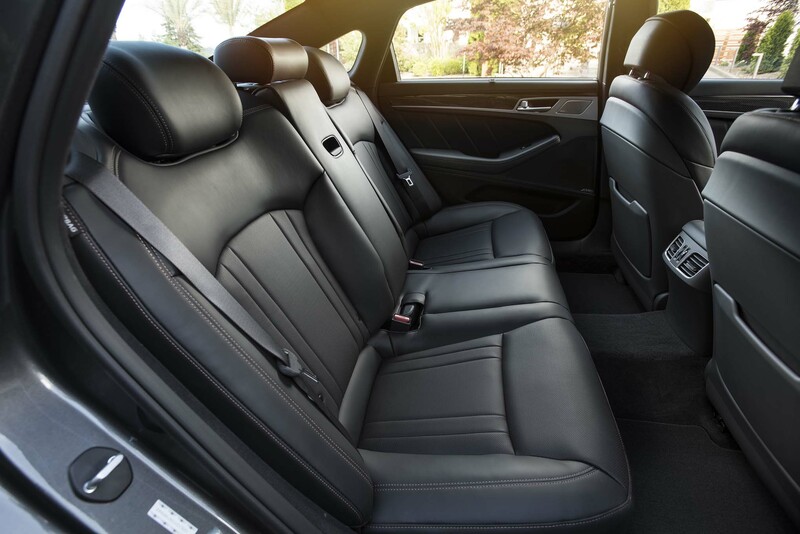 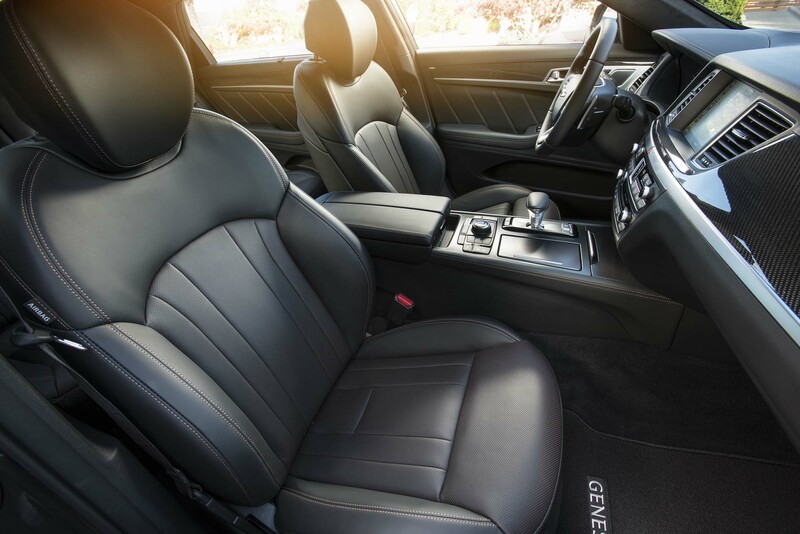 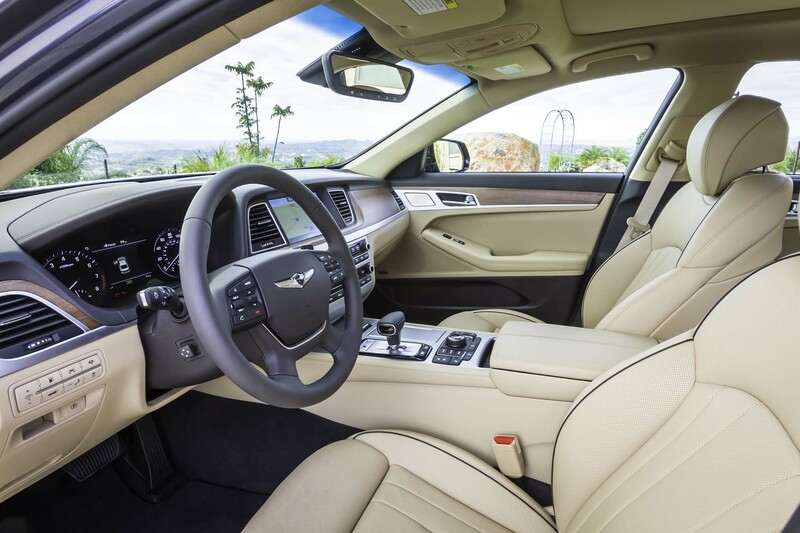 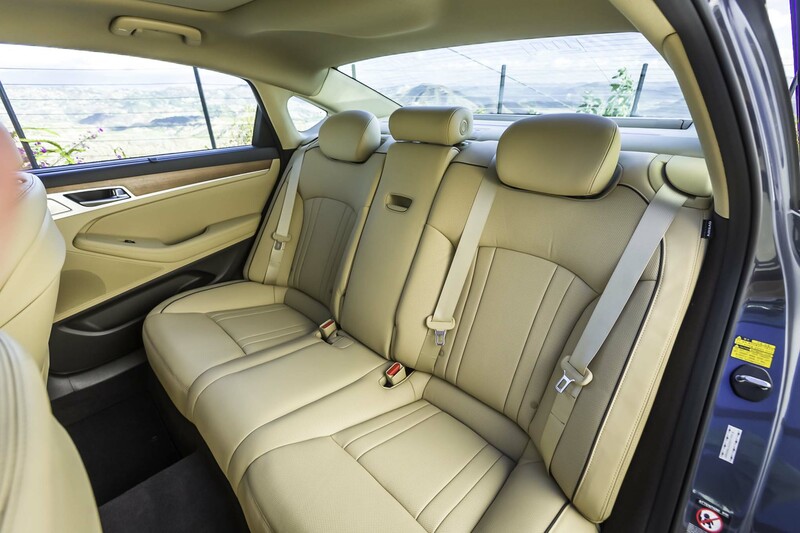 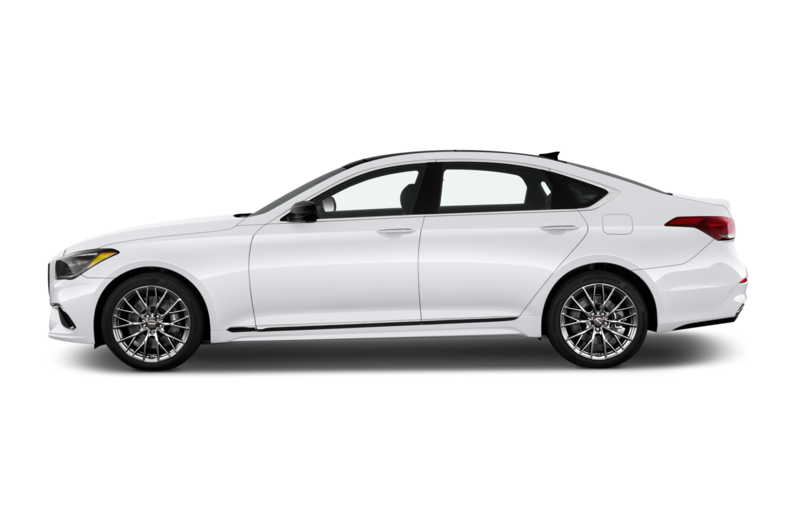 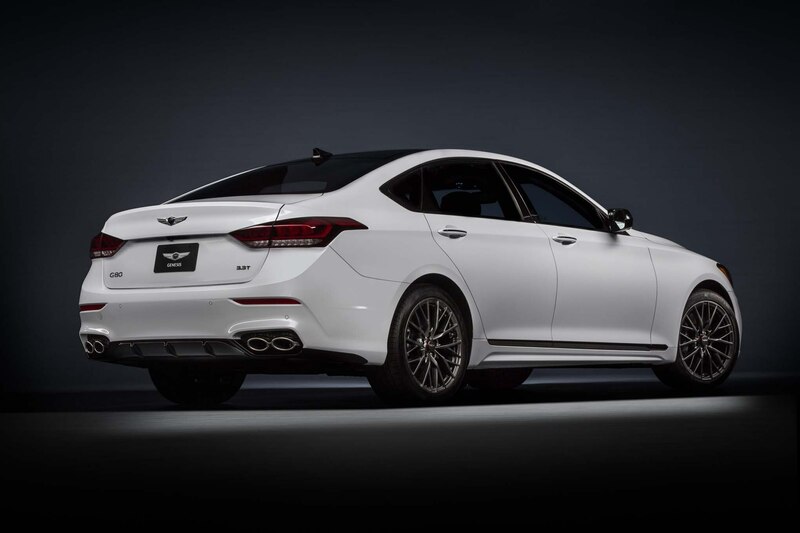 Hyundai-Kia-Genesis engineers (they are one and the same) may have figured out how to put integrate contrasting-color stitching with top-of-the-line cowhides, but really good steering and suspension tuning have largely eluded them. 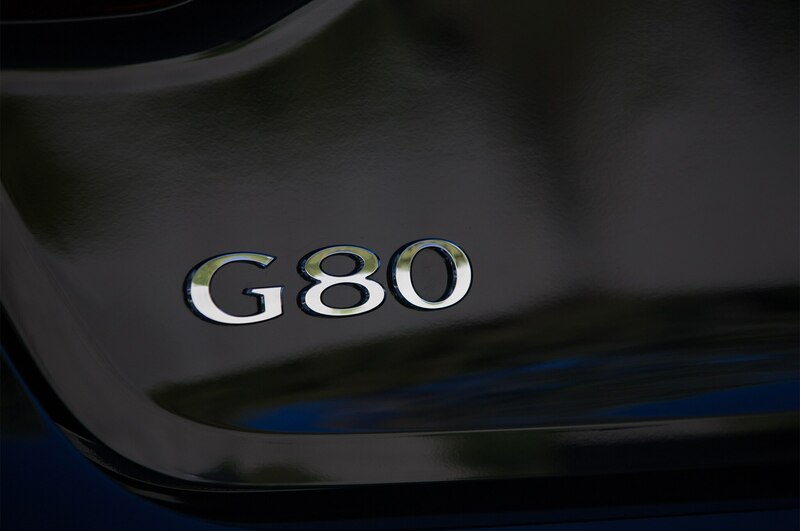 Our own Arthur St. Antoine, who spent a week with a G80 5.0 Ultimate, praised the poshness of the G80, but held out little hope for future performance versions. 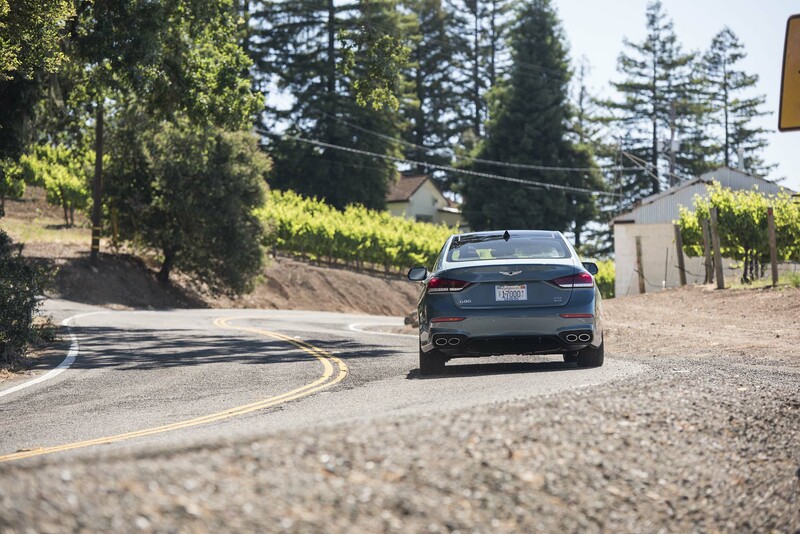 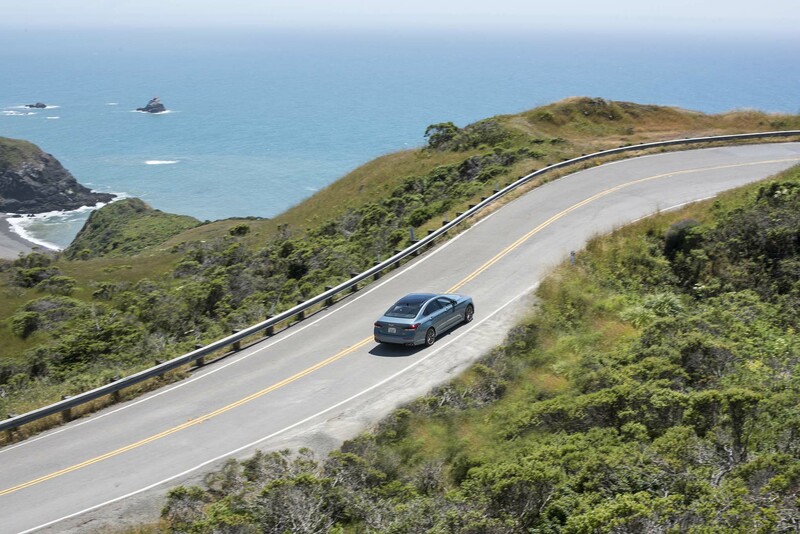 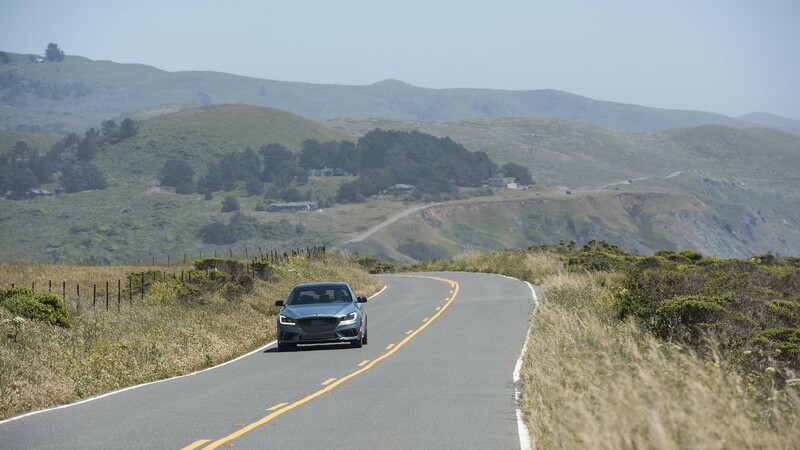 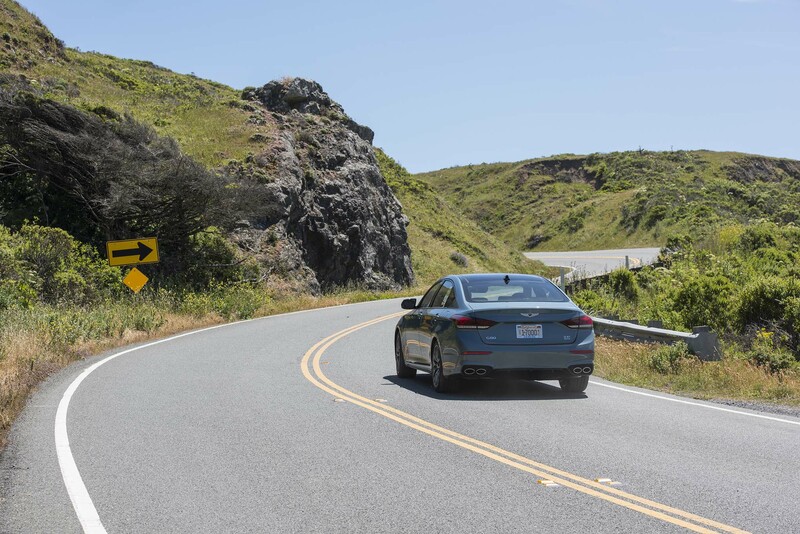 Thus was the mindset with which I ventured into the Napa Valley to sample the new G80 3.3T Sport. 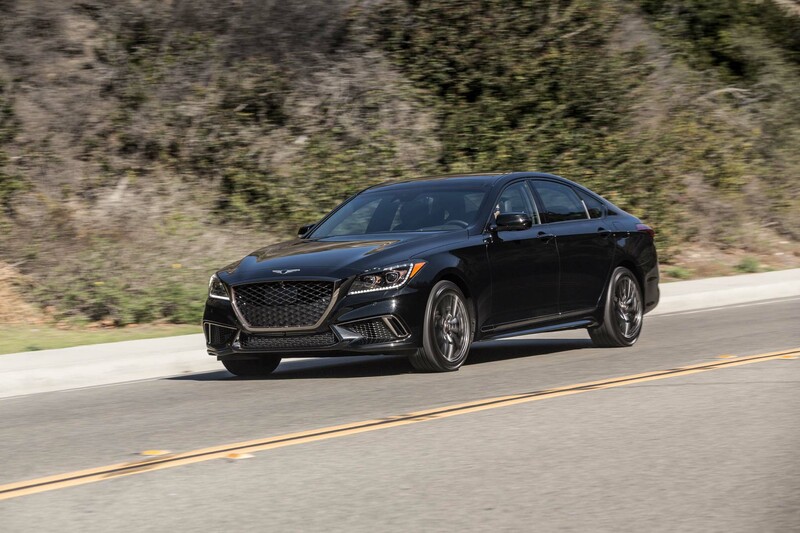 I didn’t expect much from the hot-rod G80, and yet — well, I think you can see where this is going. 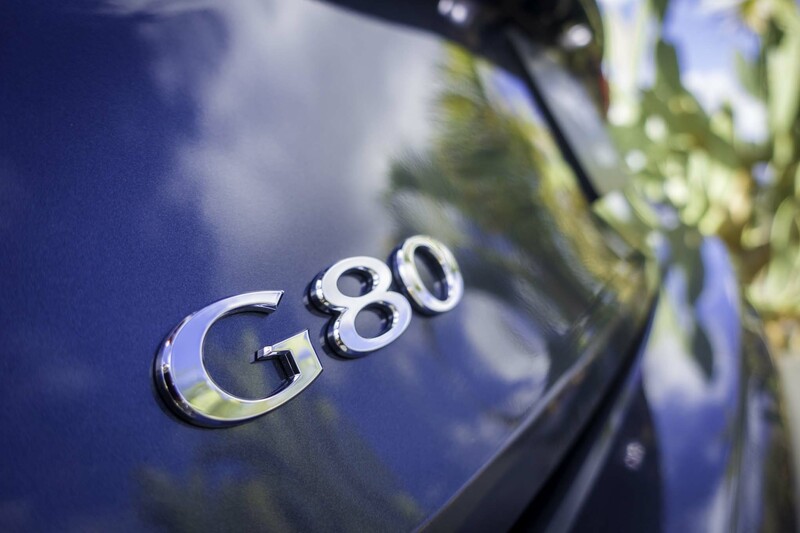 What sets the G80 3.3T Sport apart from other G80s? 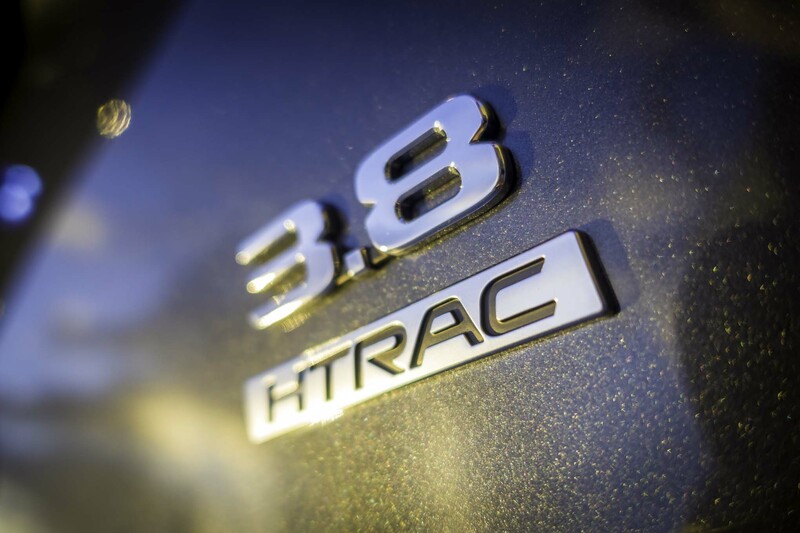 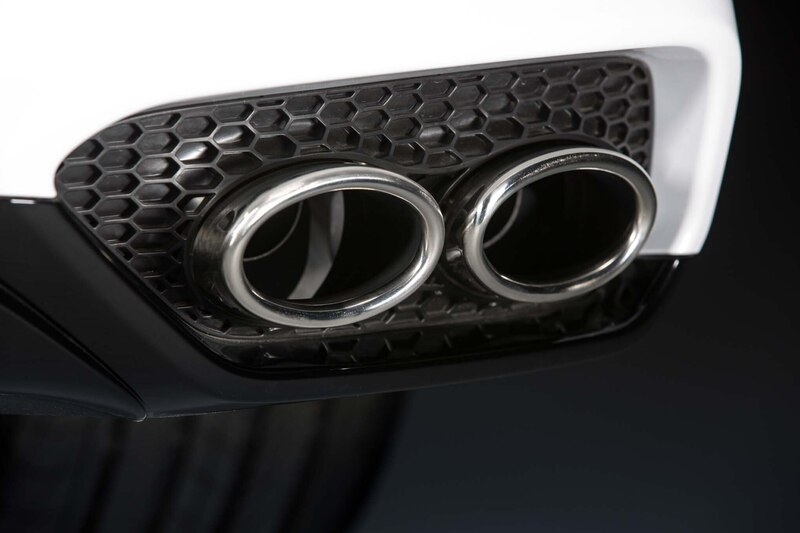 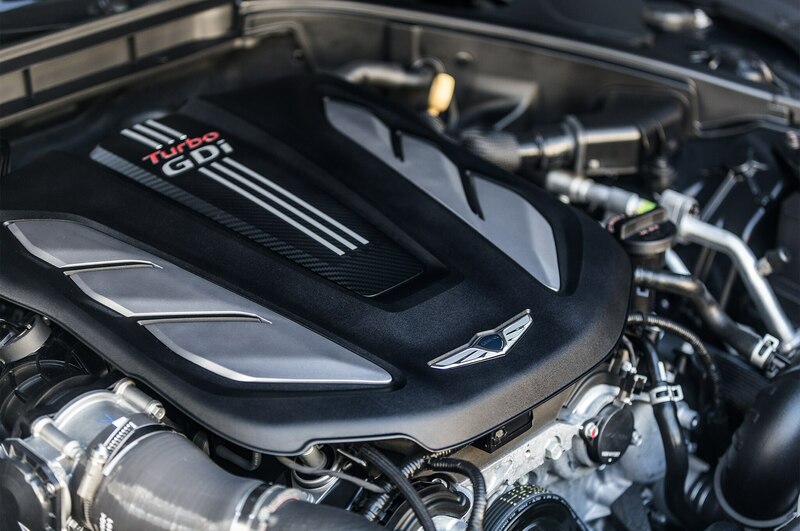 First and foremost is the engine: A 3.3 liter twin-turbo V6 tuned for 365 hp and 376 lb-ft, the latter (allegedly) available between 1,300 and 4,500 RPM. 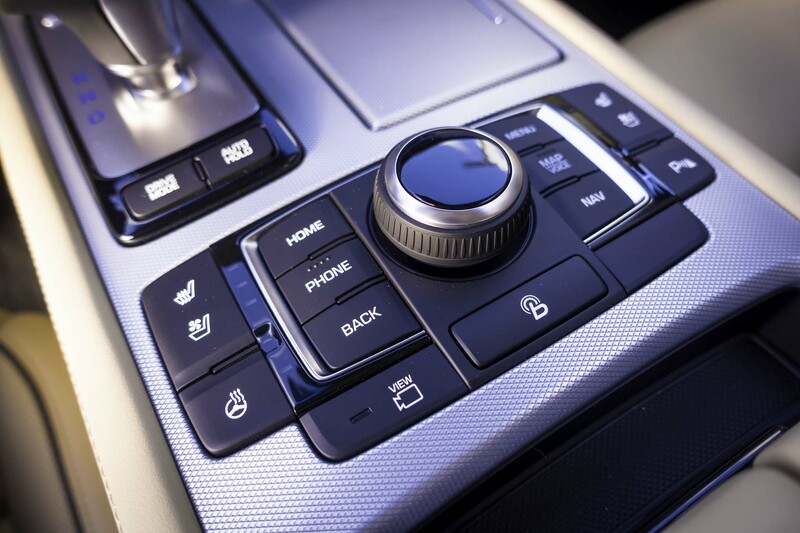 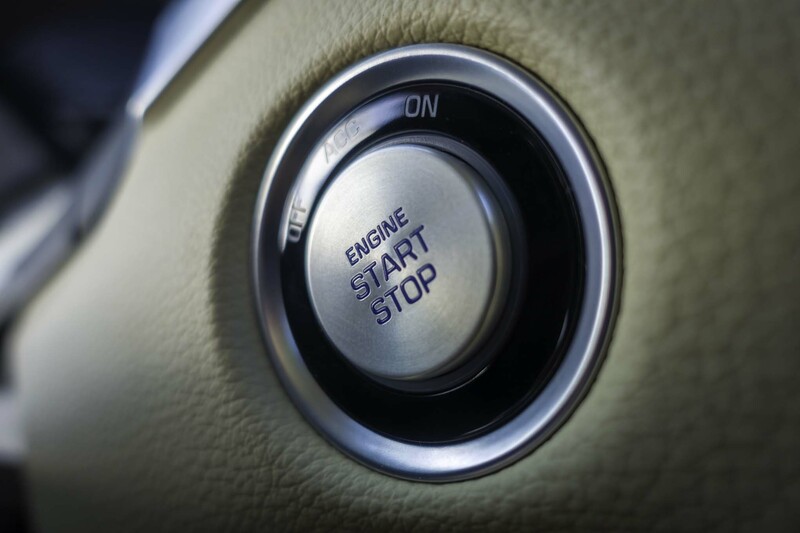 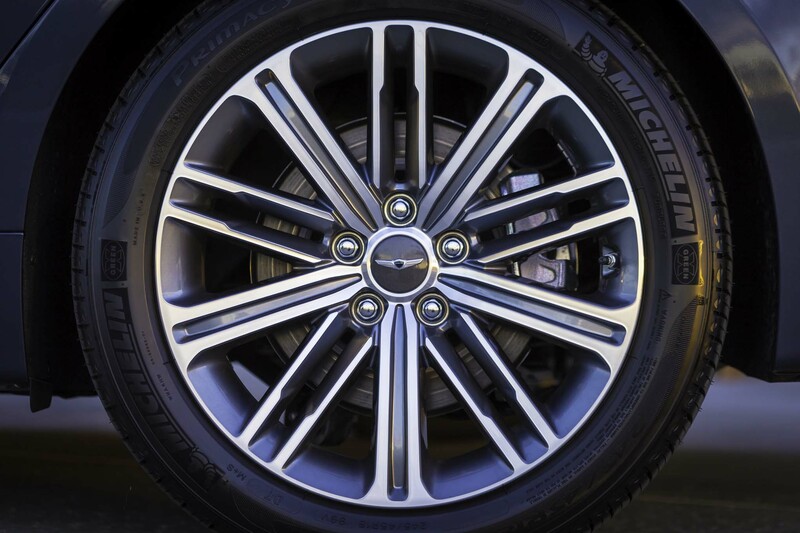 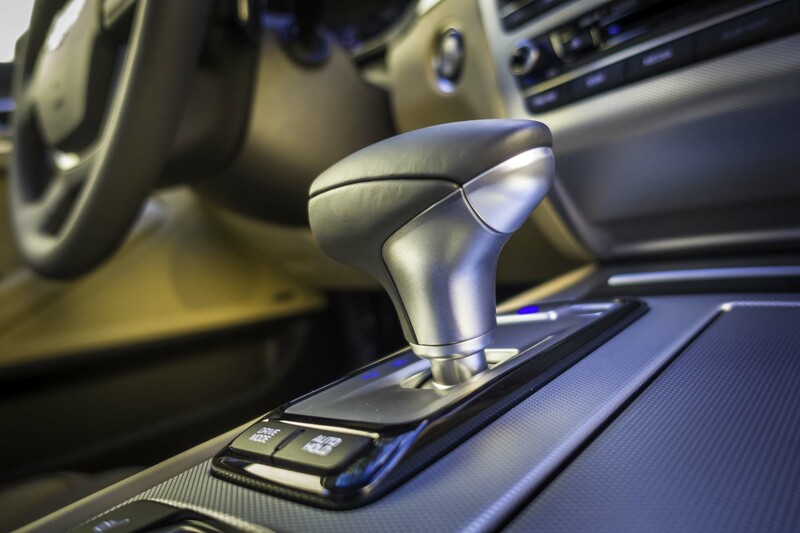 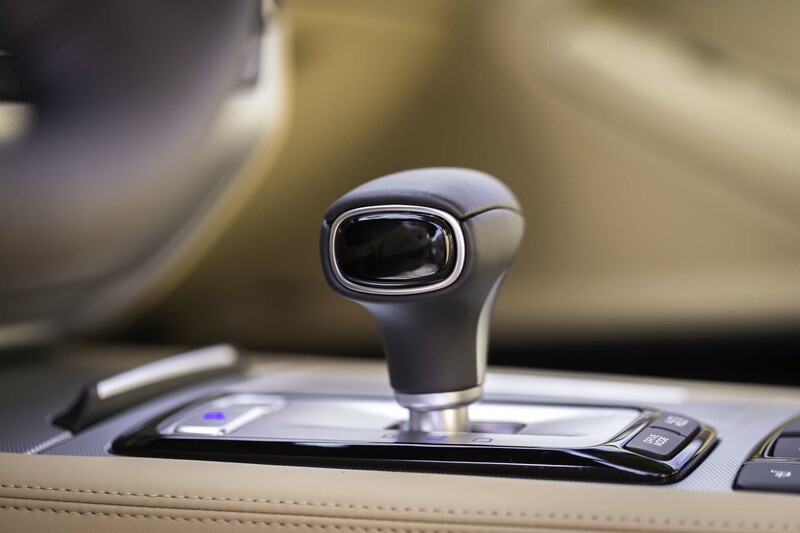 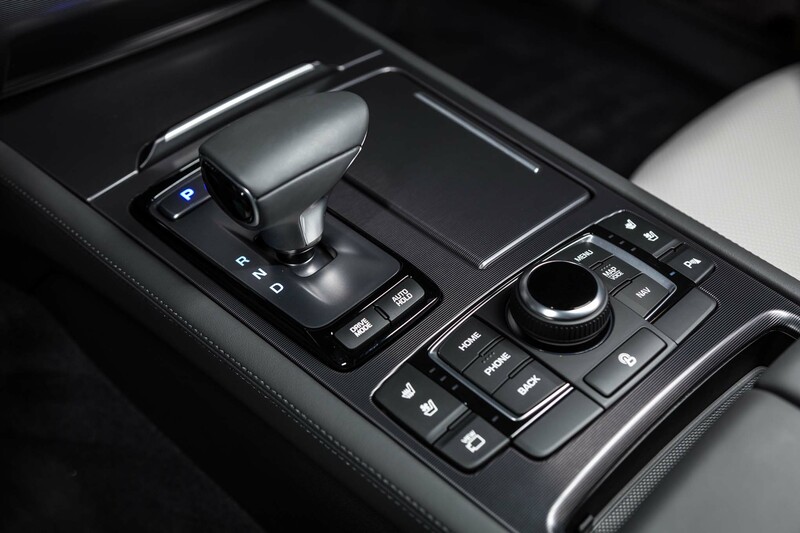 It’s attached to an eight-speed automatic with paddle shifters and a rev-matching feature. 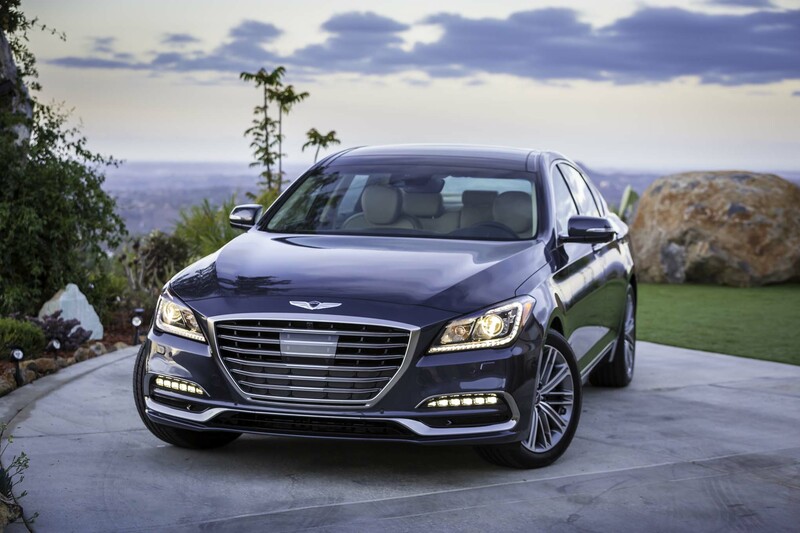 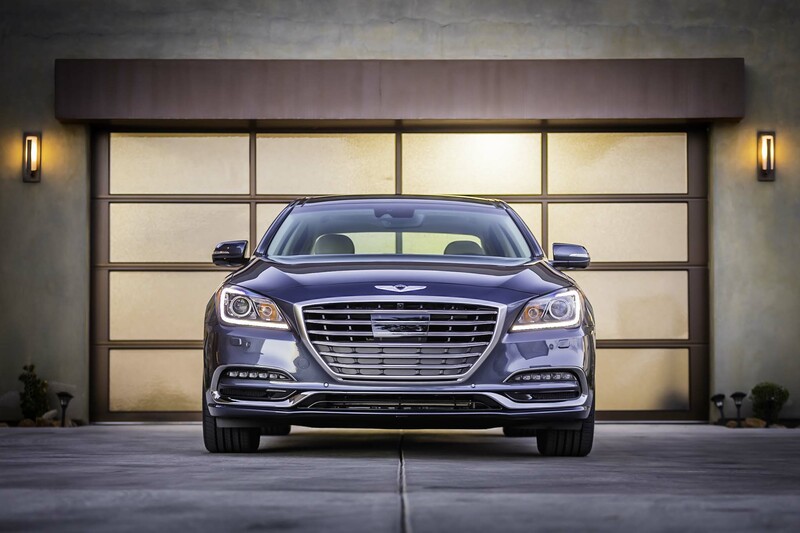 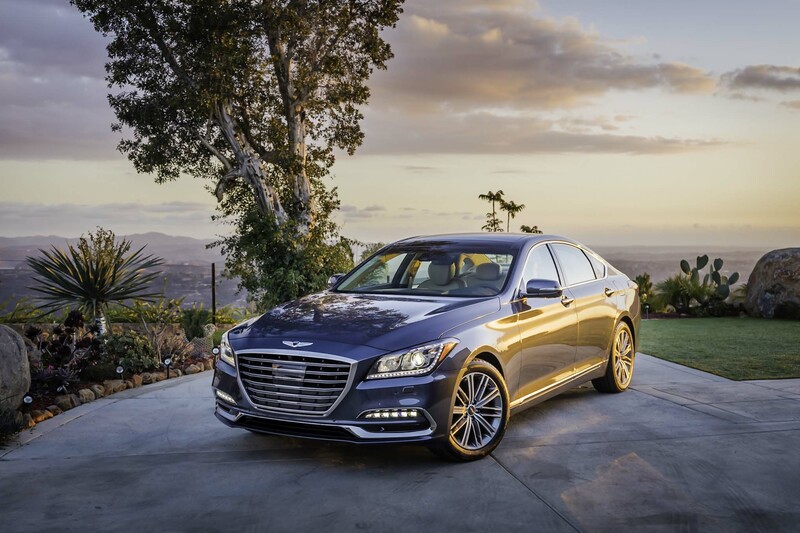 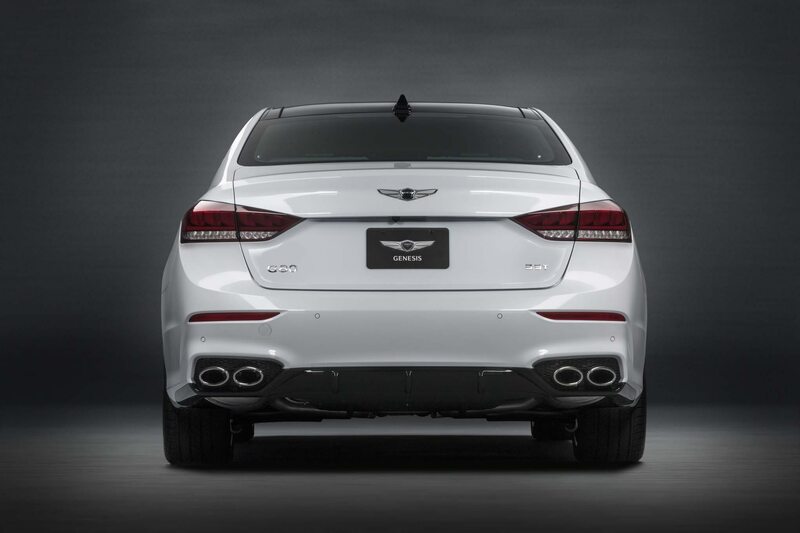 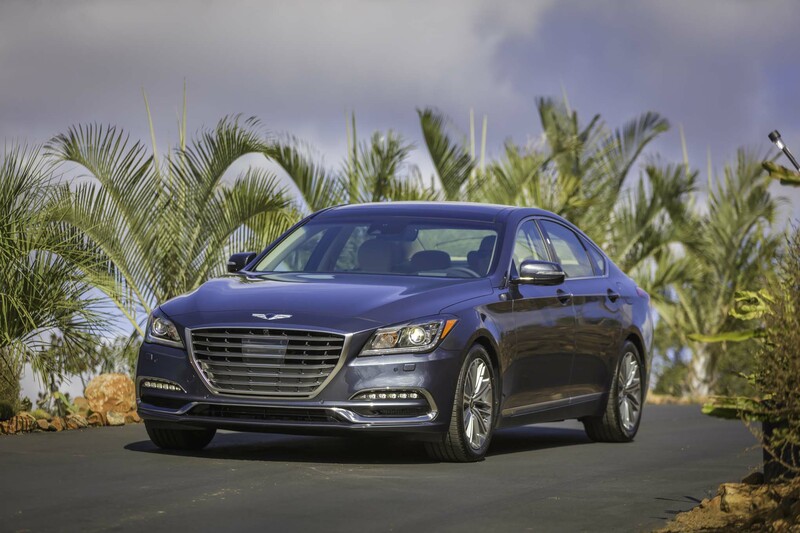 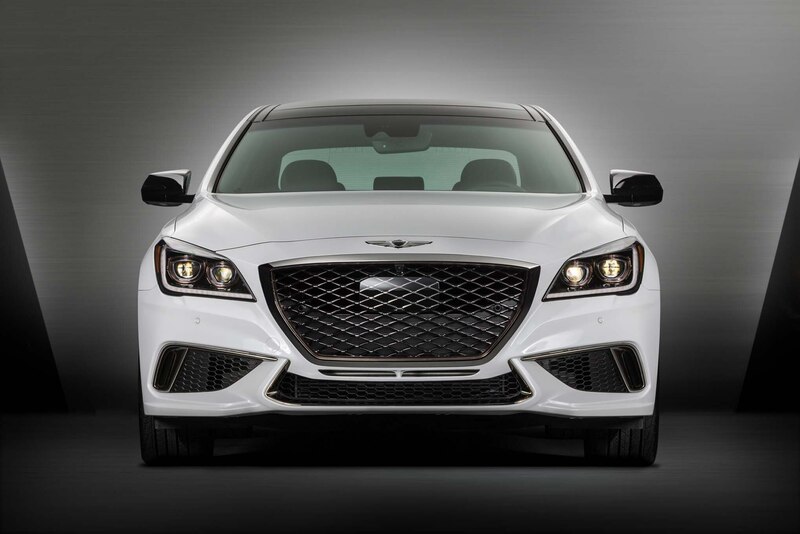 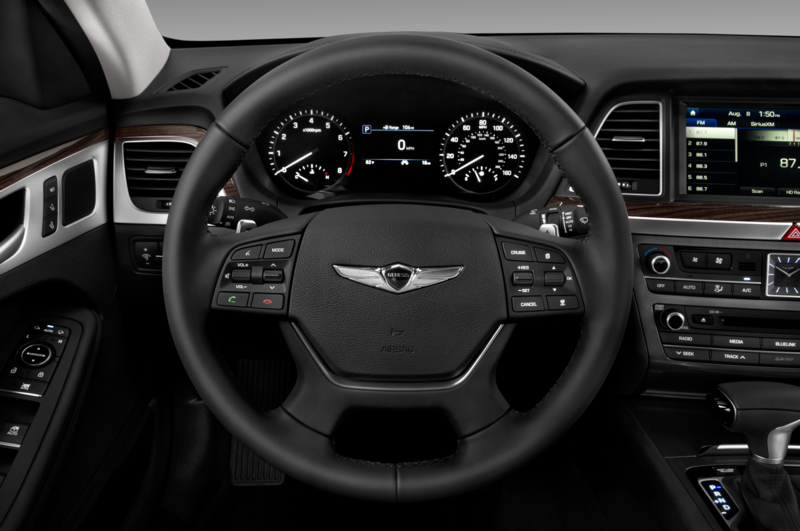 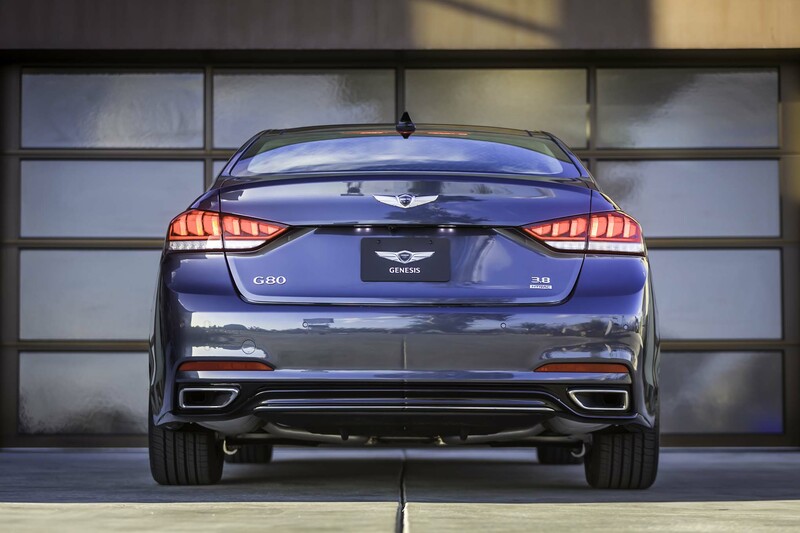 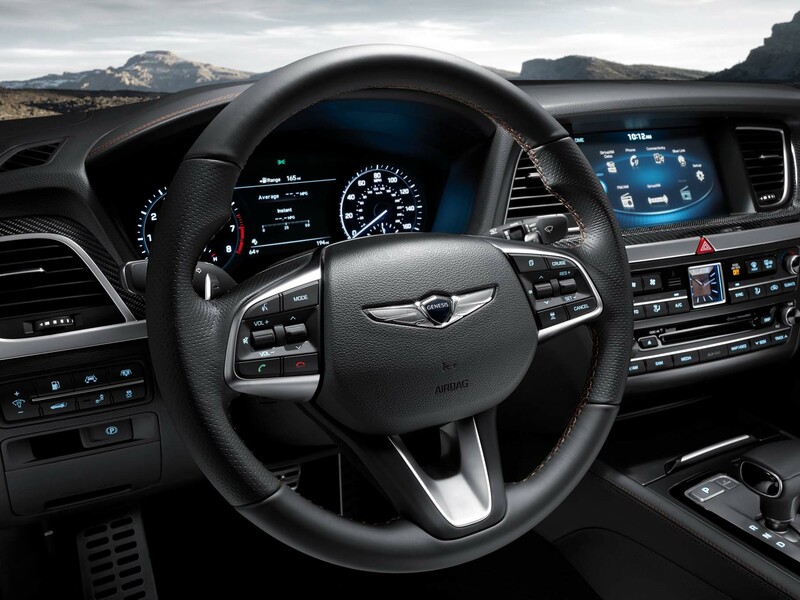 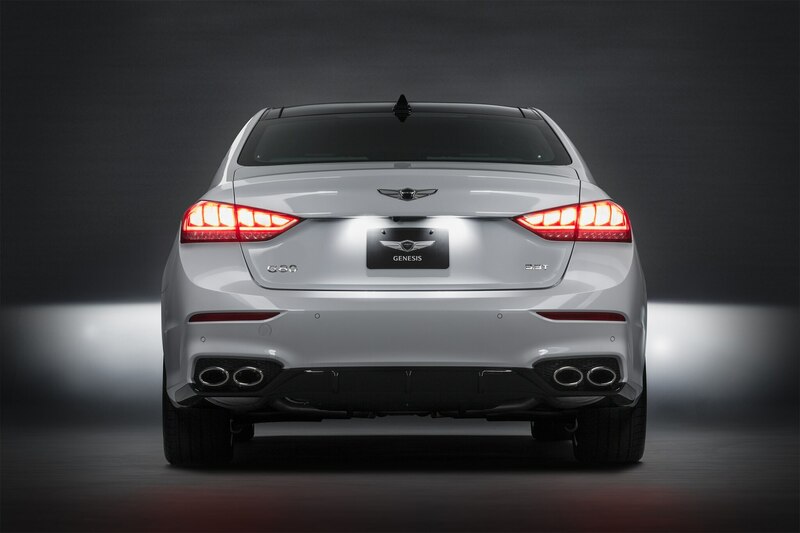 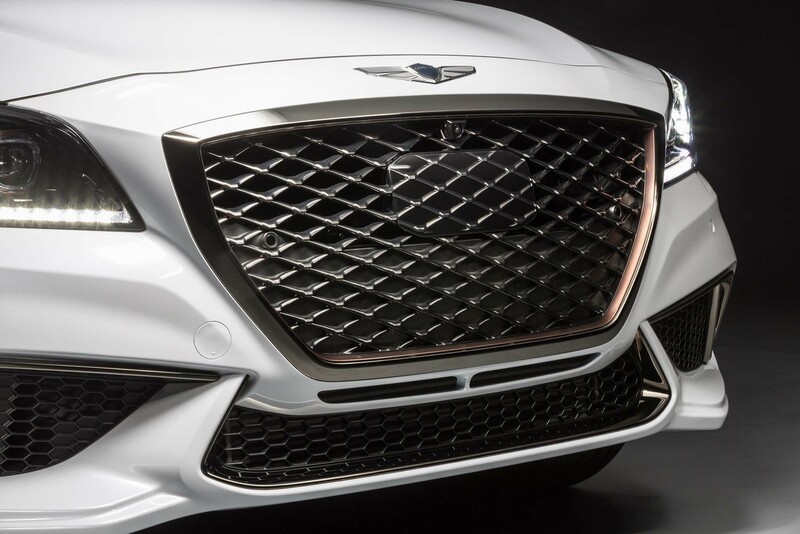 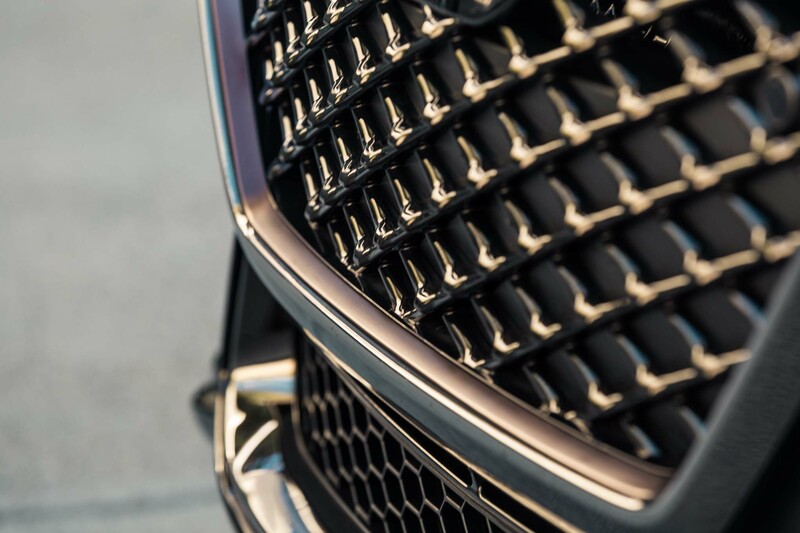 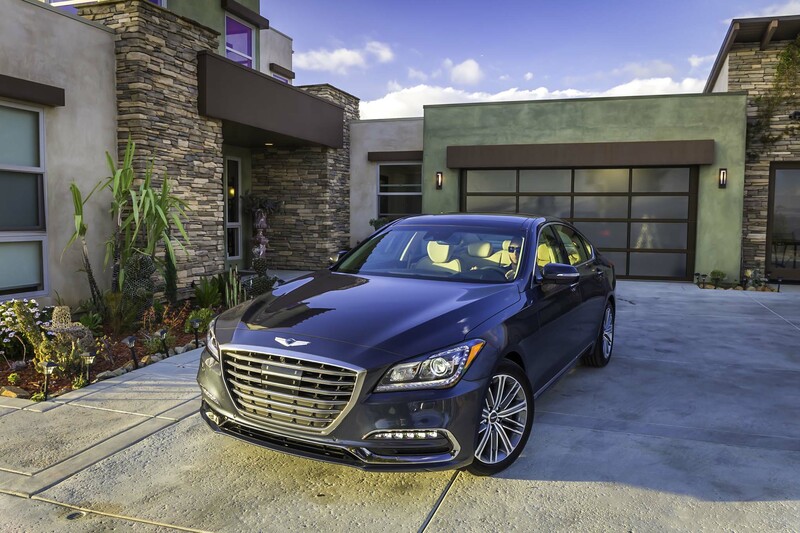 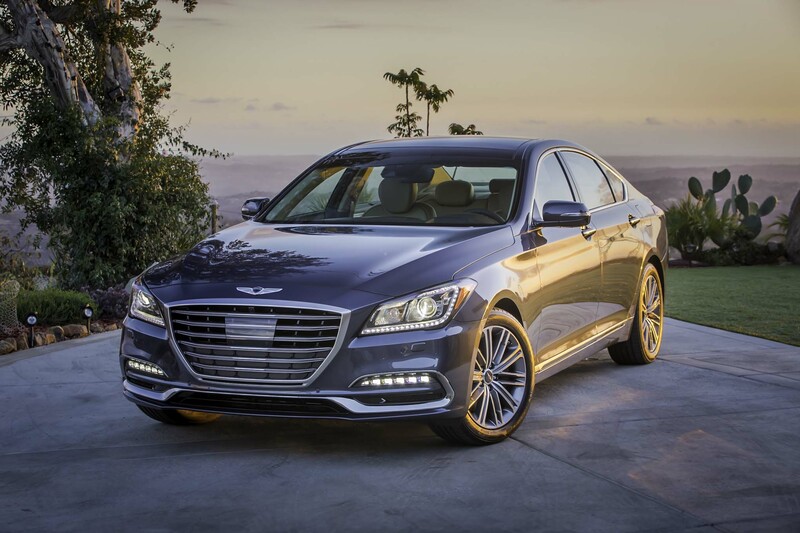 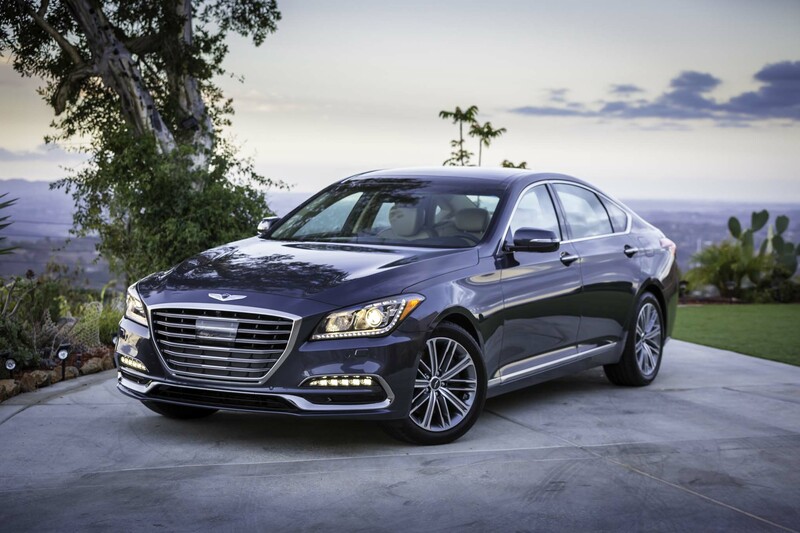 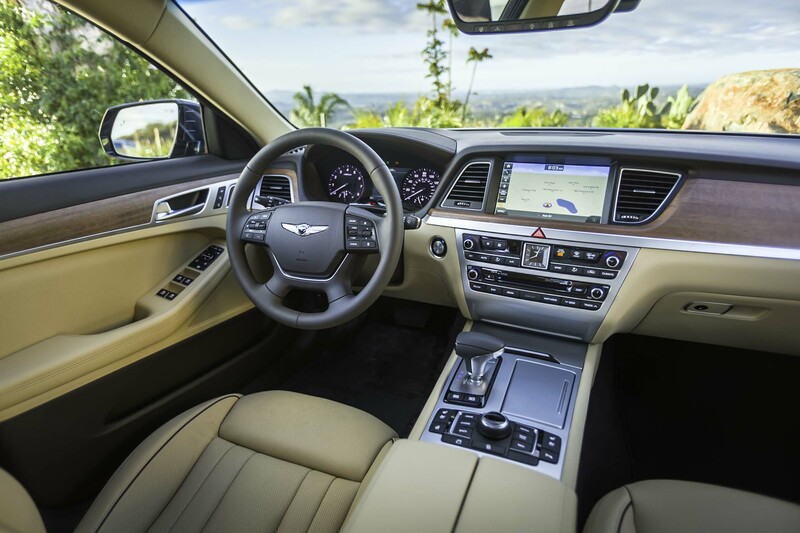 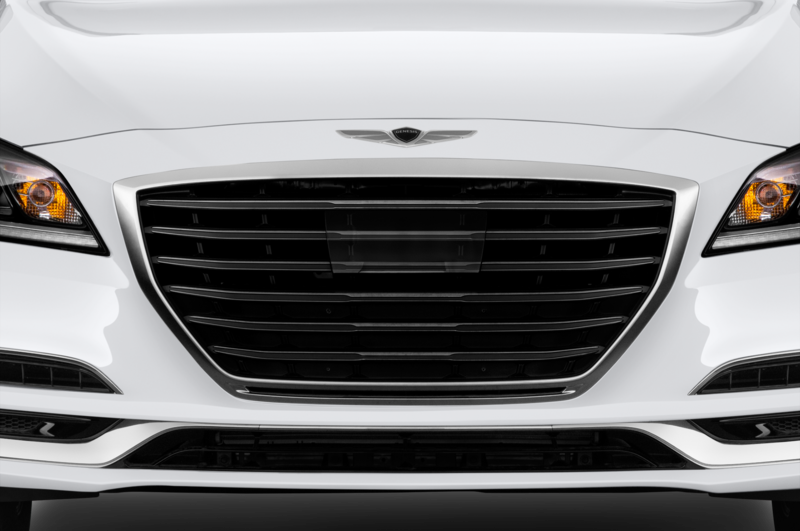 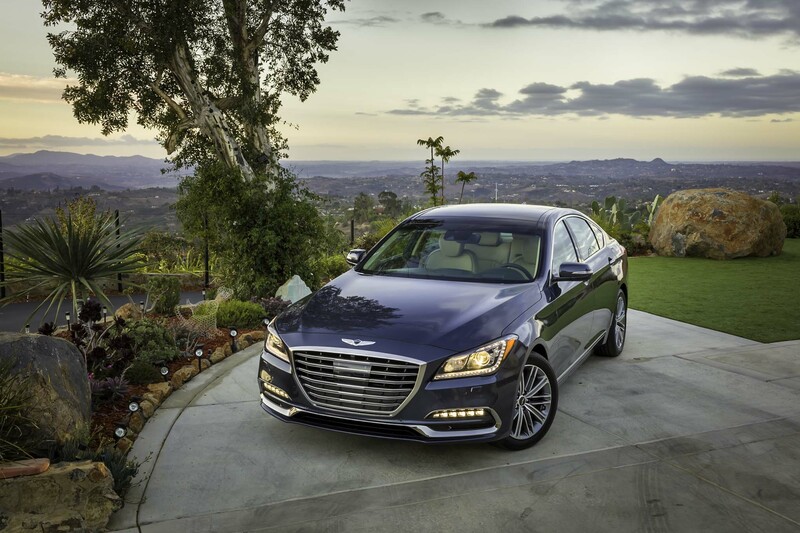 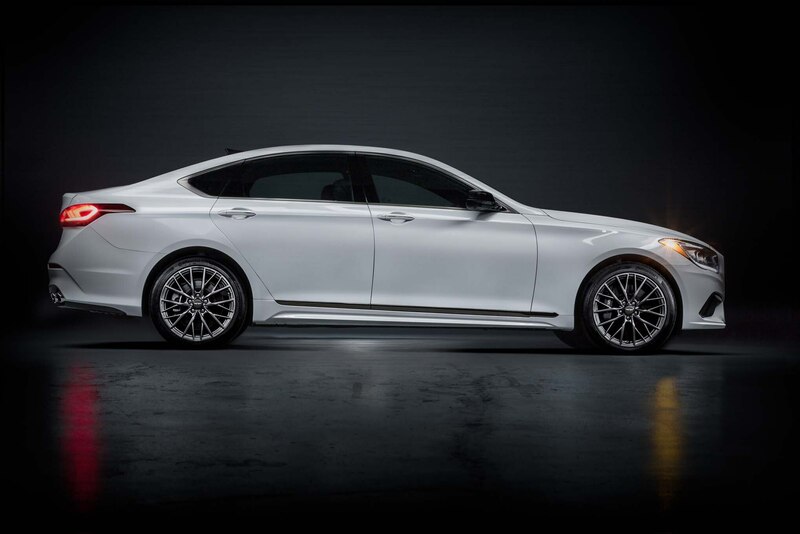 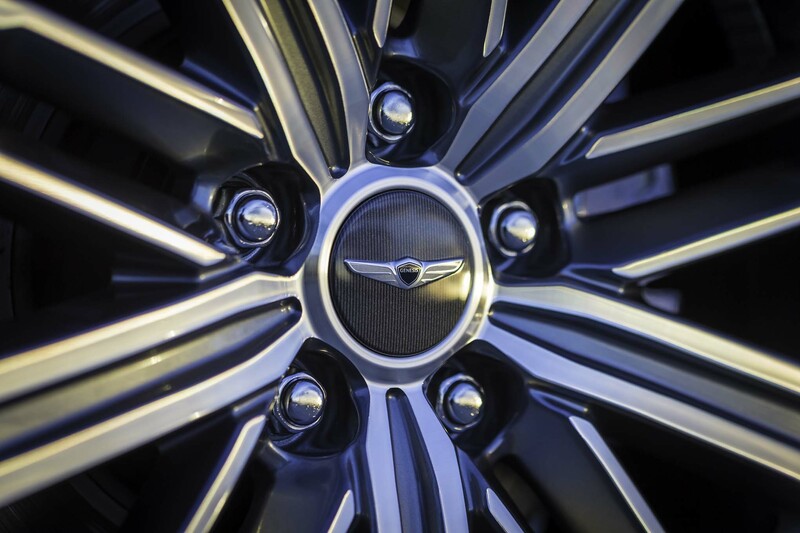 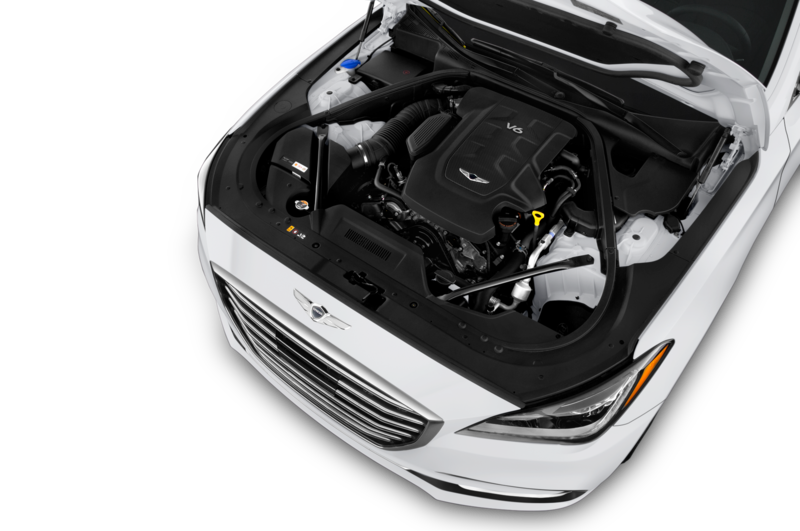 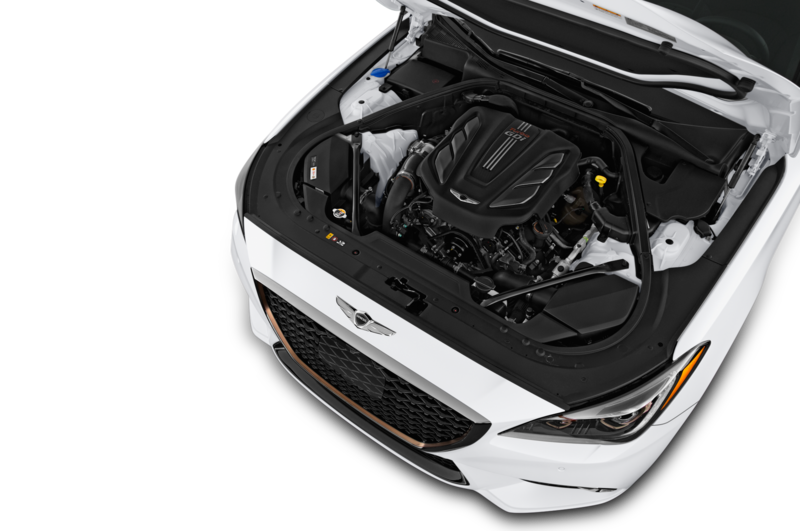 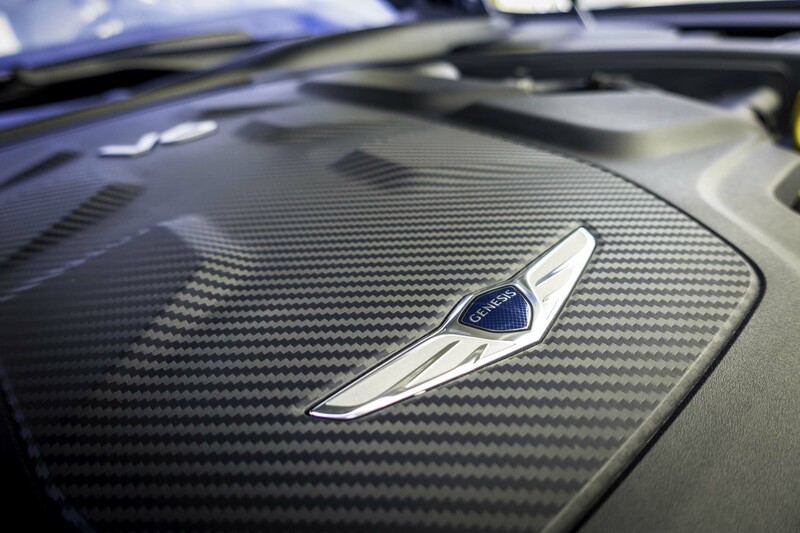 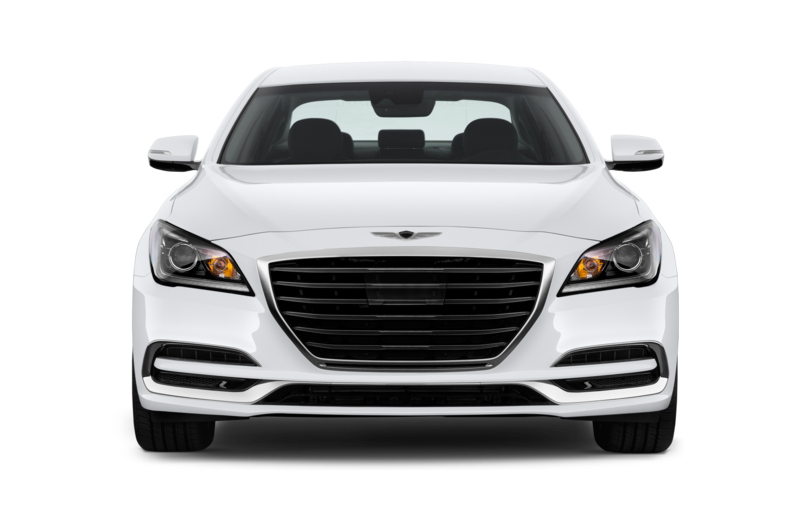 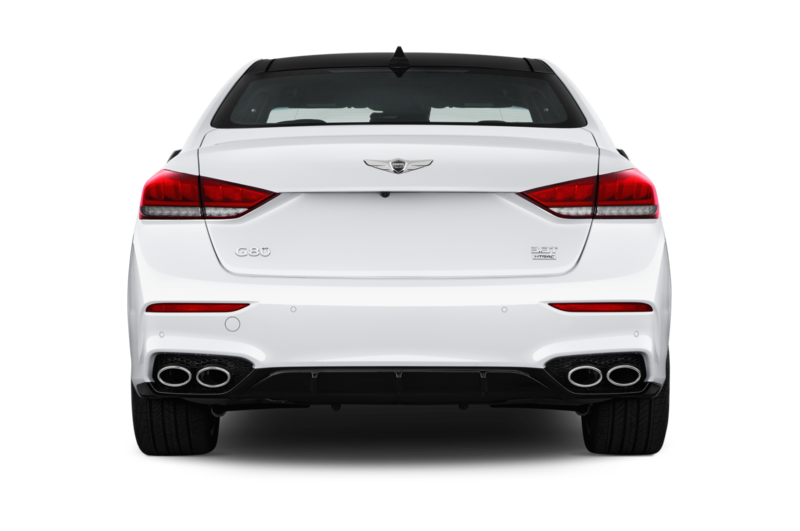 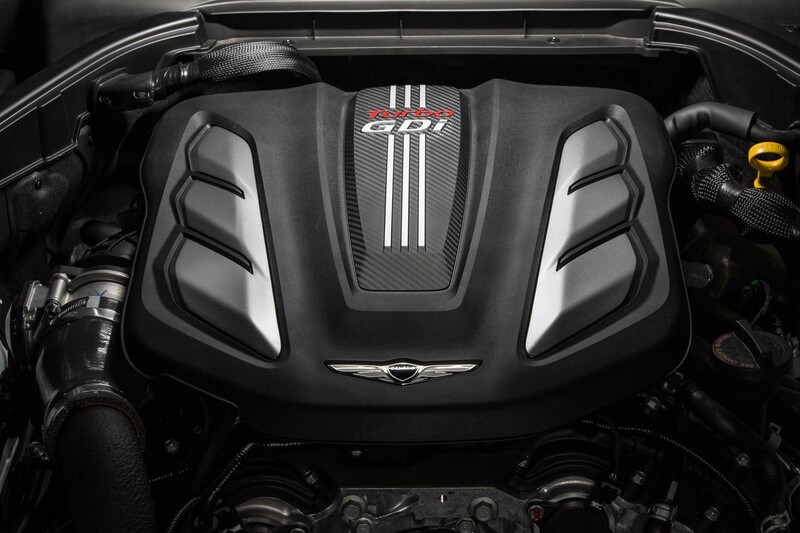 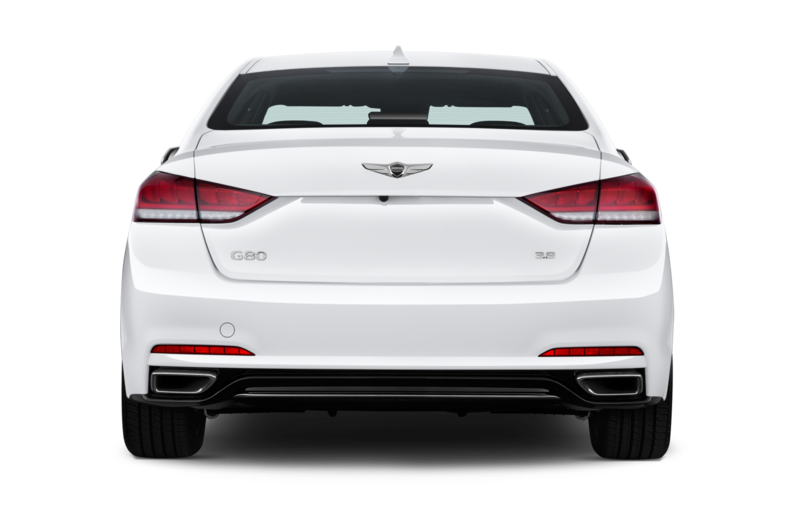 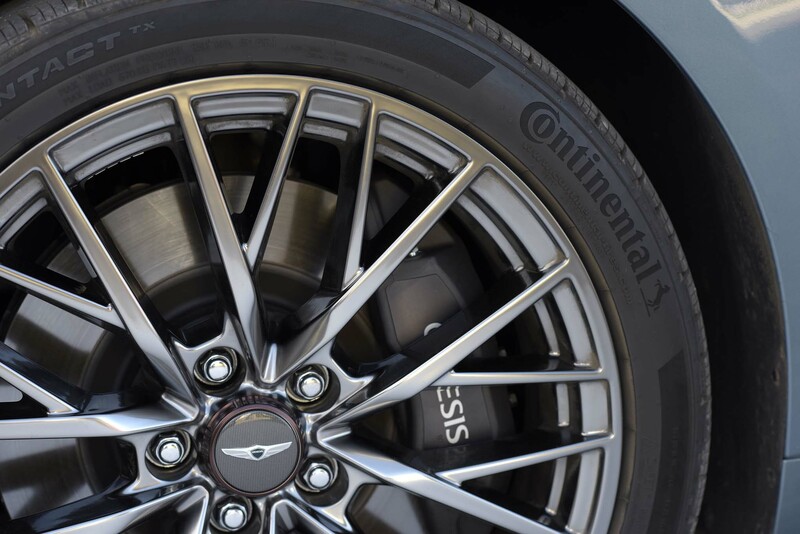 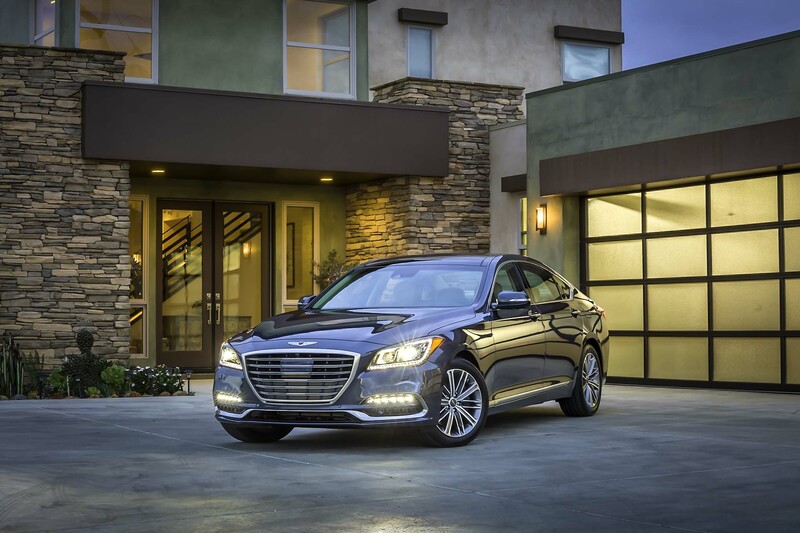 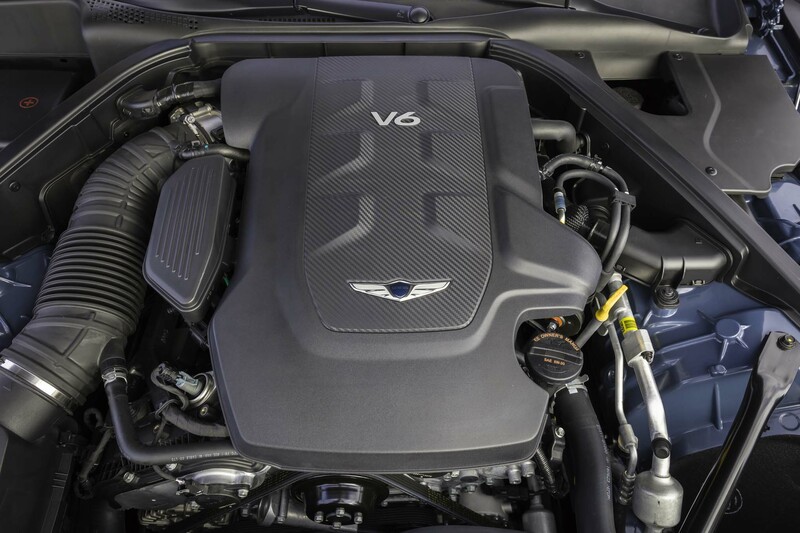 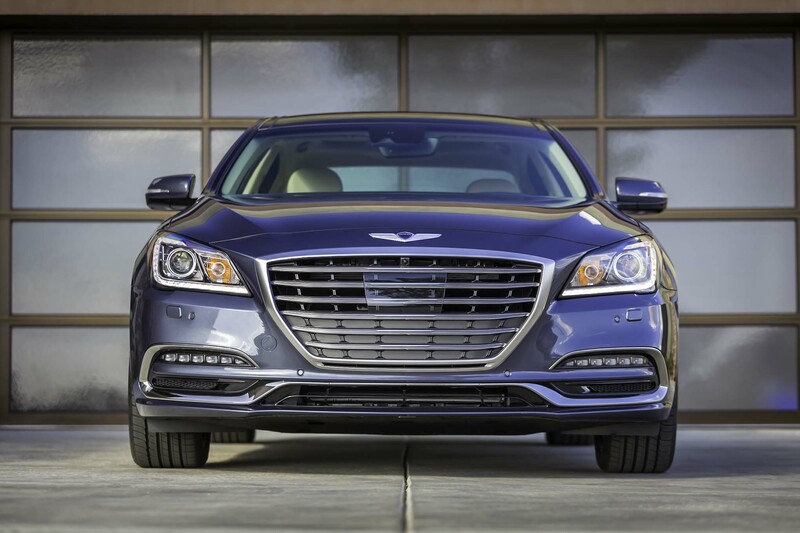 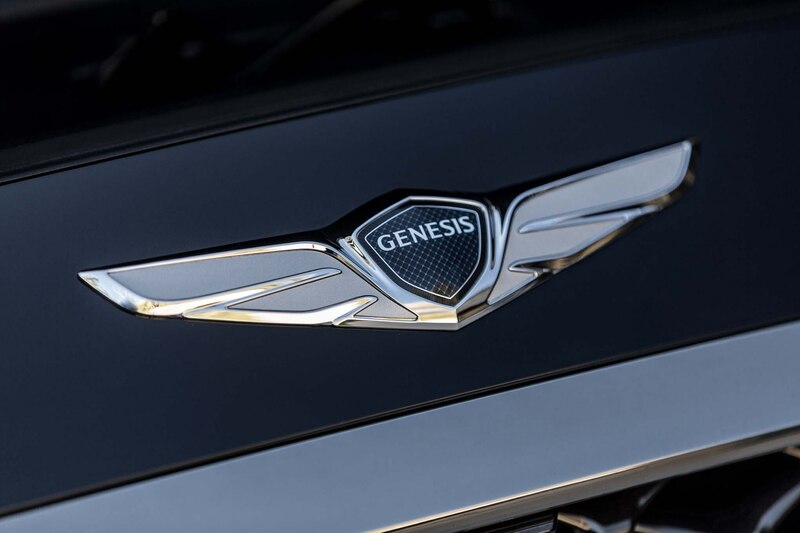 We wondered why Genesis didn’t fit the 420-hp 5.0-liter V8; both engines are offered in the G90 and the V-8 is quicker. 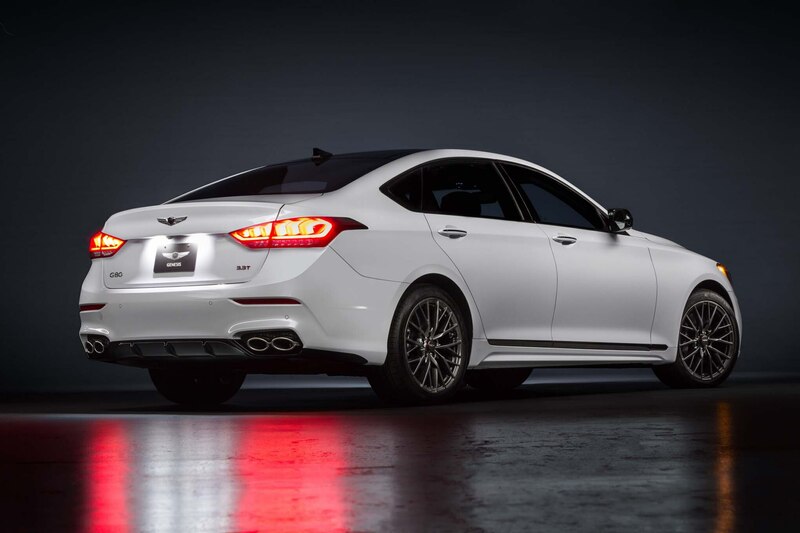 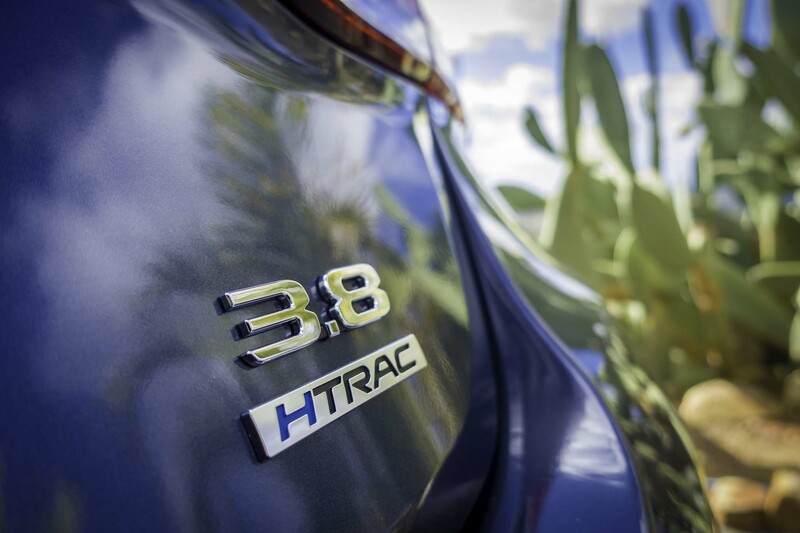 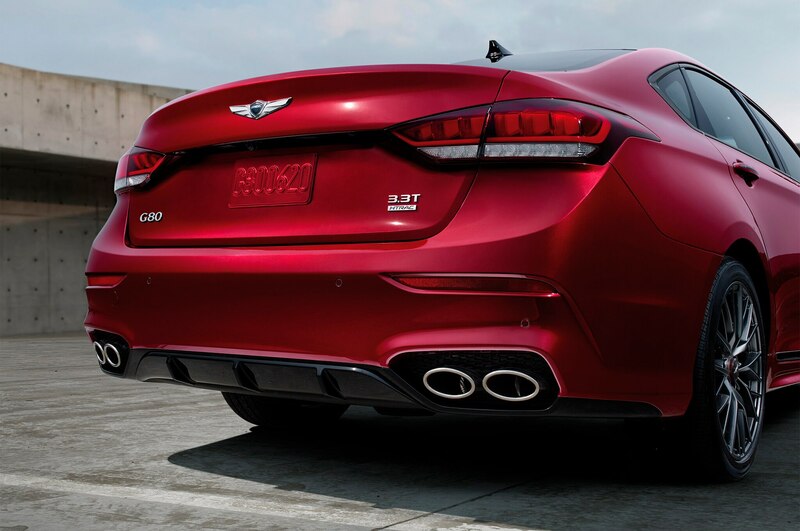 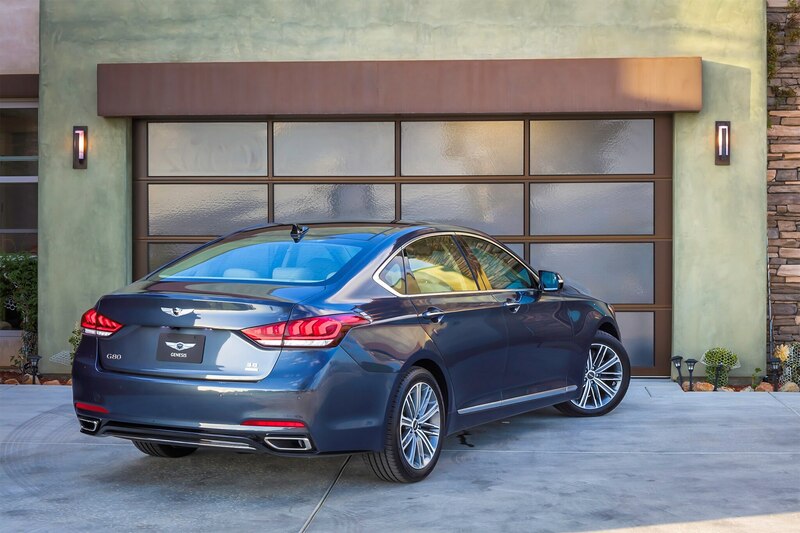 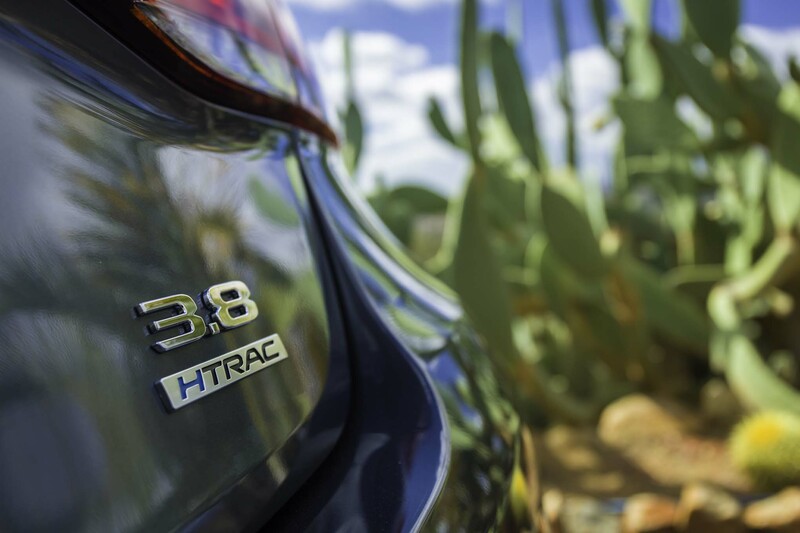 Hyundai credits the V-6’s lighter weight, though exclusivity probably played a role as well. Besides, having “twin turbo” in your sales literature is cool. 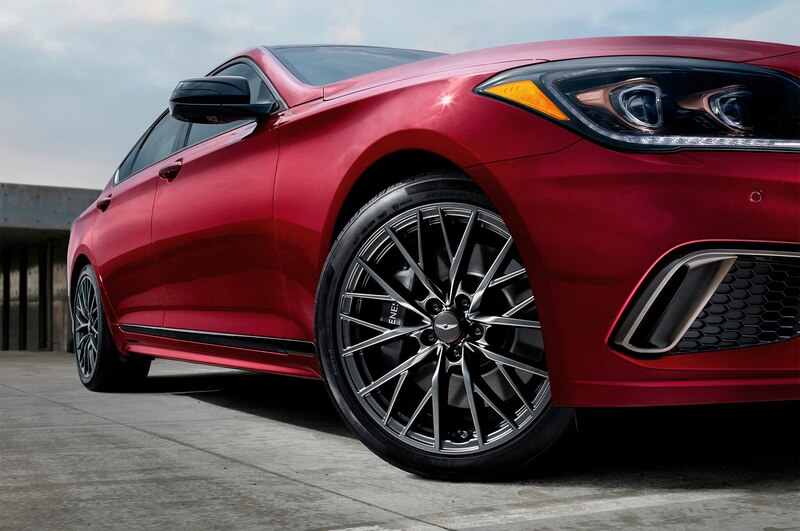 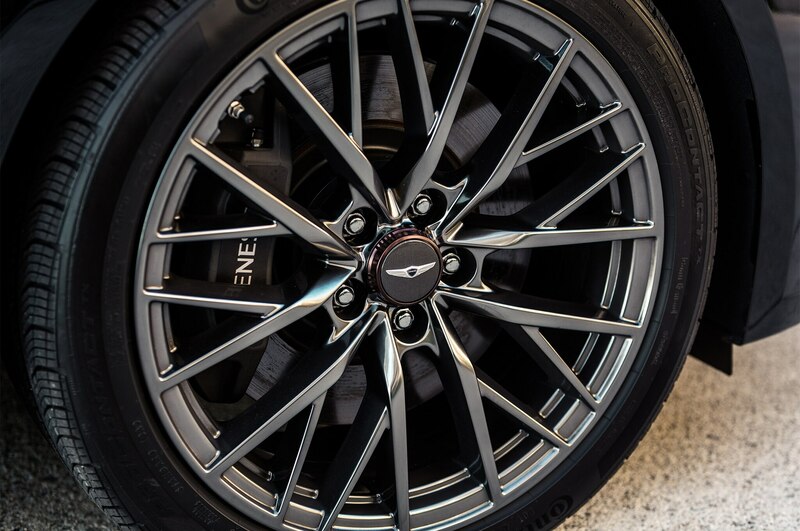 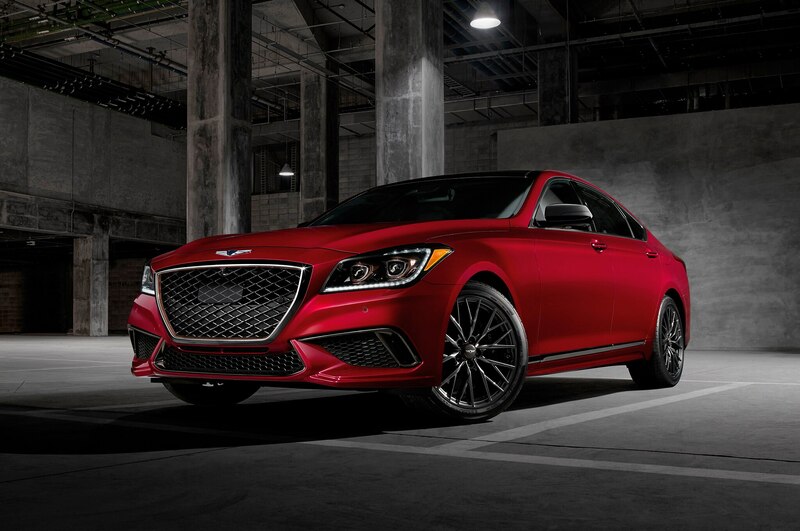 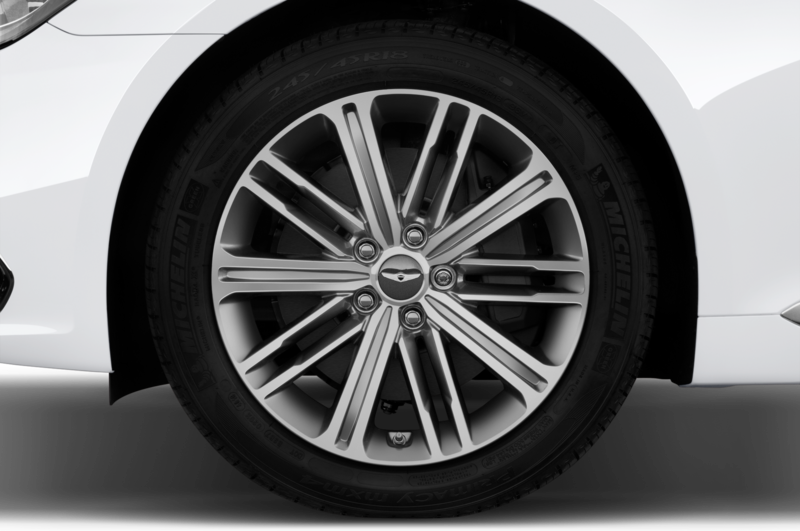 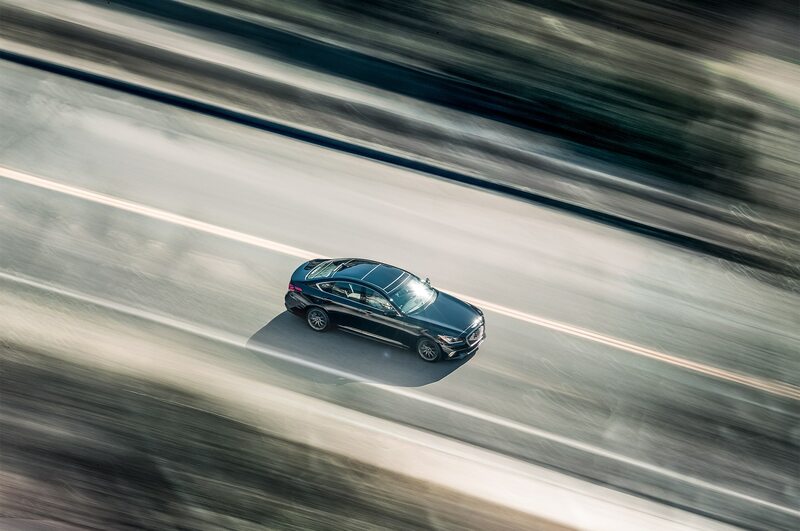 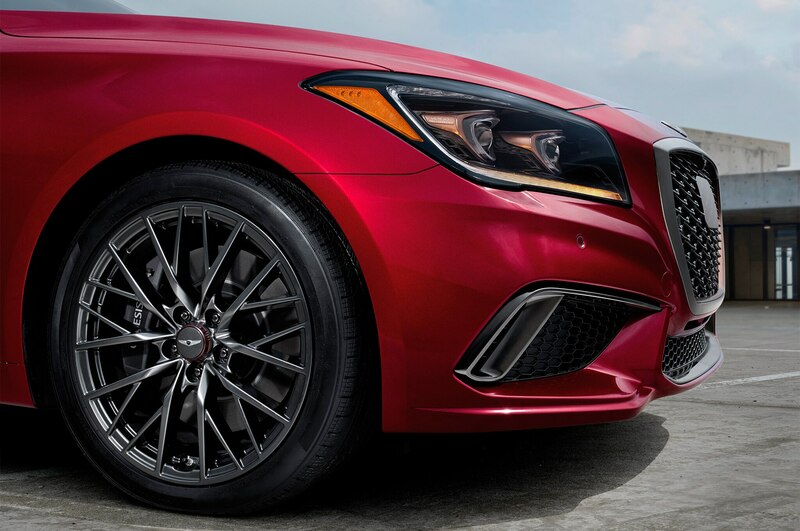 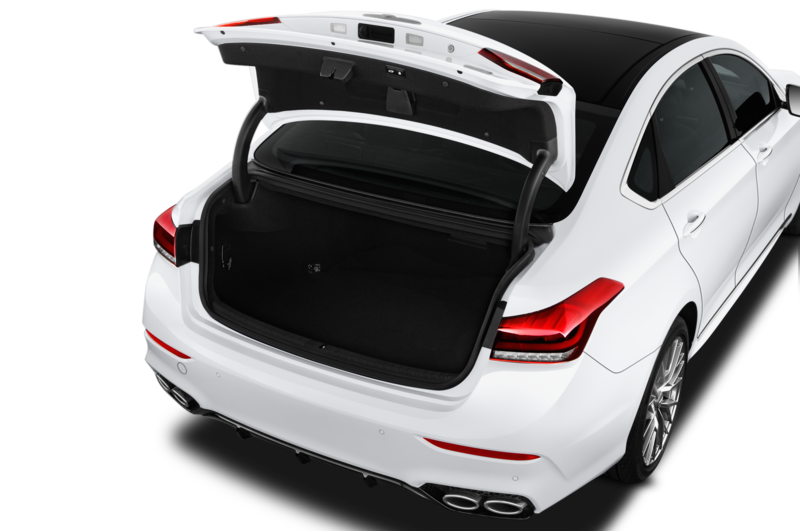 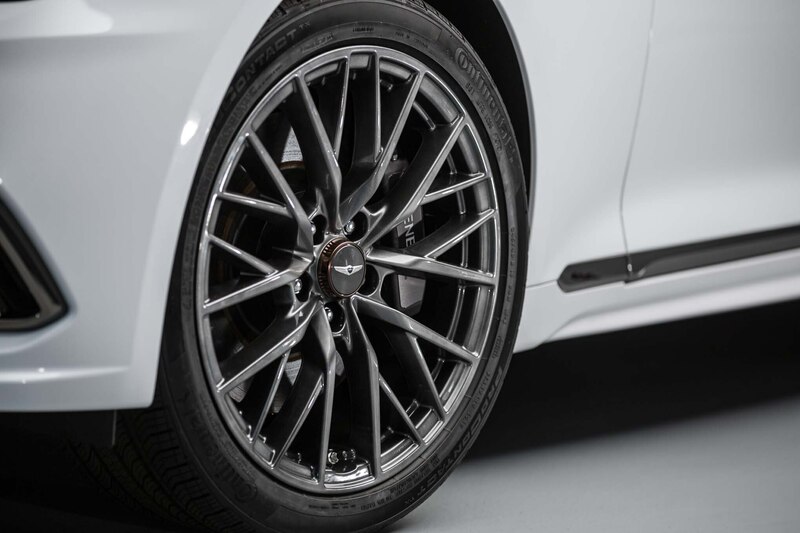 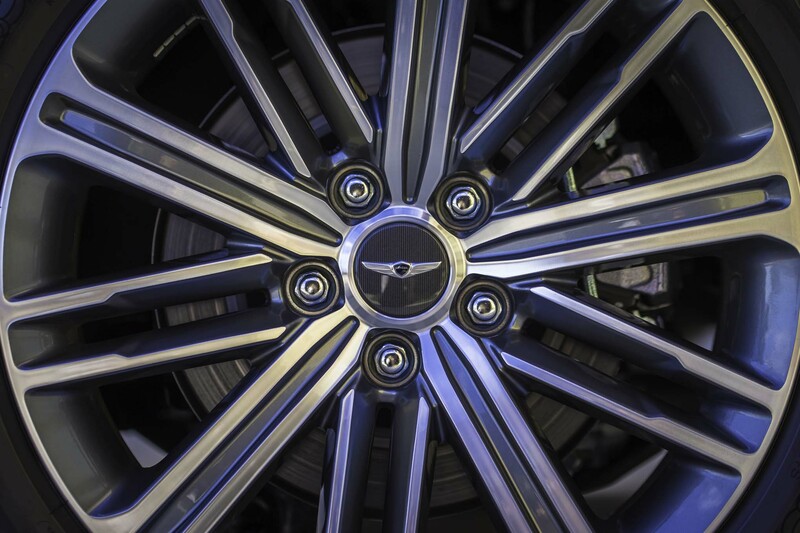 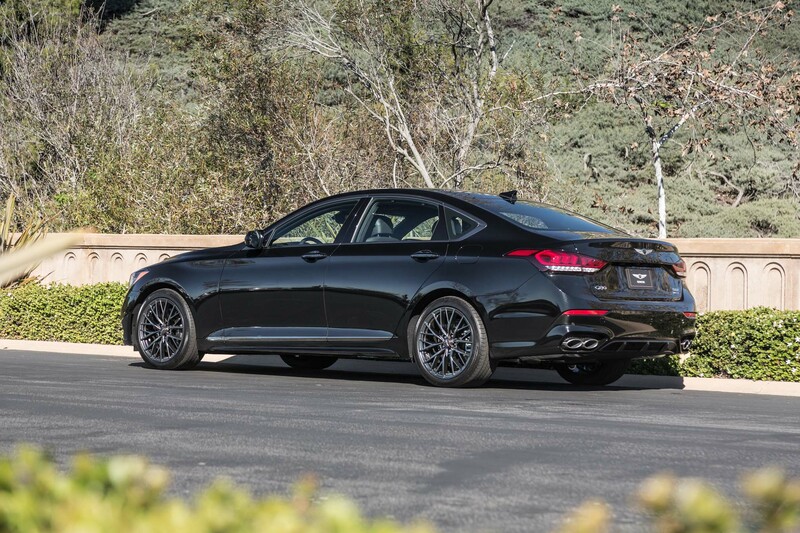 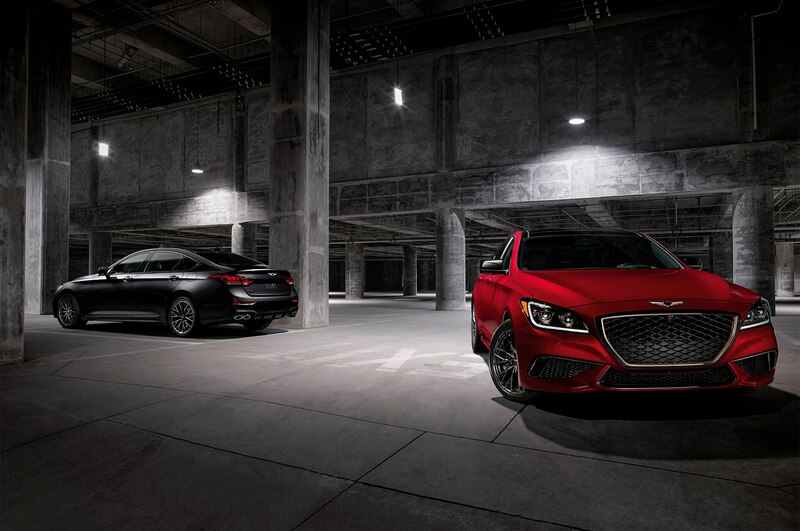 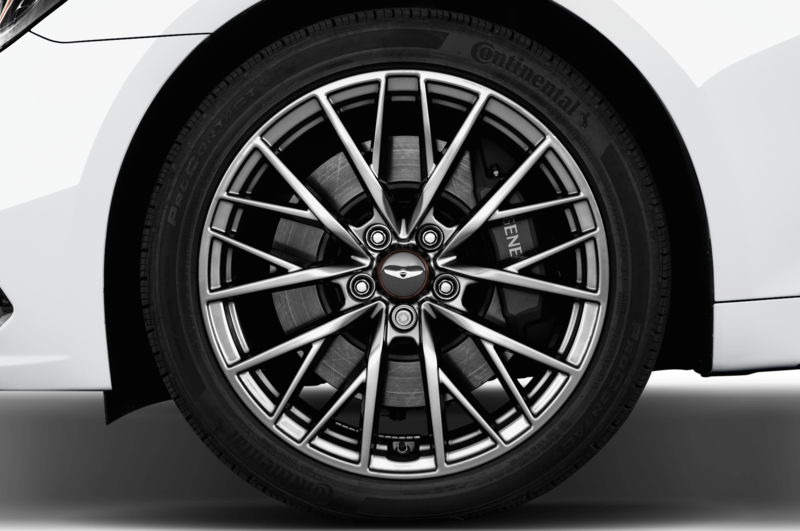 The G80 Sport also gets stiffer springs, continuously adjustable dampers (previously an option on the ’15 Genesis, now exclusive to the Sport), larger rear brakes, high-temp front brake pads, front-brake cooling ducts, and slightly lighter wheels (1.1-lb per corner). 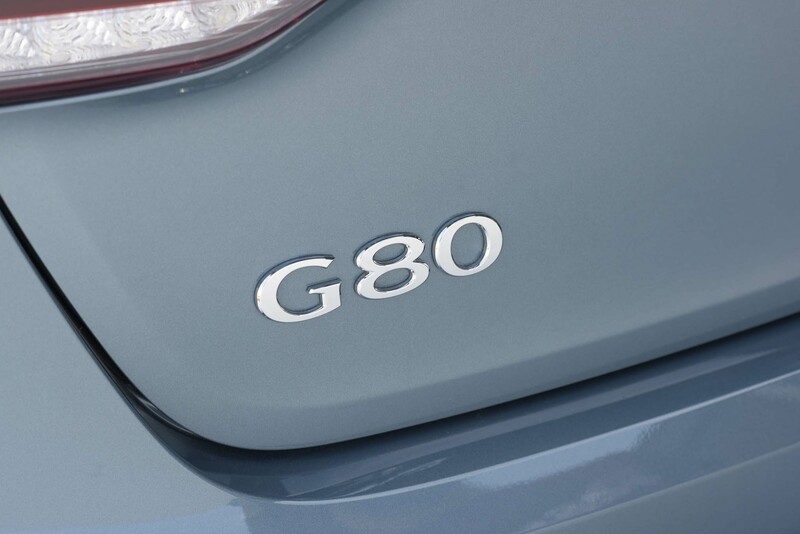 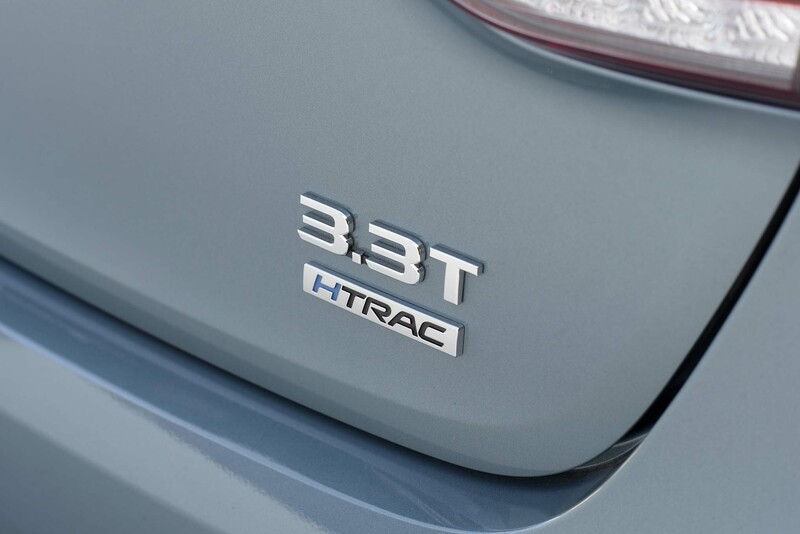 As with other G80 models, rear-wheel-drive is standard and all-wheel-drive is optional. 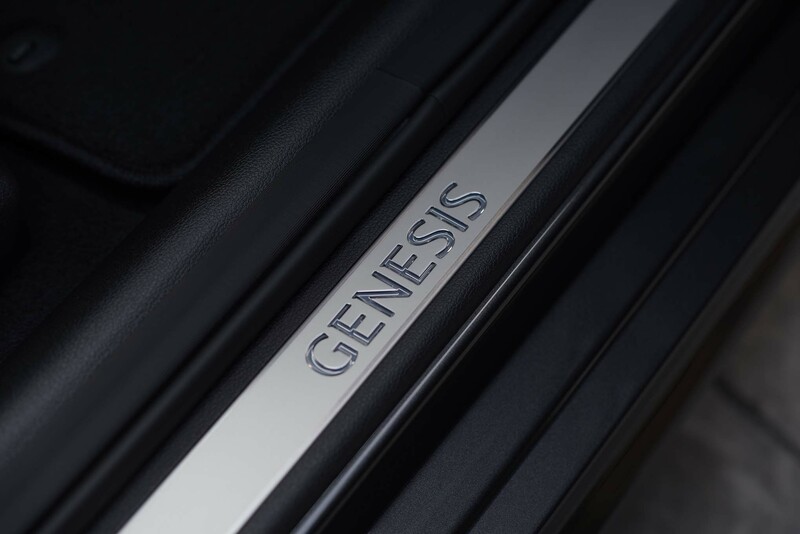 Ask the Genesis team and they’ll tell you that design is just as important as hardware. 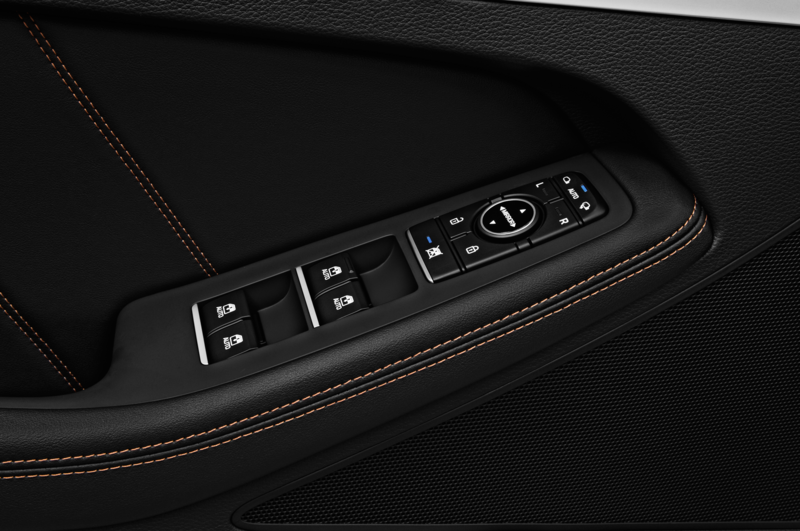 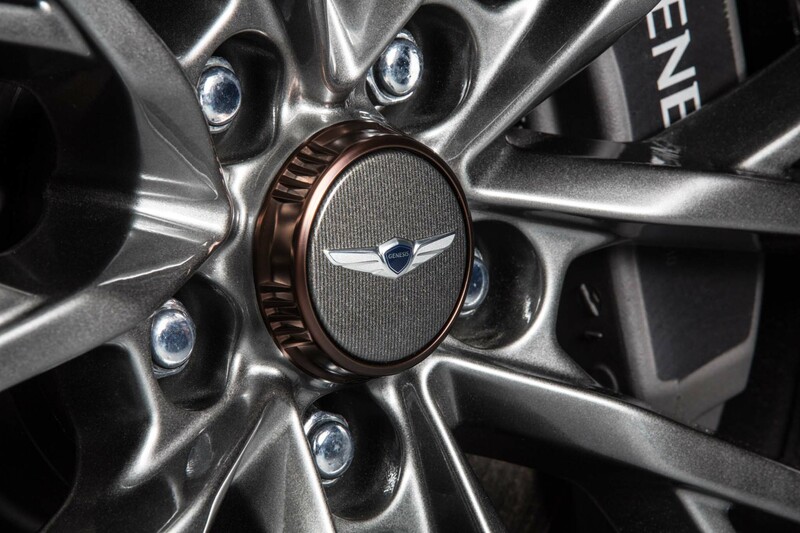 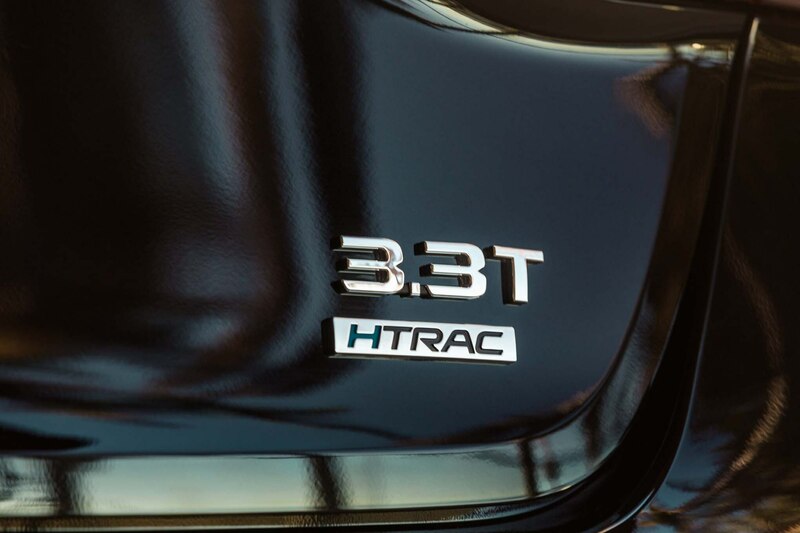 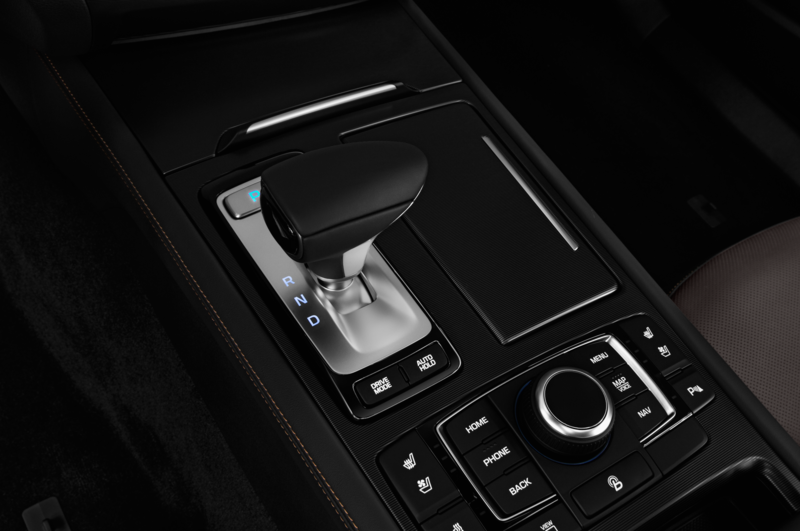 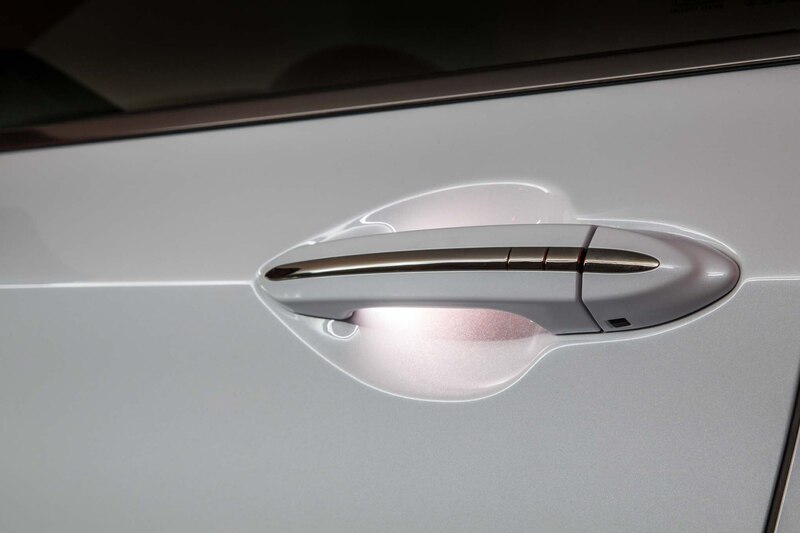 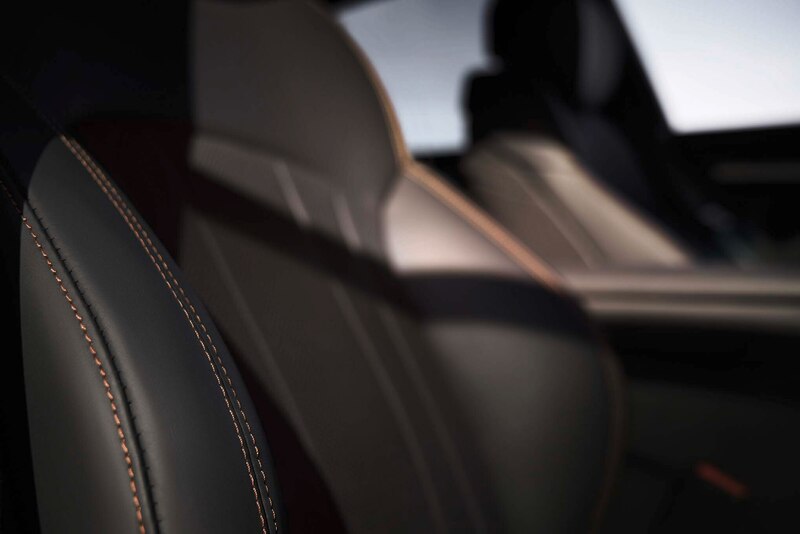 They’ve picked copper as the pigment of performance: The 3.3T Sport gets copper-colored stitching throughout the interior and copper accents around the body. 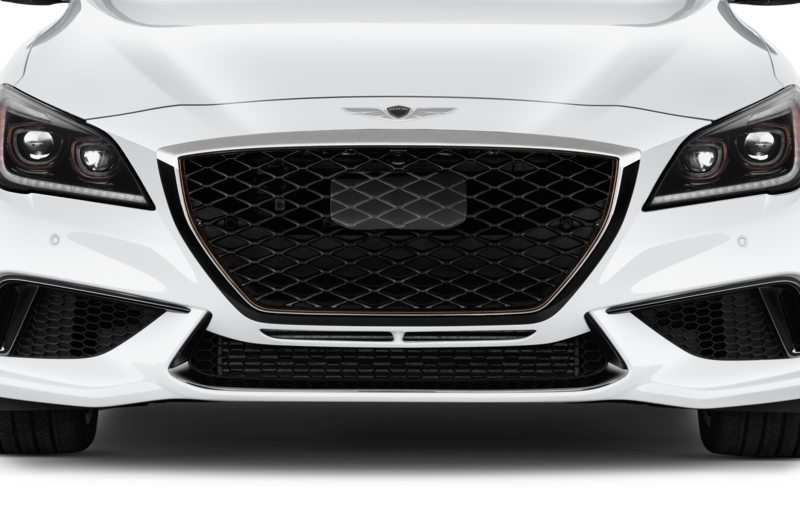 For the most part, it works, though I think the copper grille surround clashes with some of the paint colors. 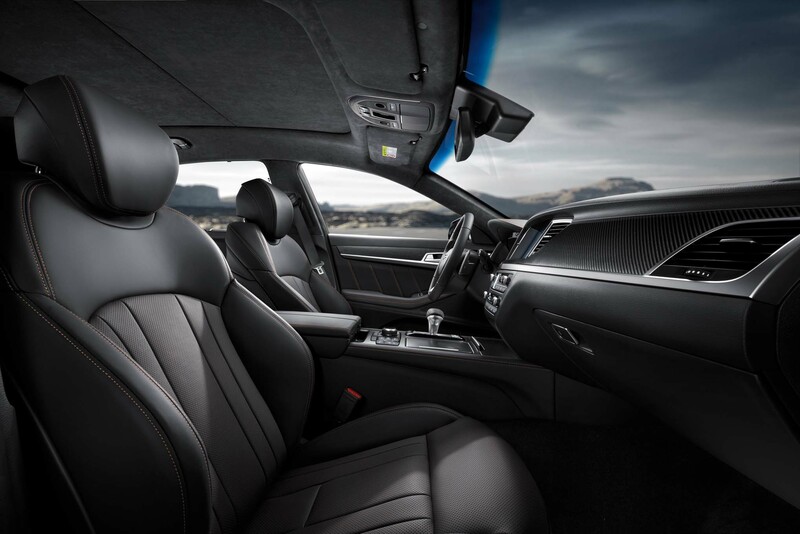 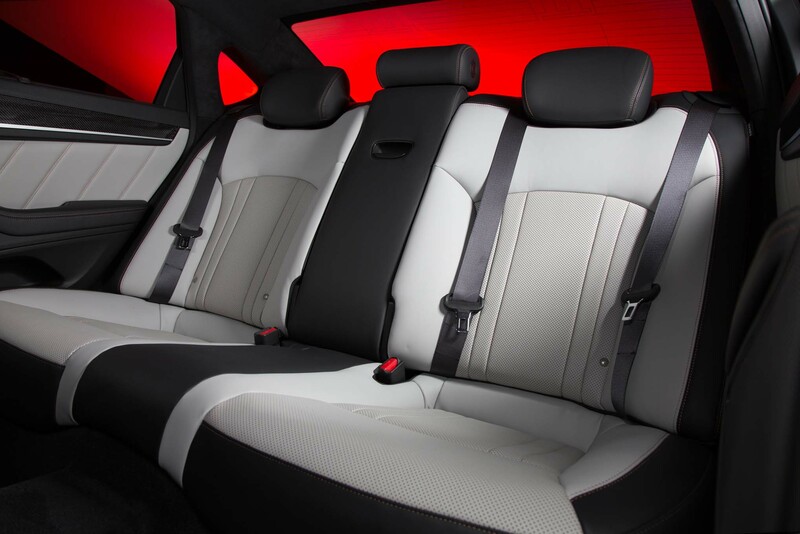 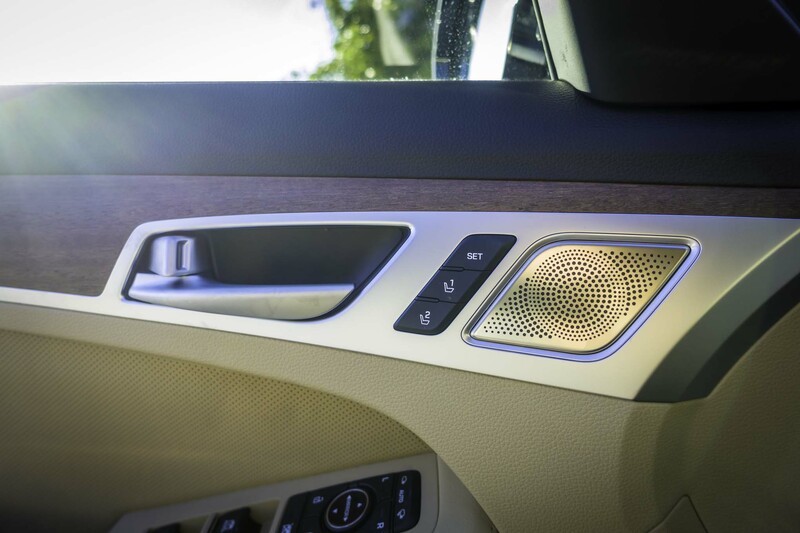 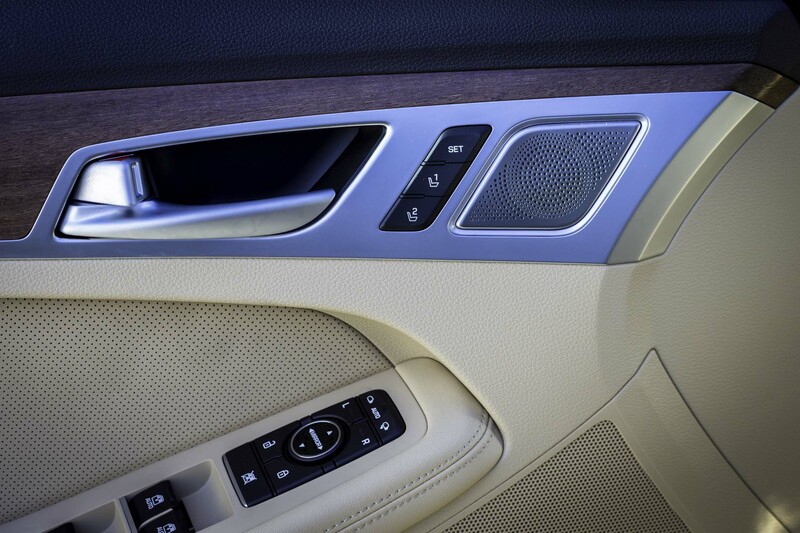 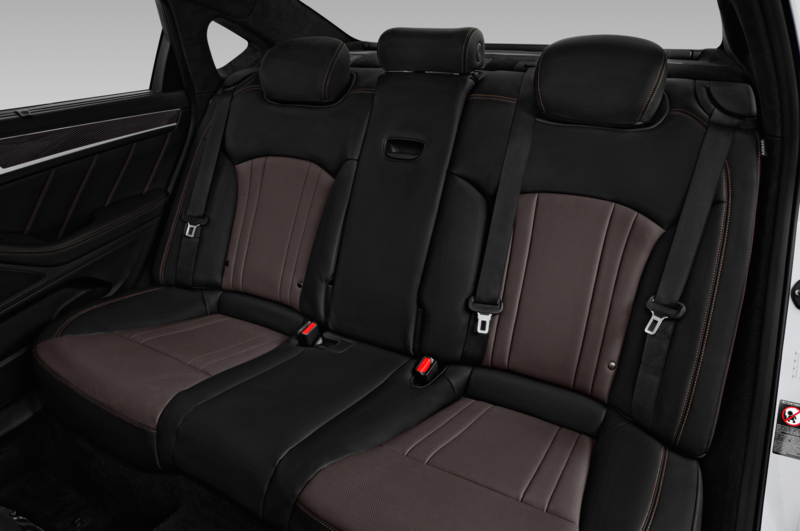 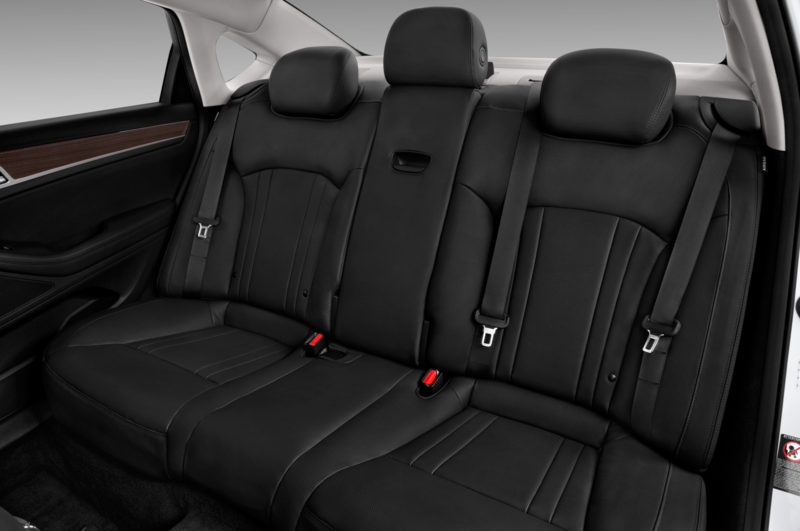 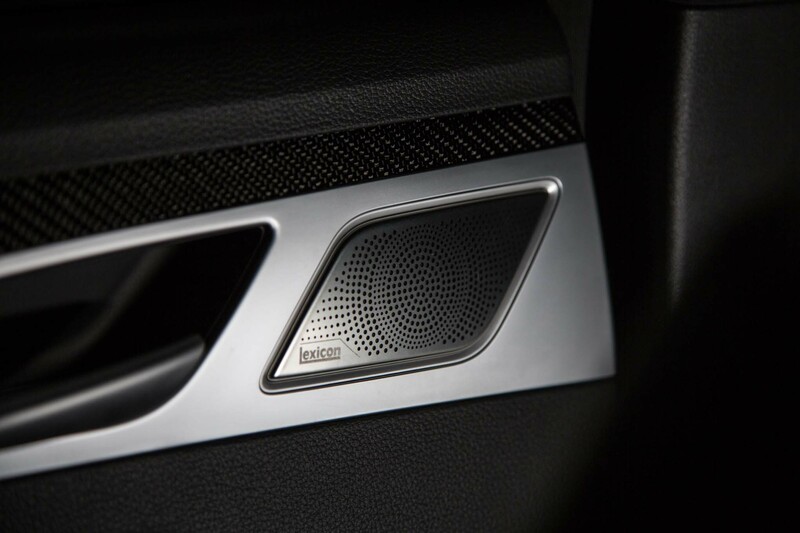 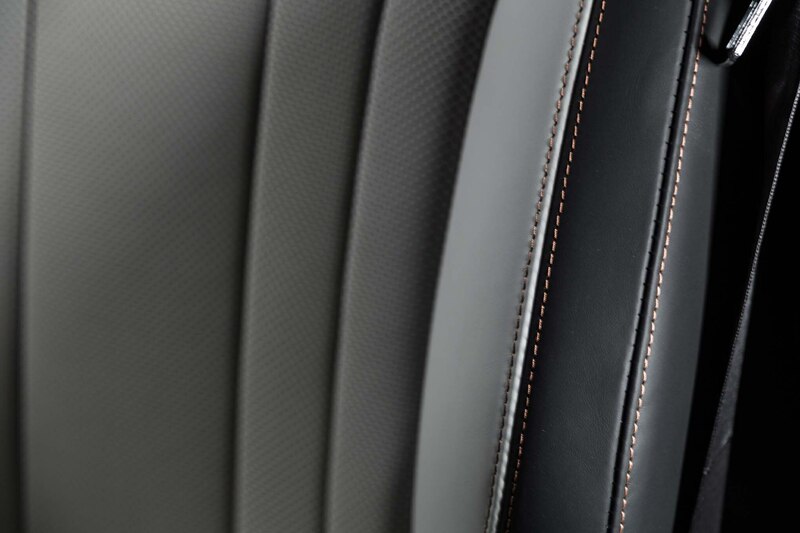 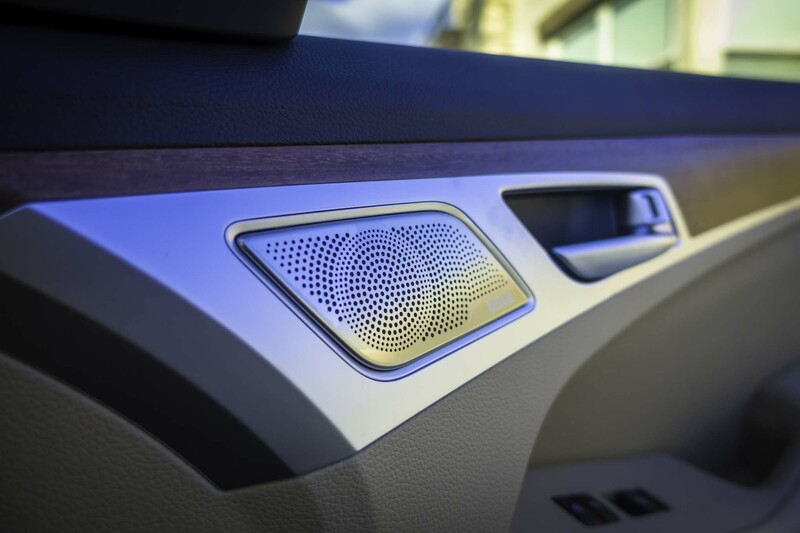 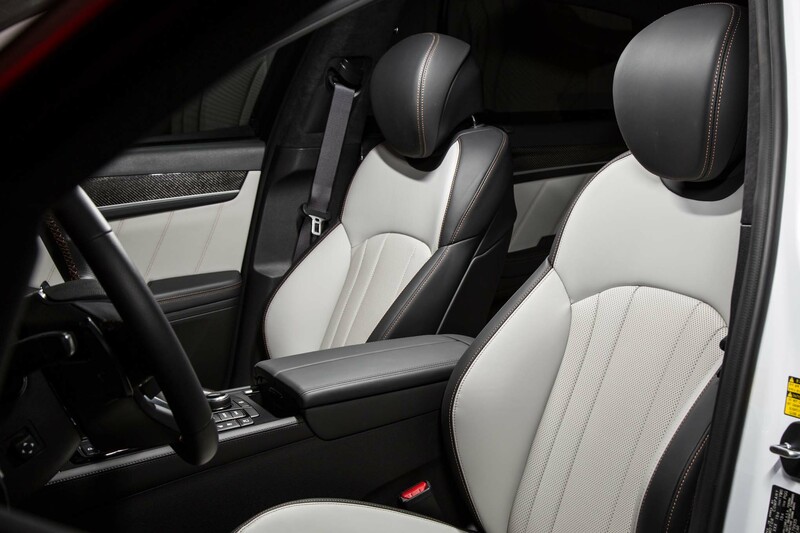 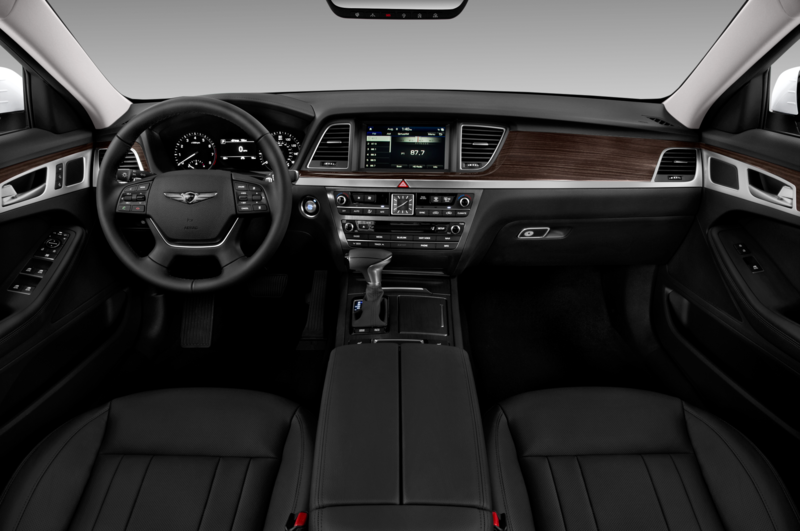 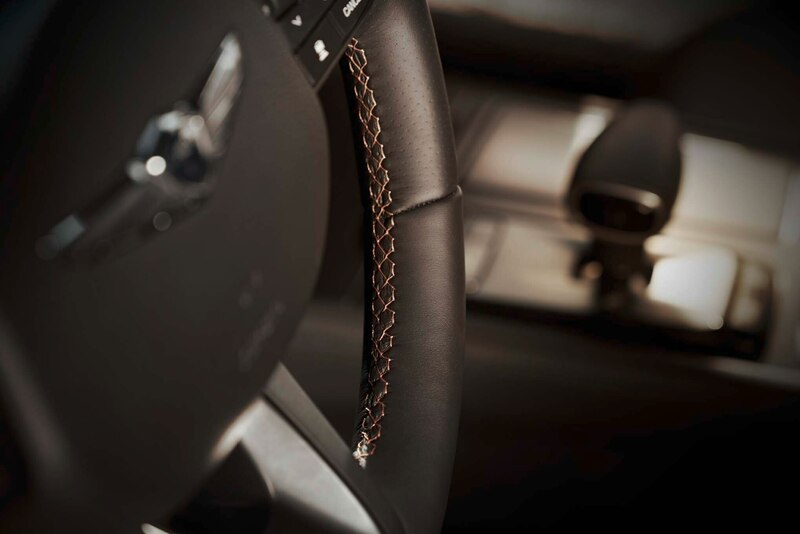 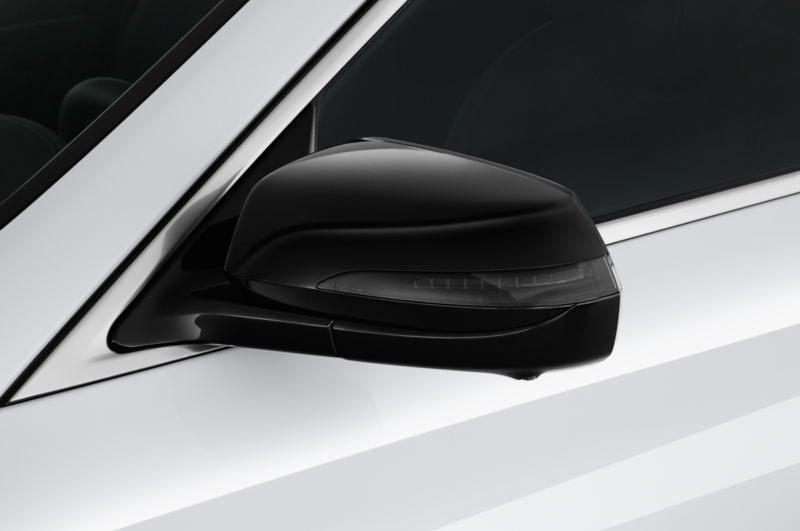 The cabin features carbon fiber trim and a suede headliner. 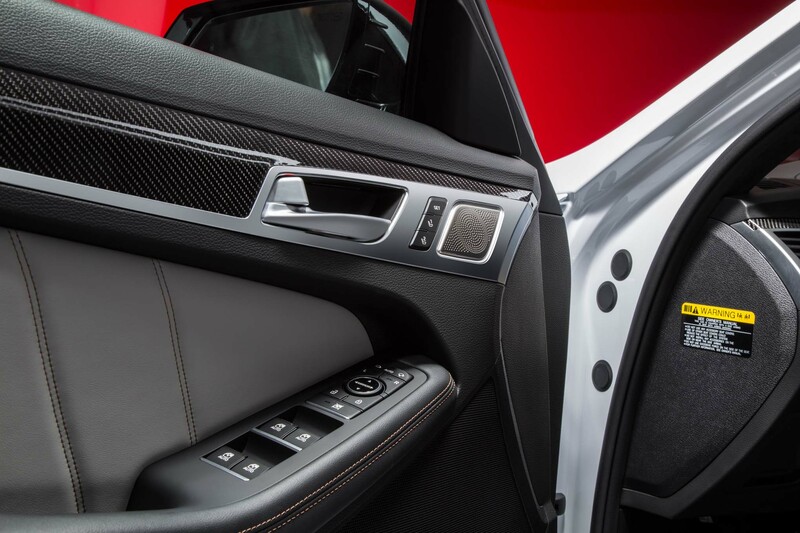 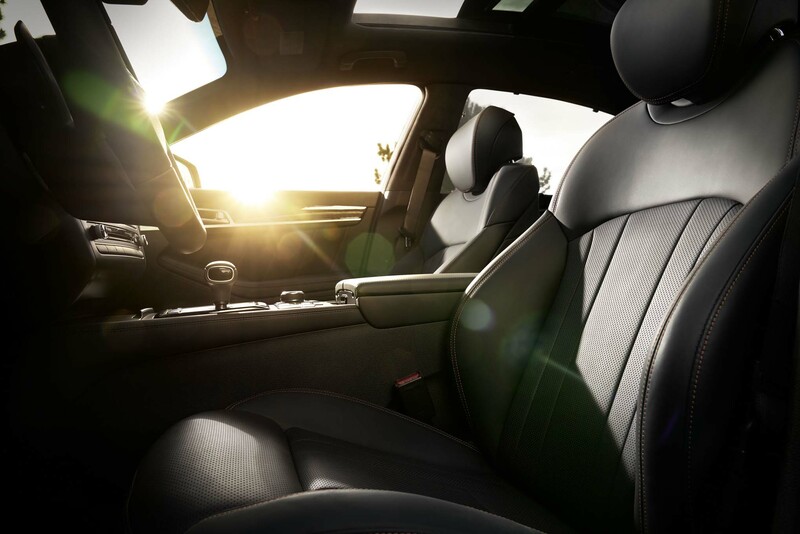 Interior fit-and-finish superlative — as good as it gets in a mass-produced car. 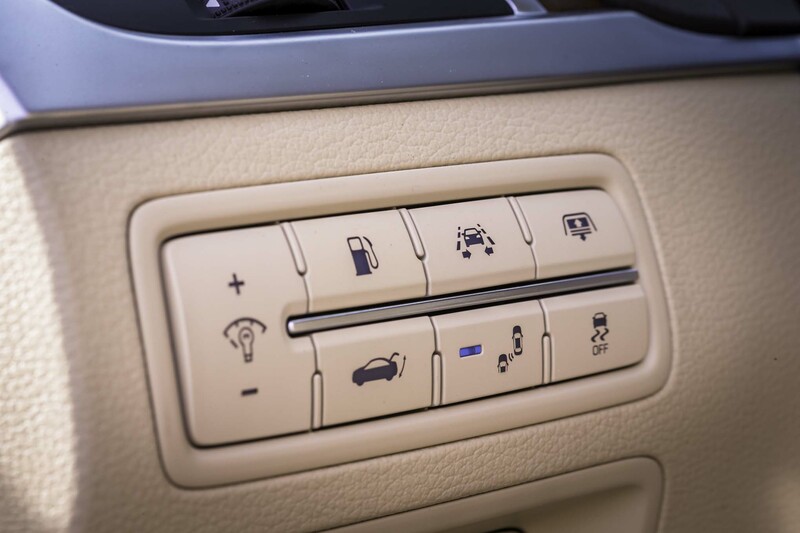 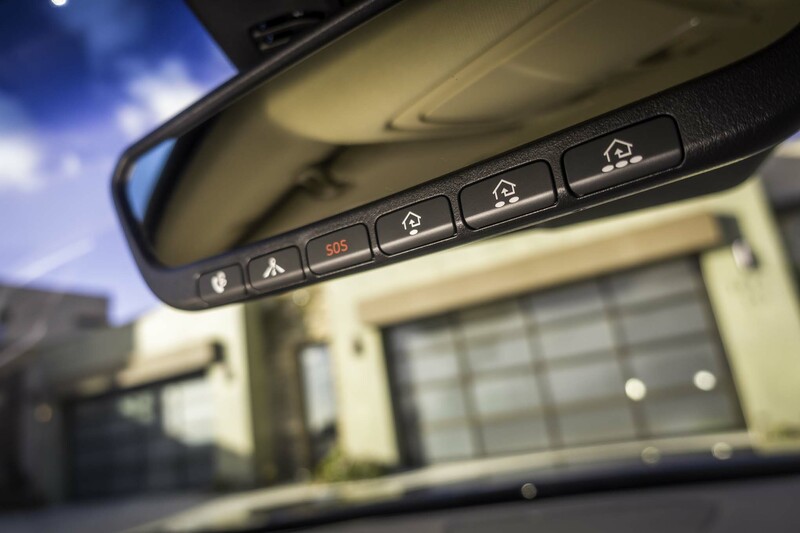 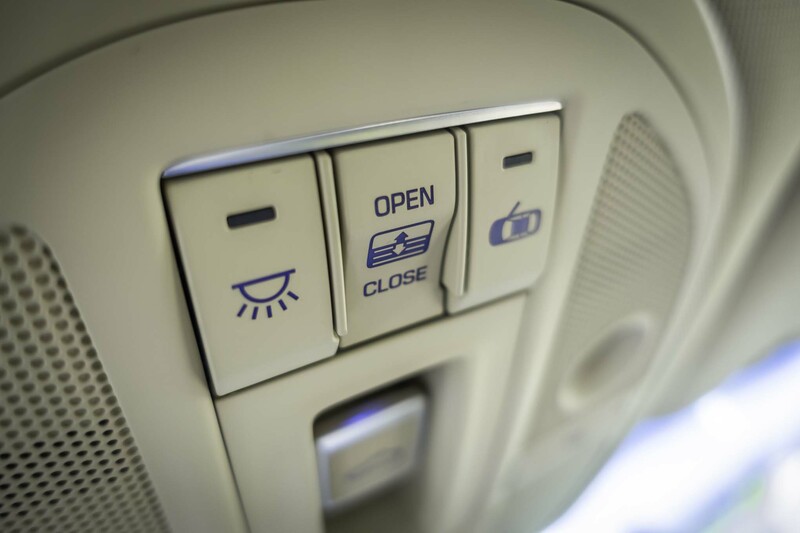 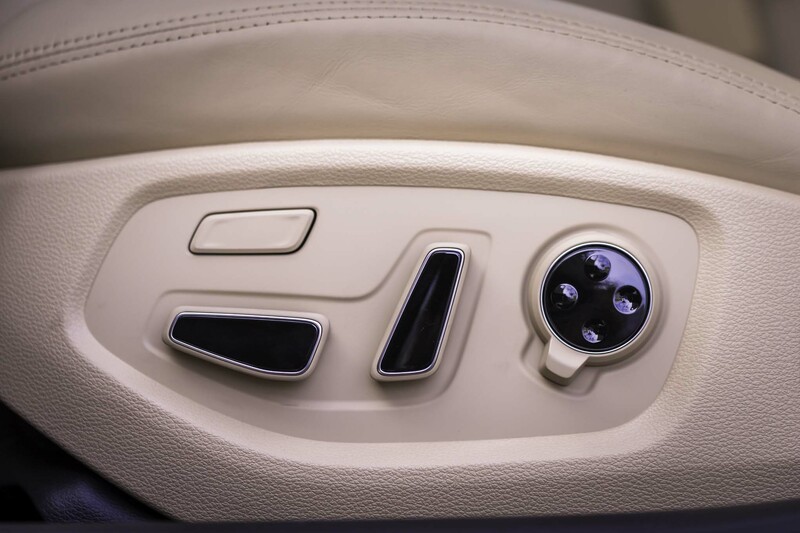 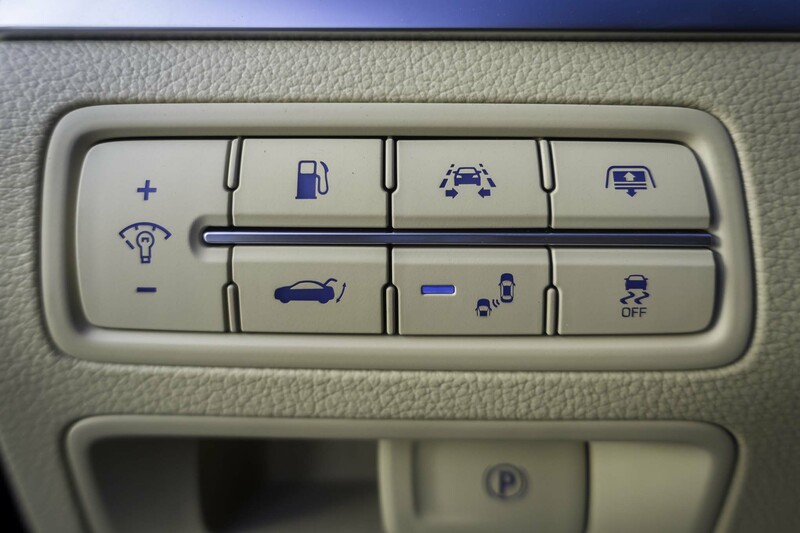 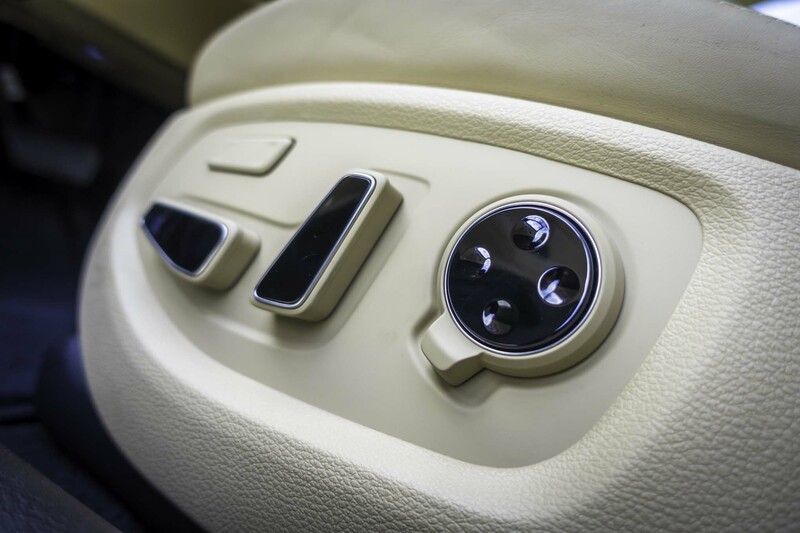 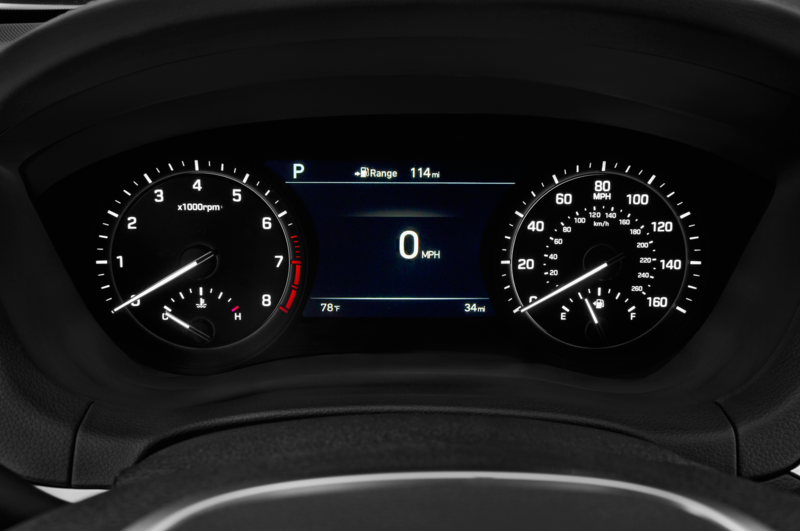 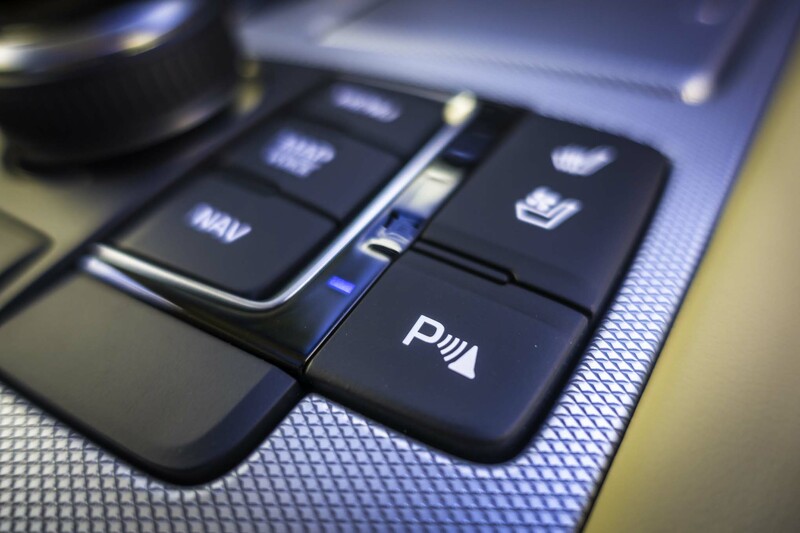 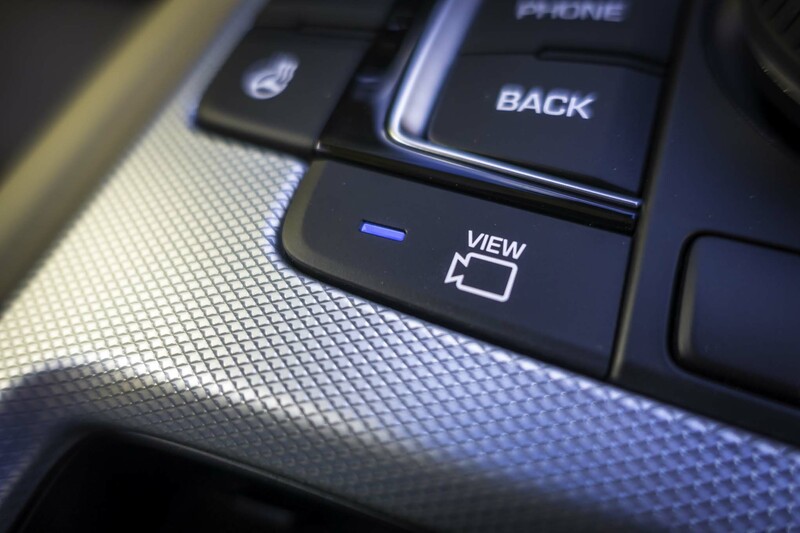 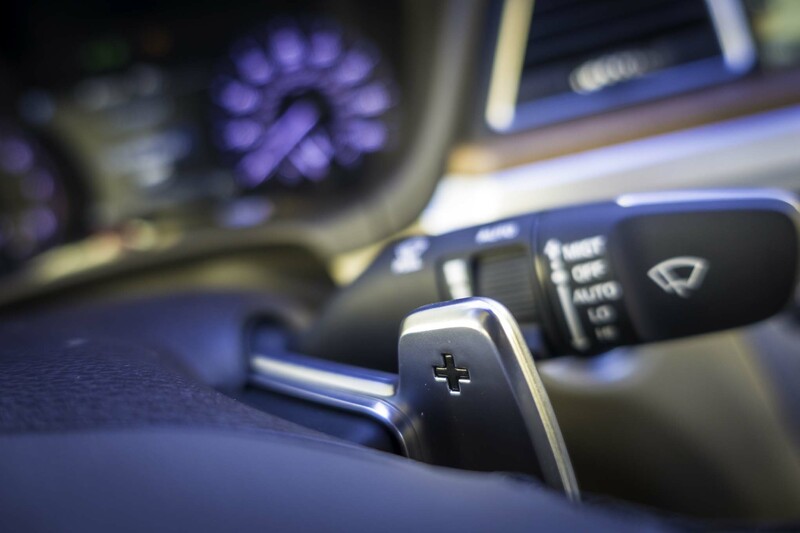 A single drive-mode switch with Eco, Normal and Sport modes controls the shocks, shift schedule, steering feel and engine acoustics. 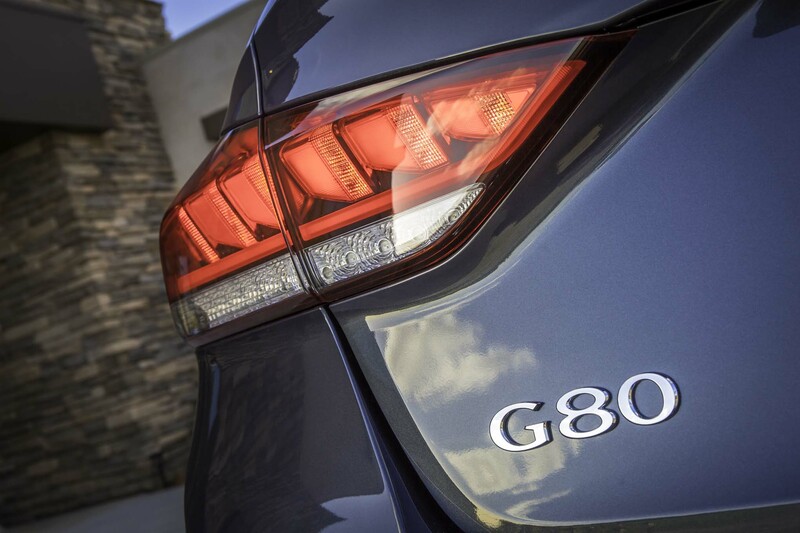 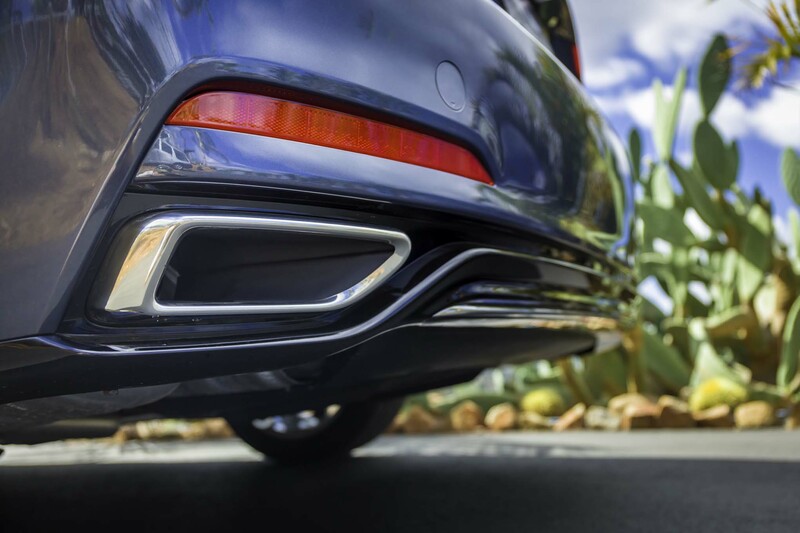 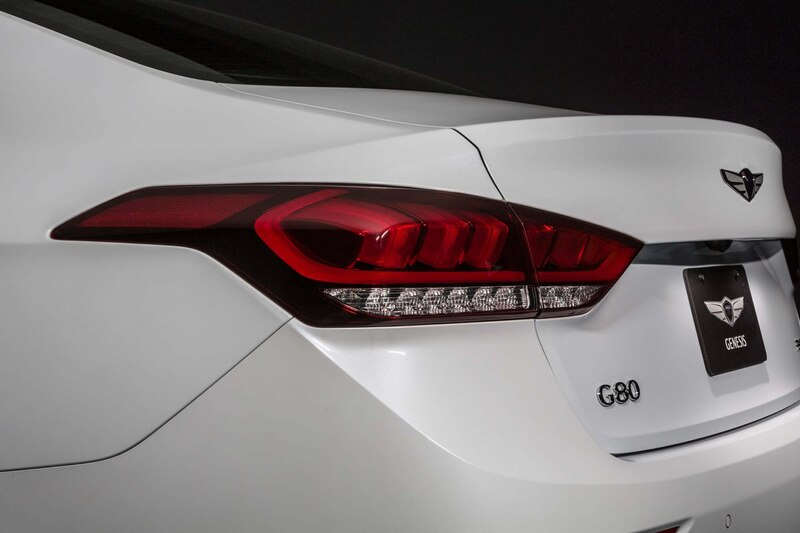 In Normal mode, the G80 Sport’s ride is noticeably firmer than the regular G80, but it still floats gently over bumps. 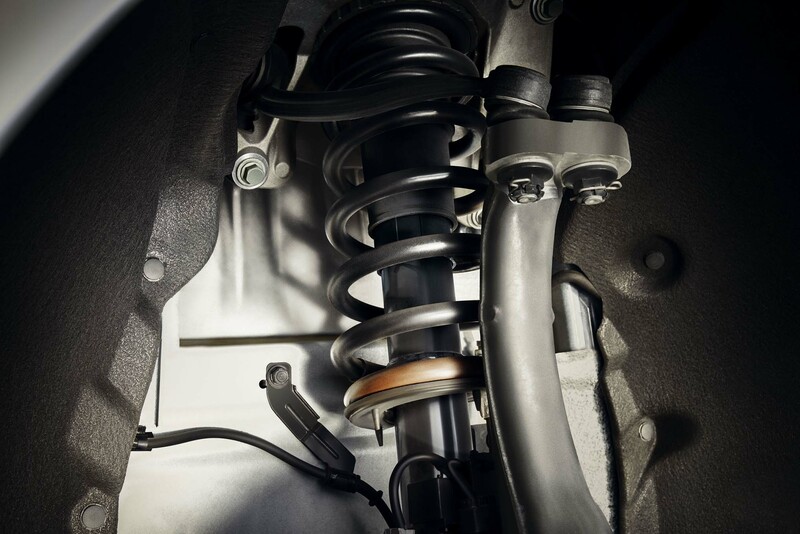 Select Sport mode and the shocks tighten their grip, the float goes away, and body motions are arrested gently but firmly. 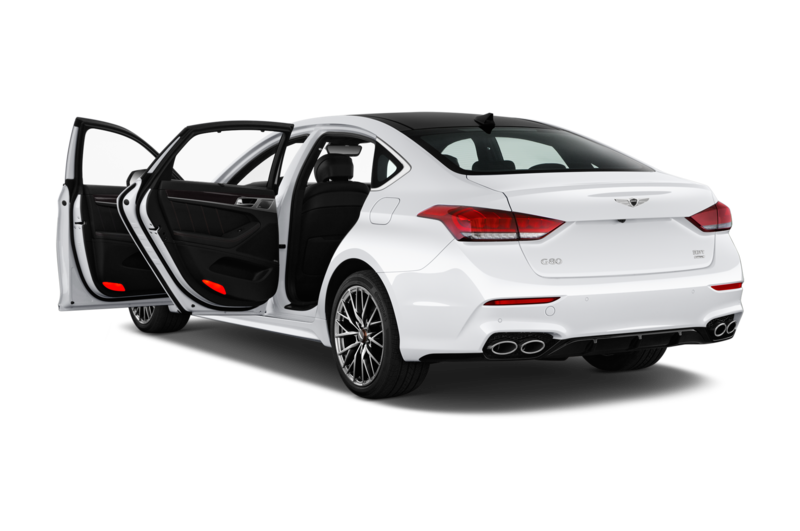 I can’t count the number of cars with adjustable dampers where the sport setting did nothing but make the ride slightly more jiggly, so I appreciate the narrow-yet-accurate focus. 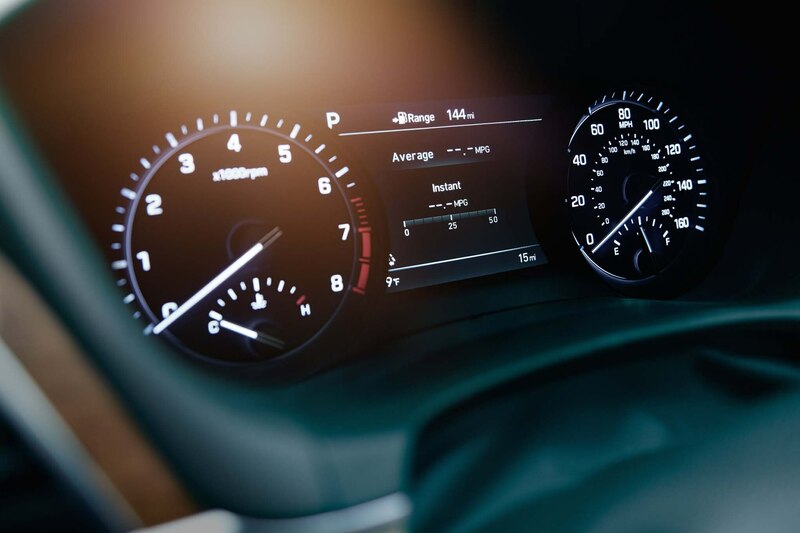 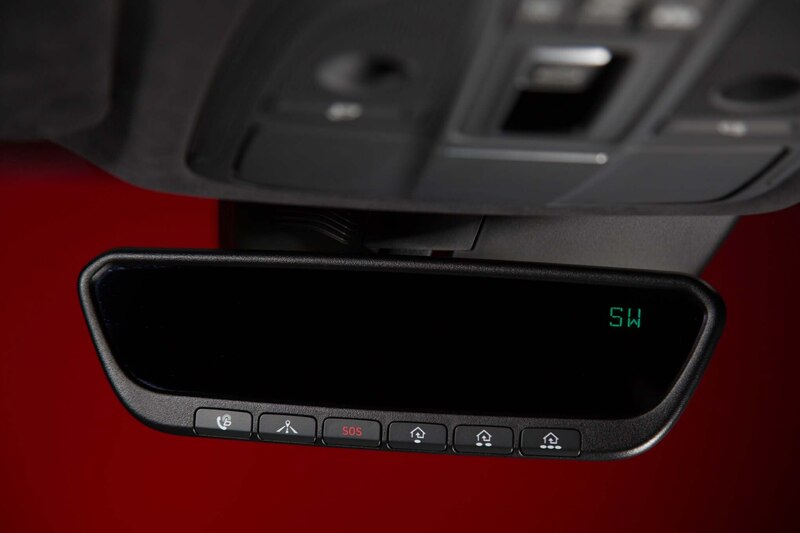 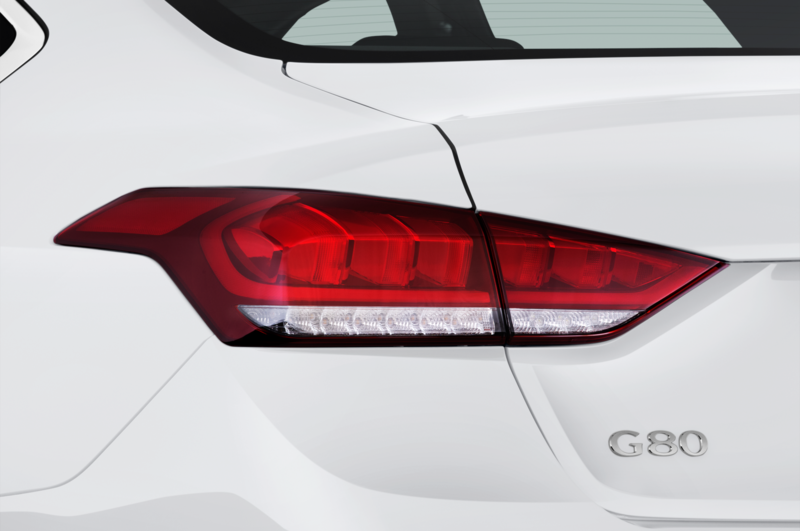 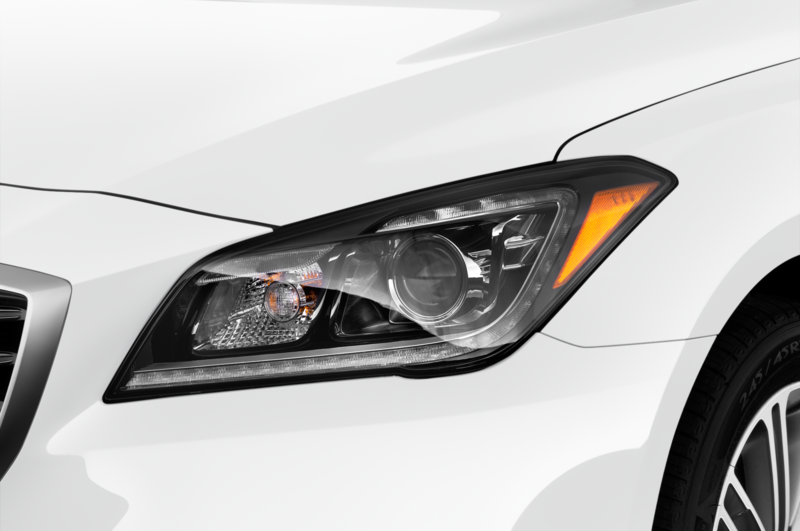 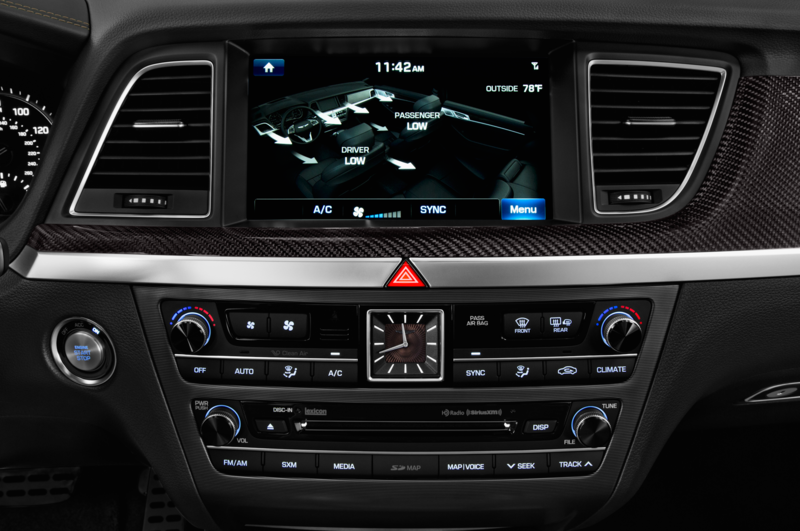 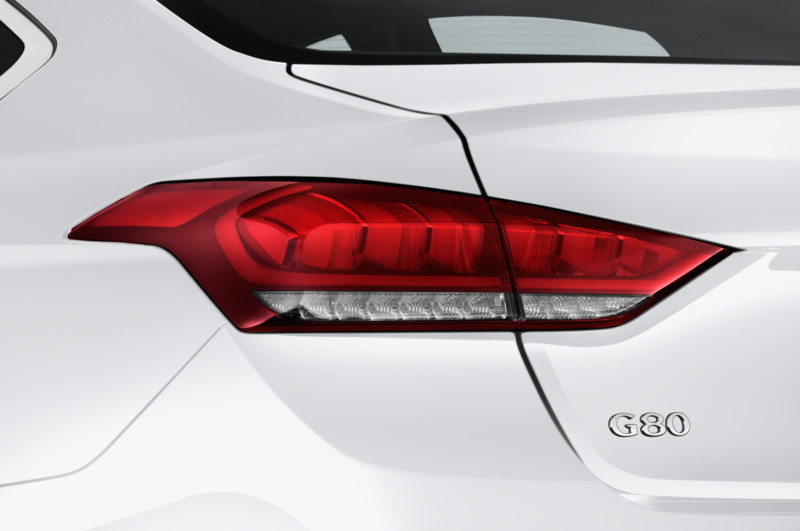 The G80 Sport is no Miata, but it tracks through the turns comfortably, quickly and accurately. 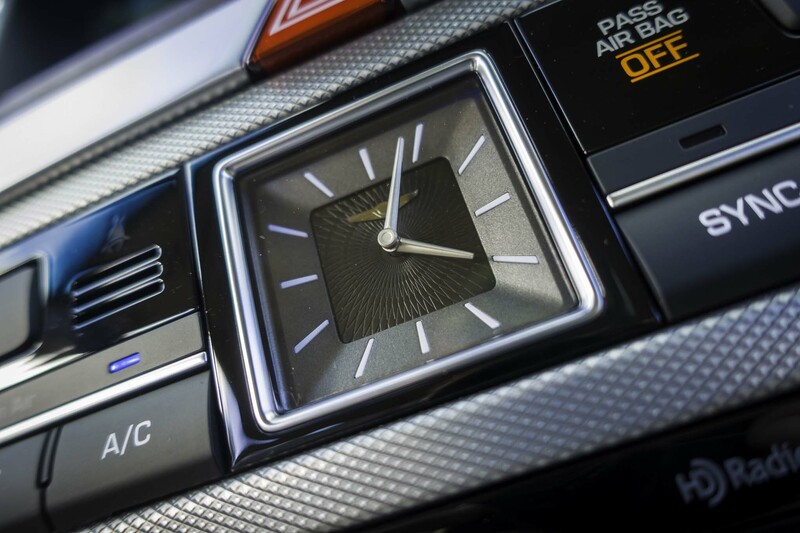 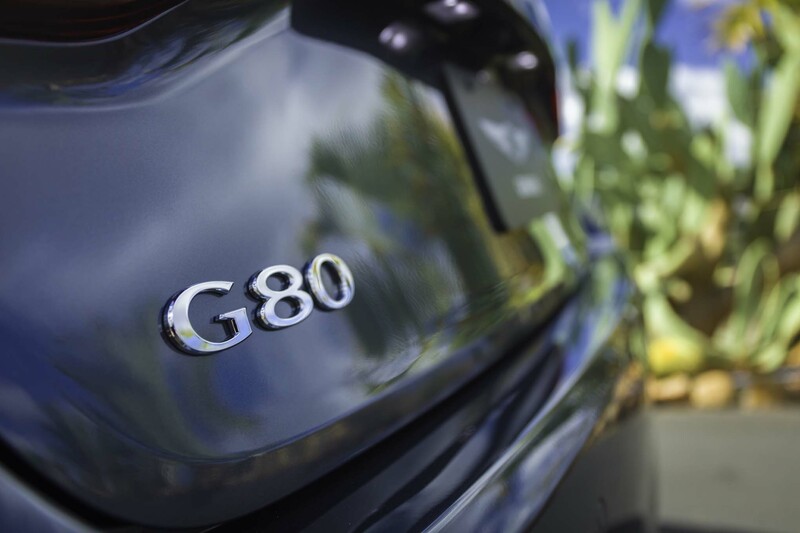 it part- or full-throttle, the G80 was ready. 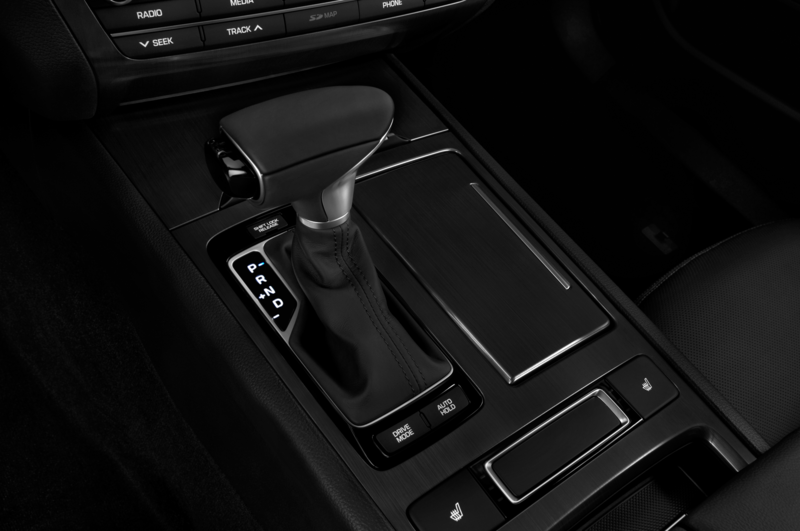 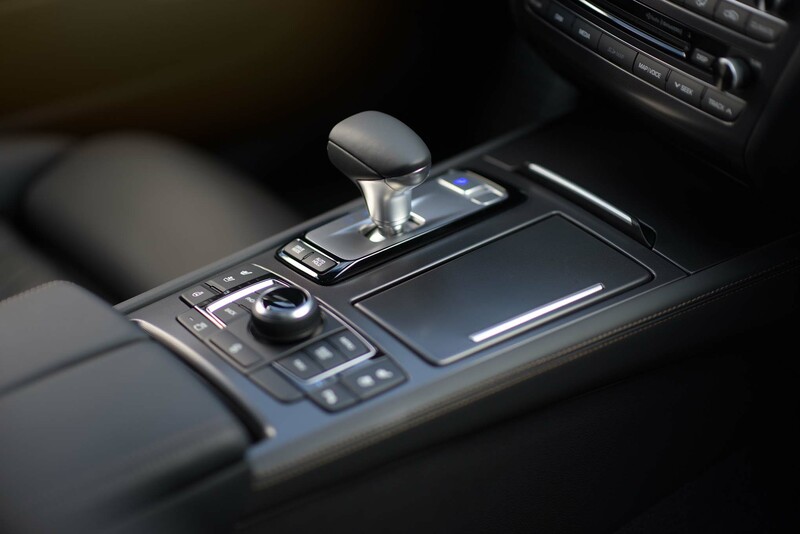 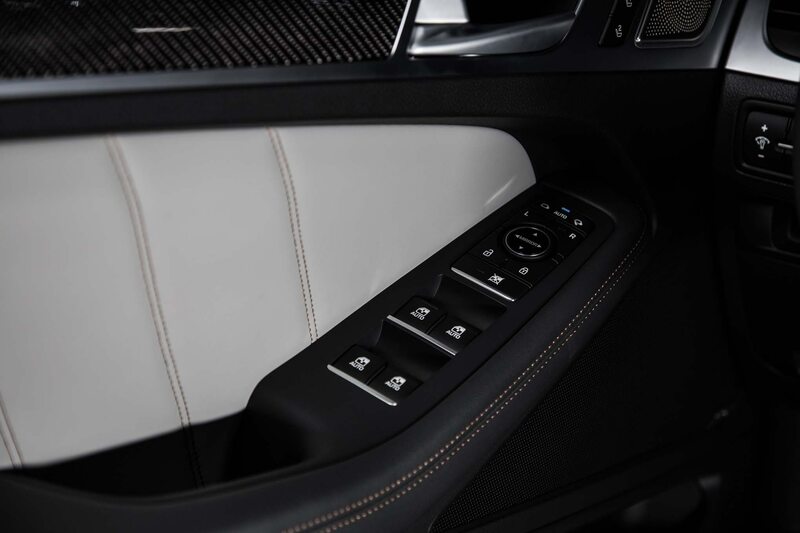 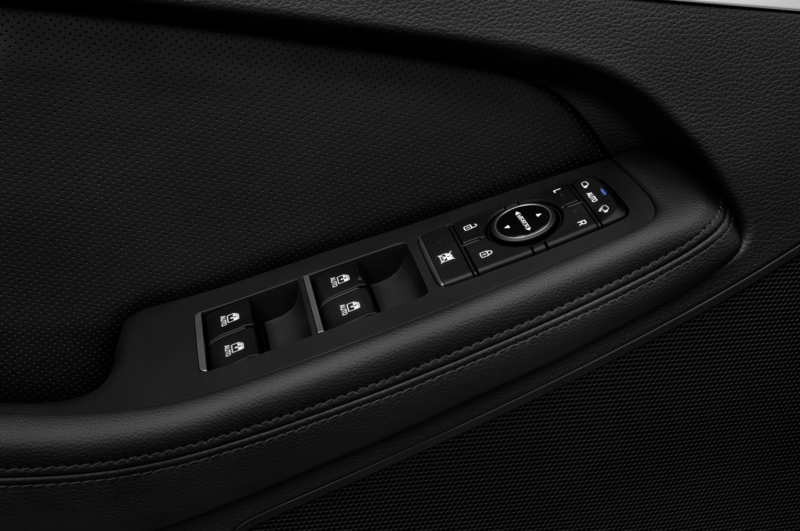 Unfortunately, I did notice the shift paddles, which are made of plastic instead of metal, as you’d expect in a premium offering. All in all, the G80 3.3T Sport is an exceptionally pleasant car to drive, either fast or slow. 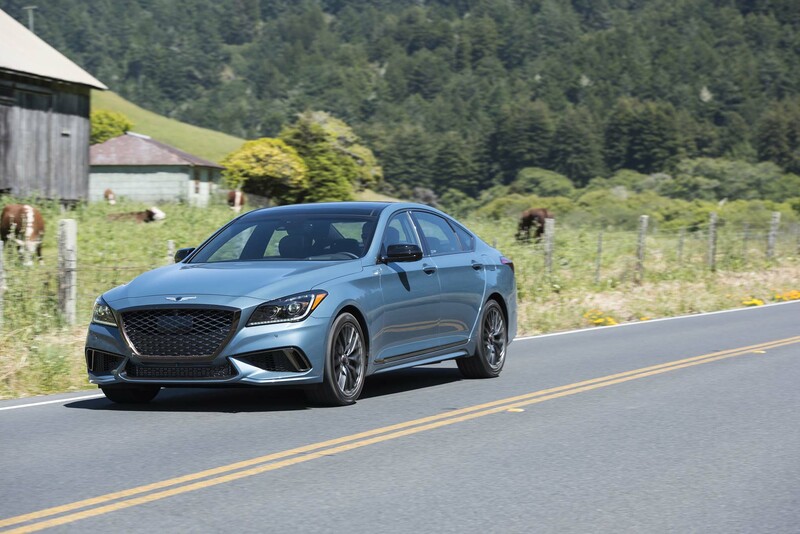 Not that it’s in danger of sidelining the BMW 5 Series or the Lexus GS F-Sport; it’s not a class-leading performer, but it is a competent performer, which is way more than I expected. And that’s fine. 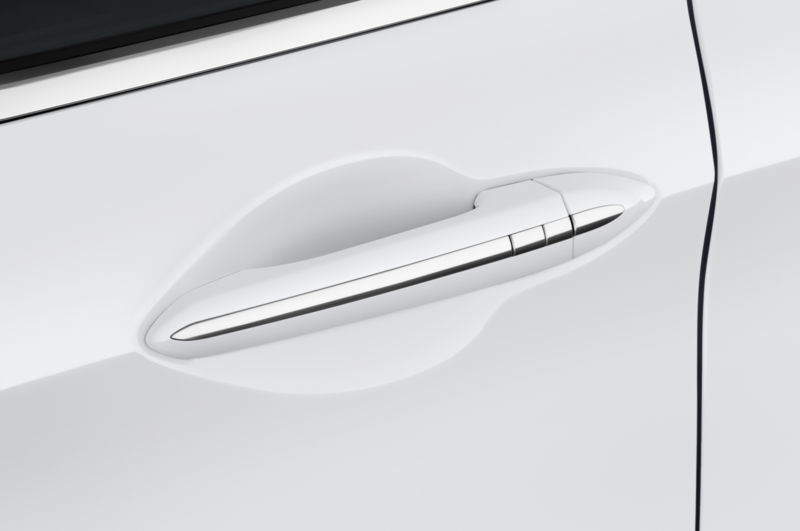 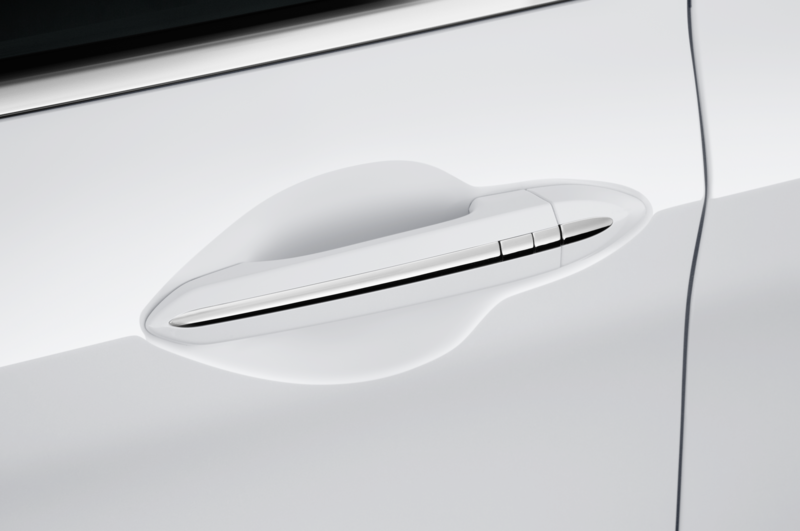 Let’s face it, save for the very young and very stupid, few drive a sport sedan balls-out on public roads. 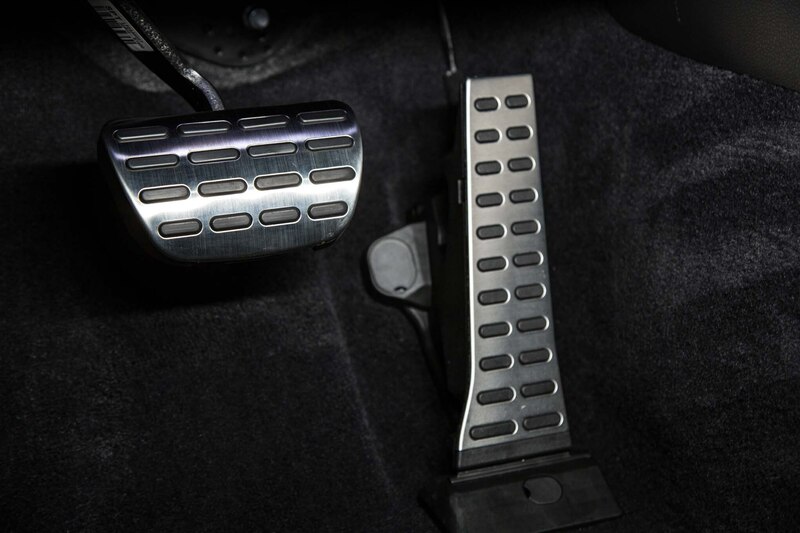 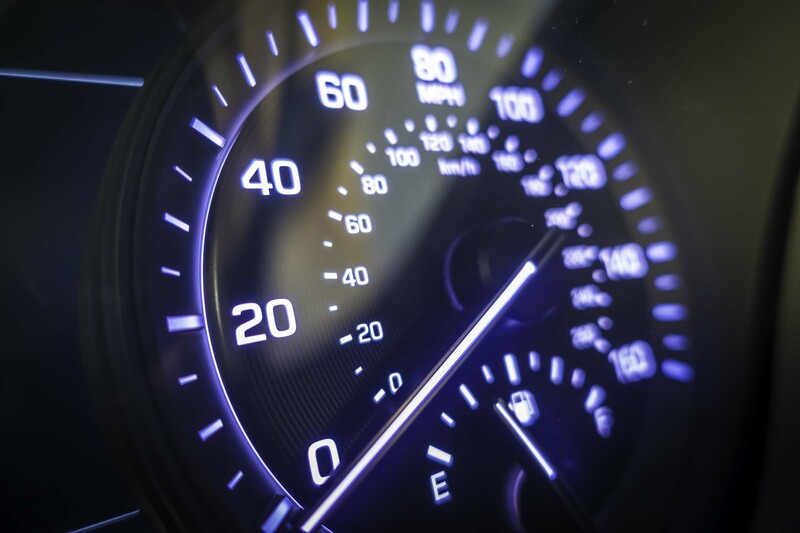 Some may dial speed up a notch or three, enough to get a bit of adrenaline and tire squeal, but not enough to frighten anyone or attract the attention of the local constabulary. 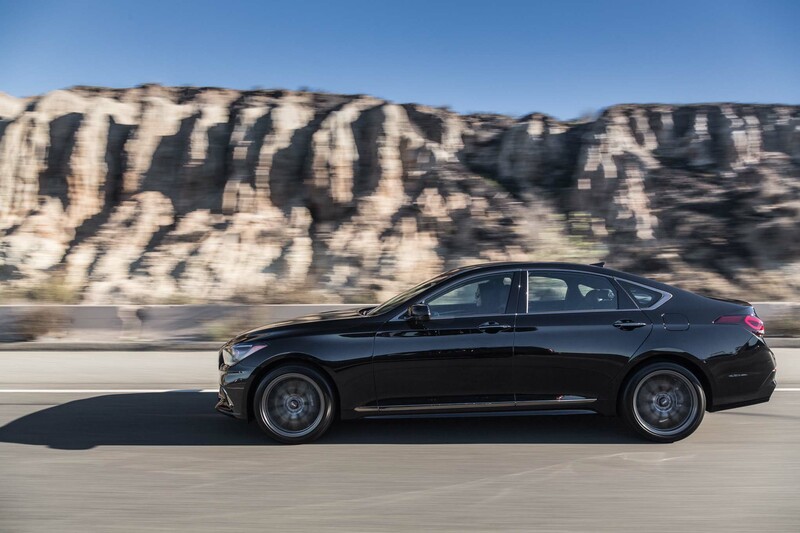 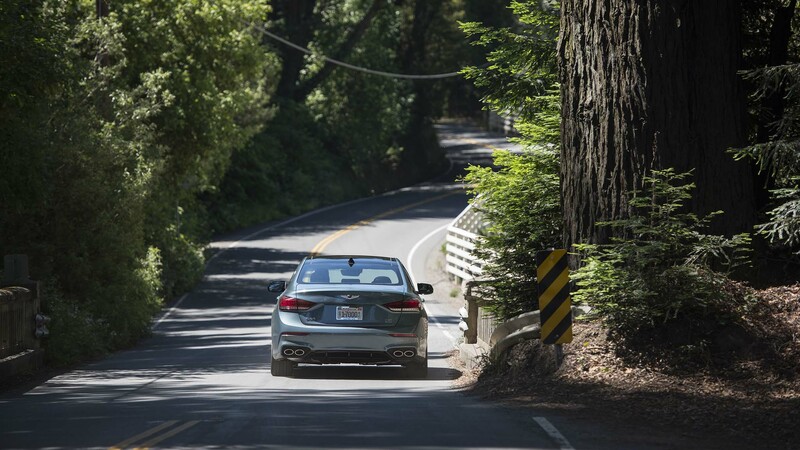 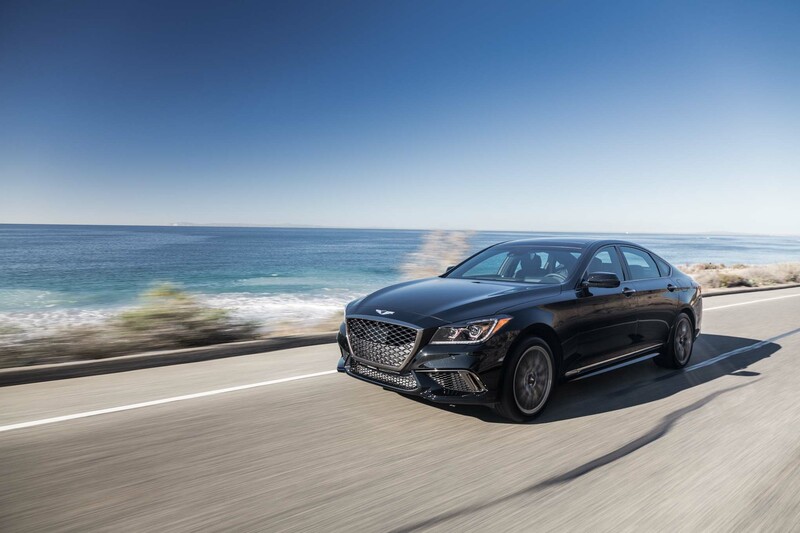 The Genesis G80 Sport is just right for that sort of driving. 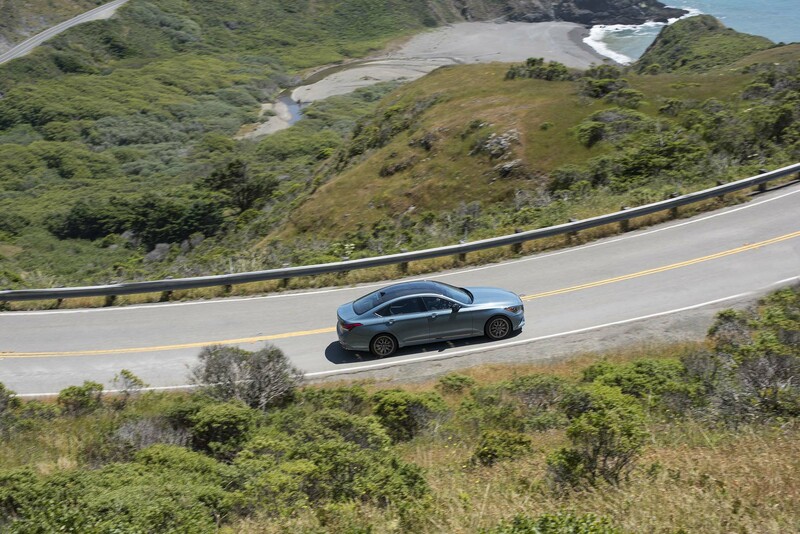 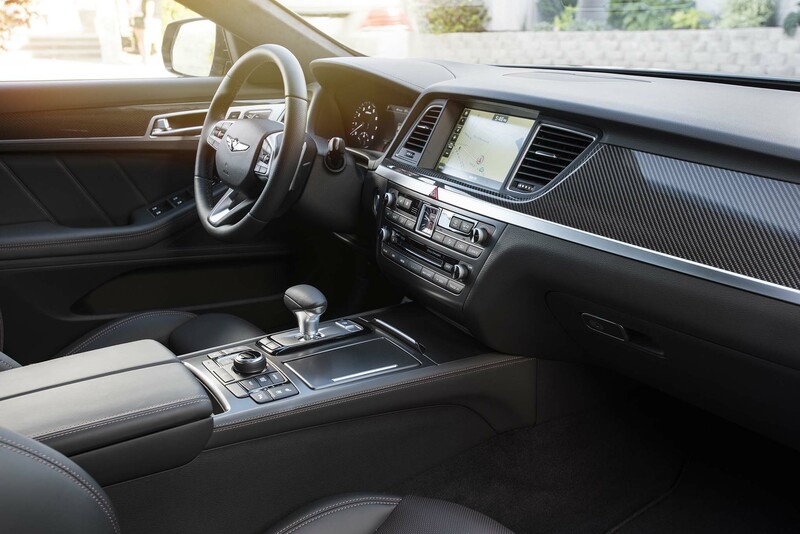 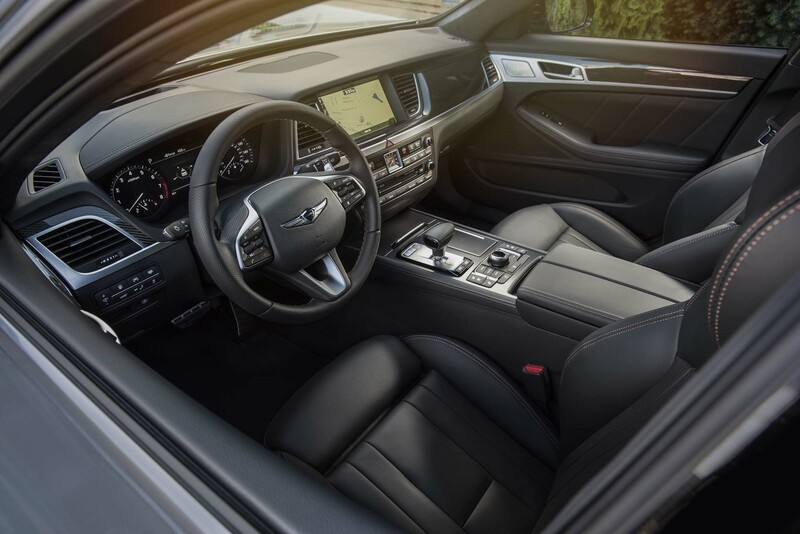 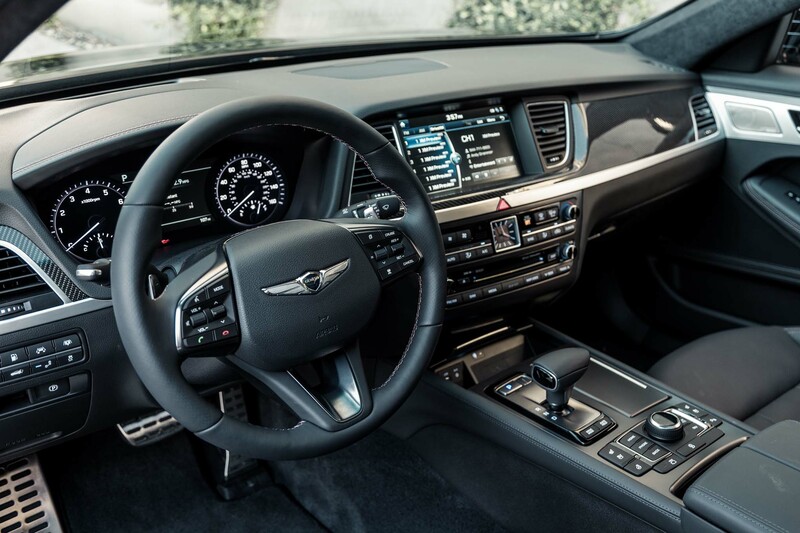 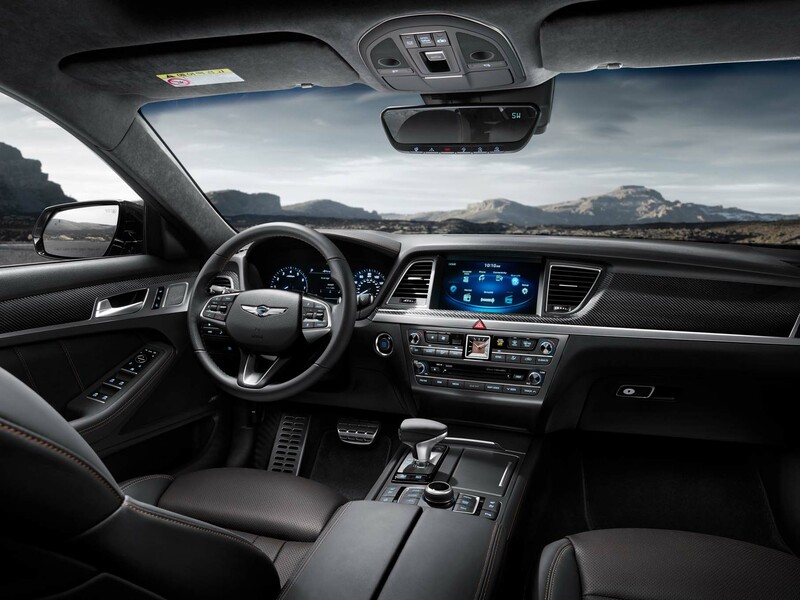 Buying a Genesis G80 3.3T Sport is pretty simple: There’s just one model, priced at $56,225 (including destination), and it comes nicely loaded: Adaptive cruise, heated and cooled power-adjustable front seats, navigation, Qi wireless phone charging, 17-speaker Lexicon stereo, and leather, leather everywhere. 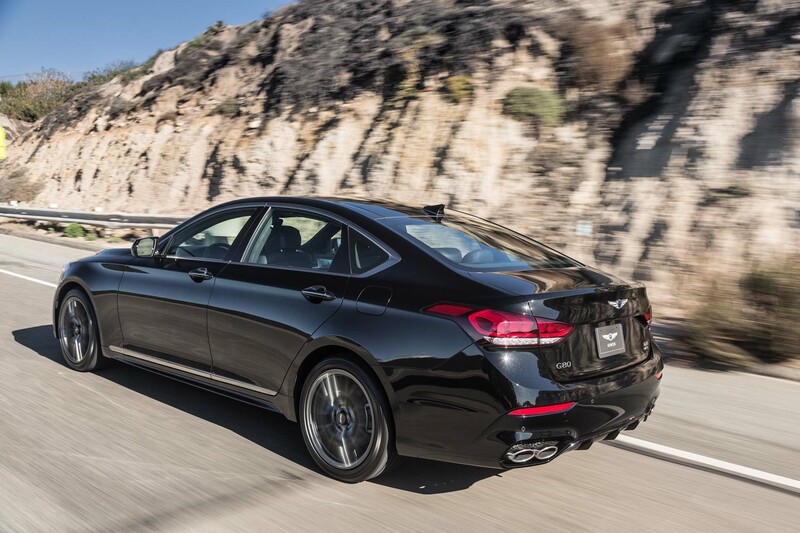 The only option is all-wheel-drive, which adds $2,500 to the price. 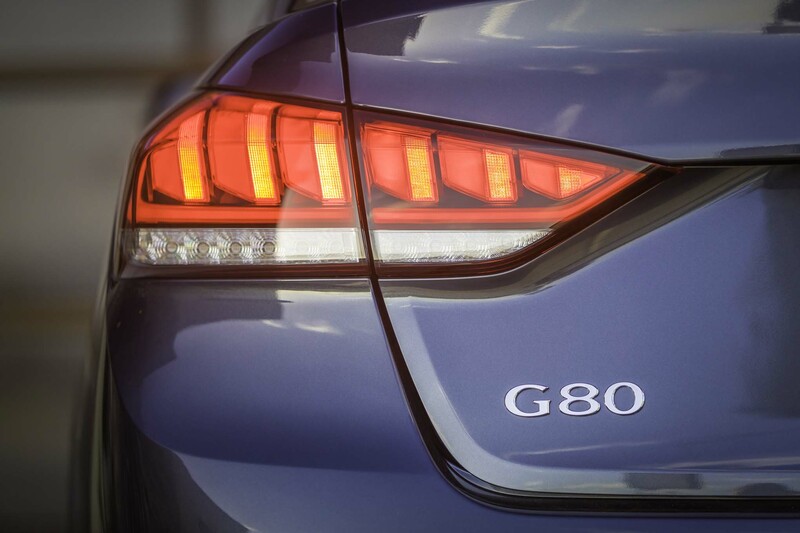 Will the G80 Sport succeed in the marketplace? 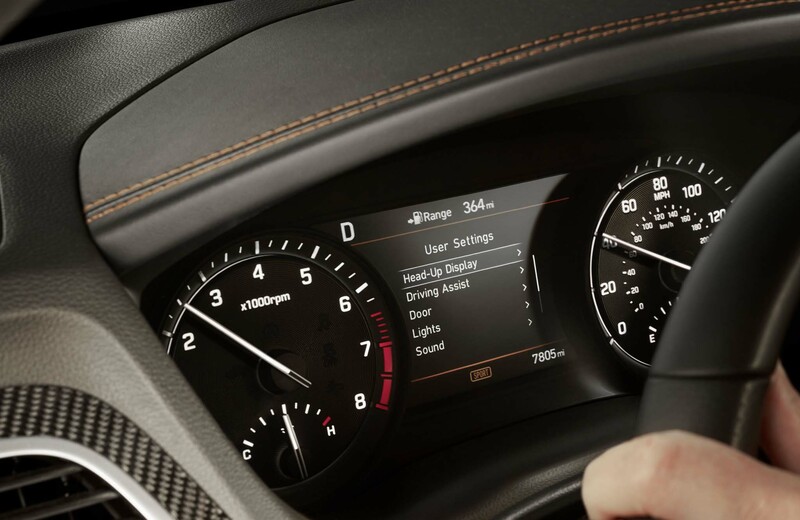 That depends on a lot more than the content of the car. 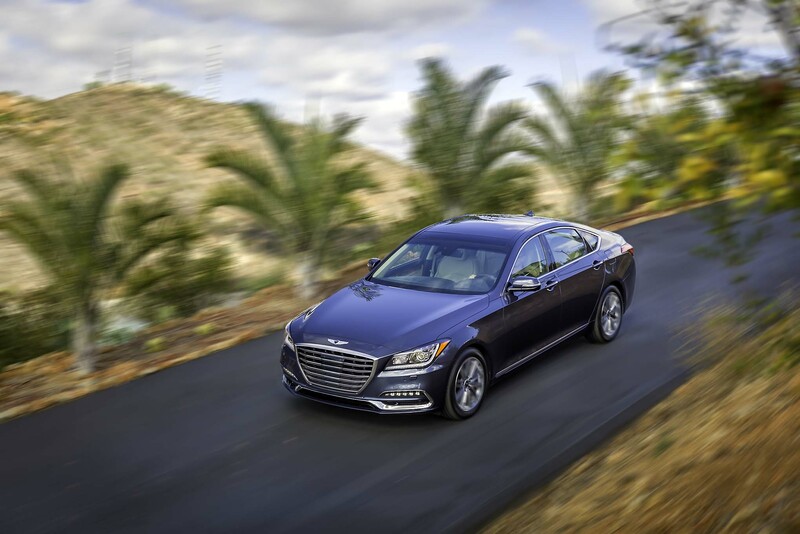 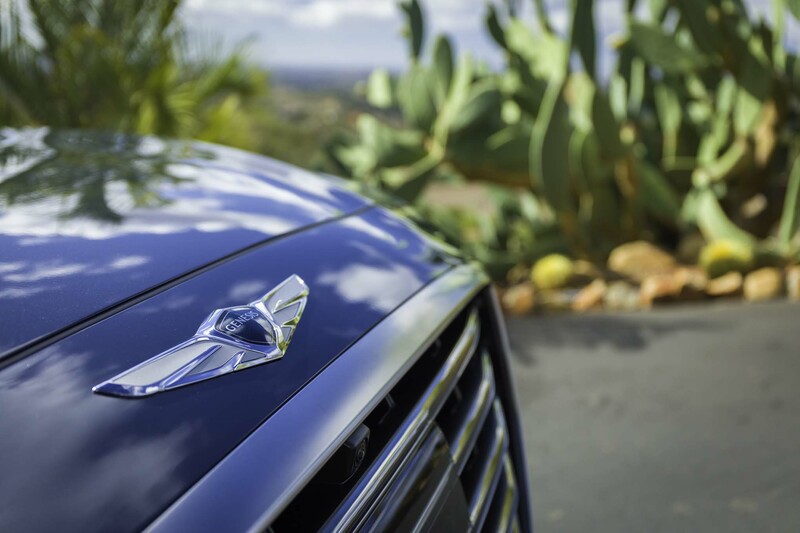 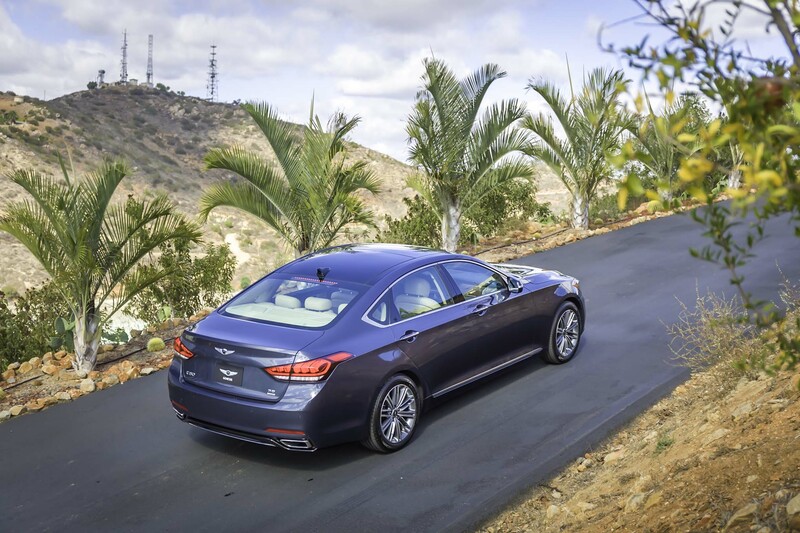 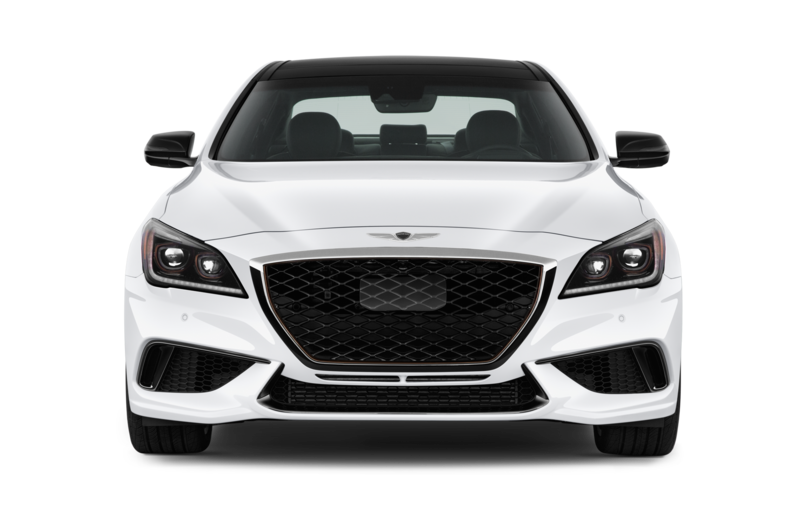 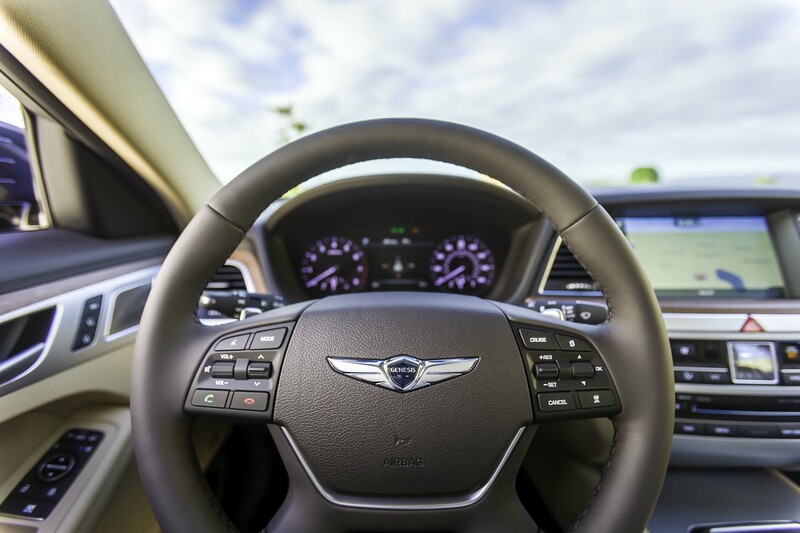 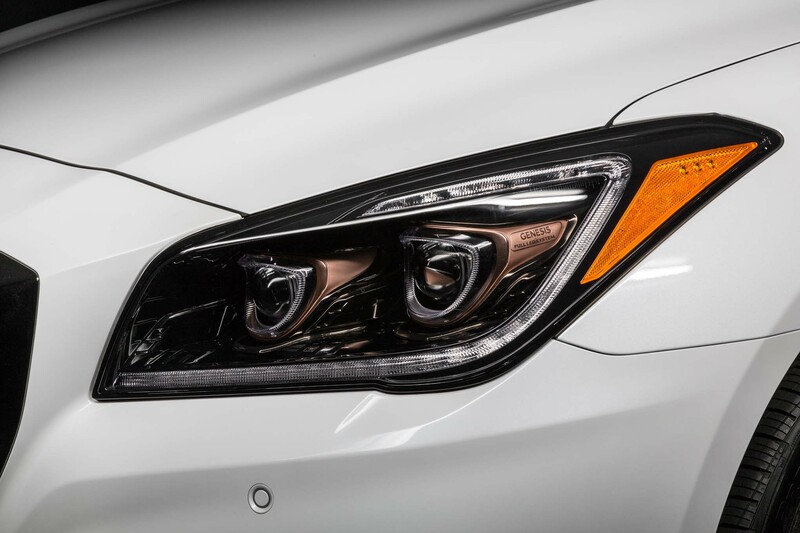 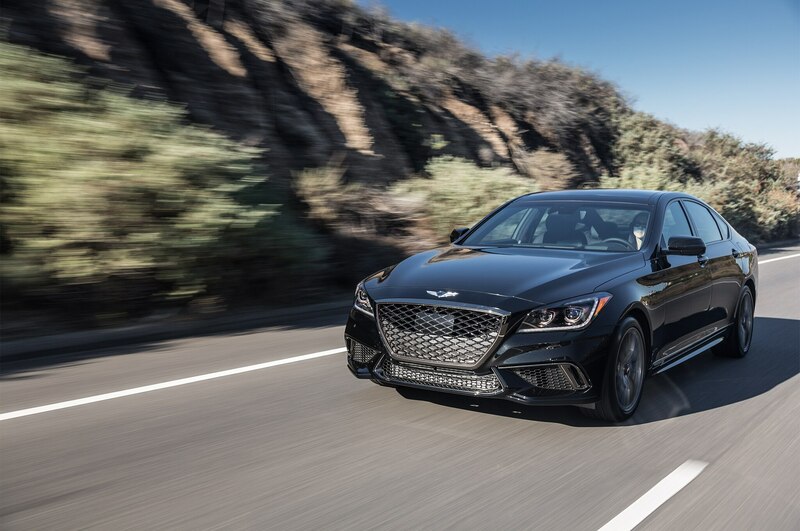 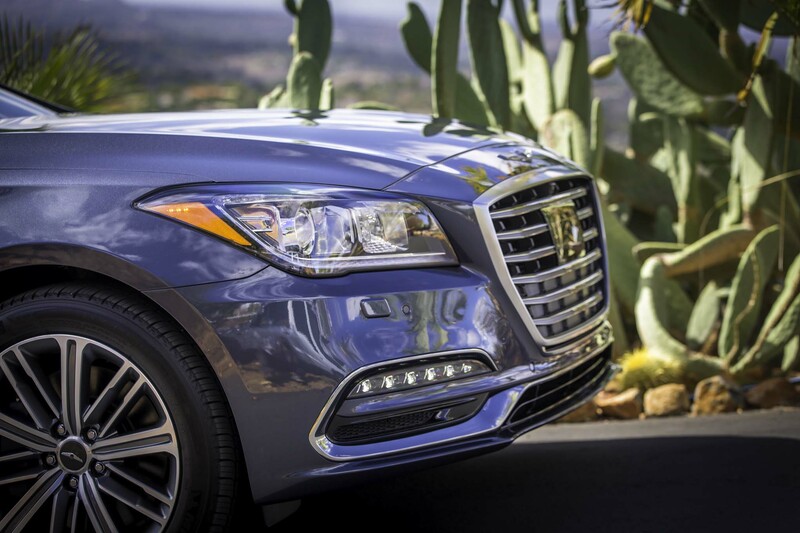 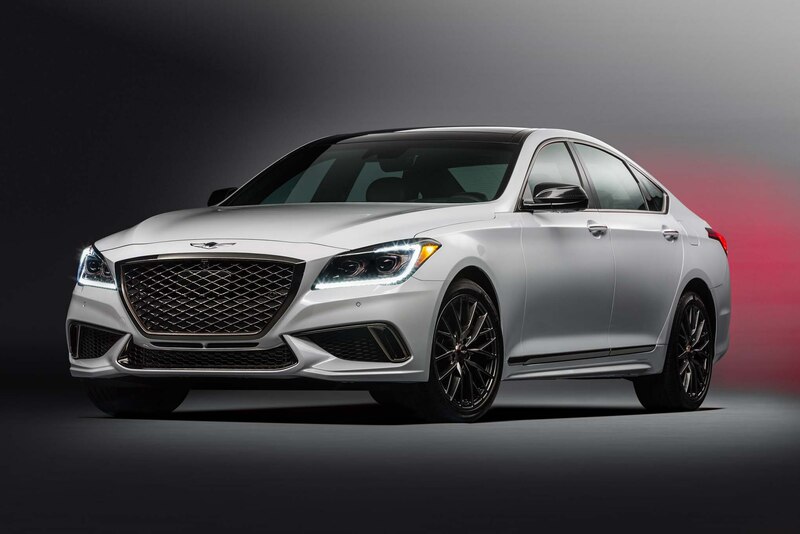 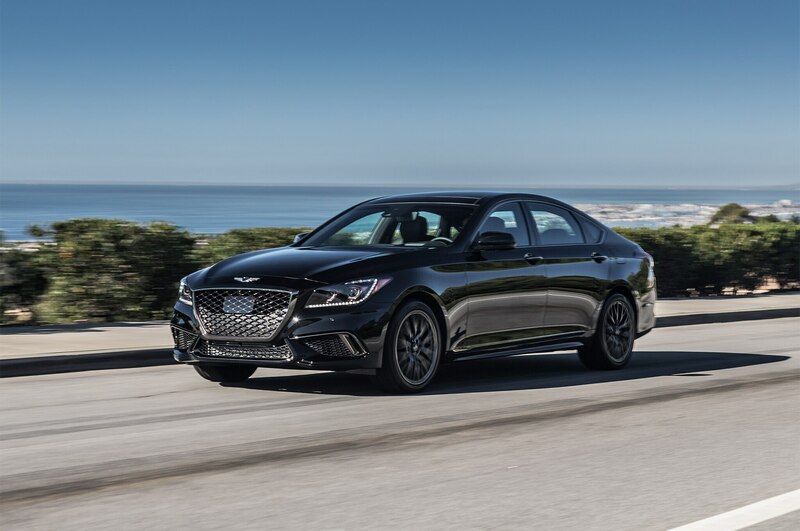 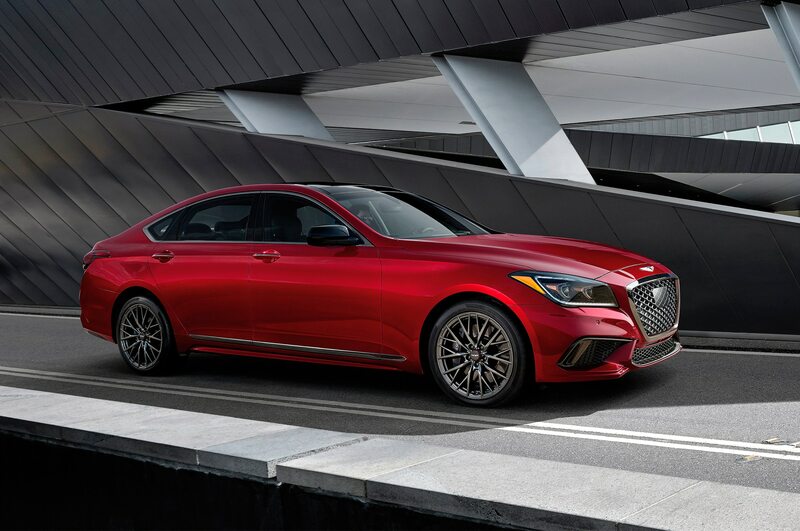 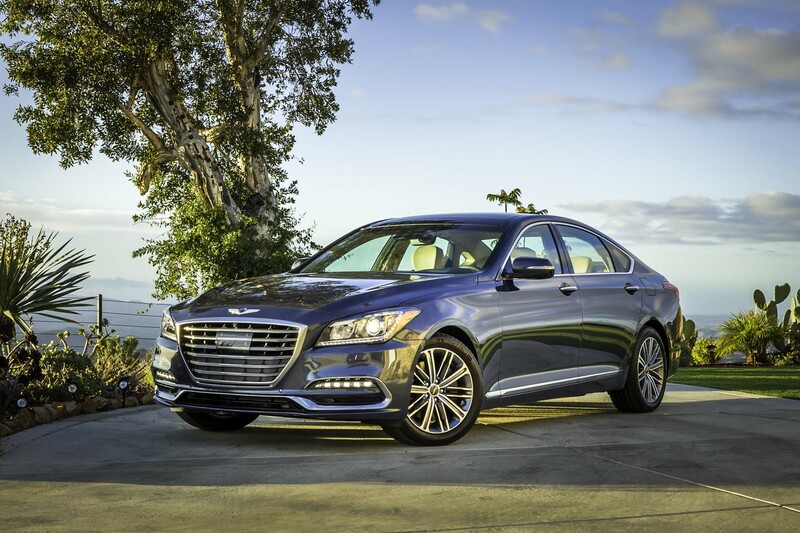 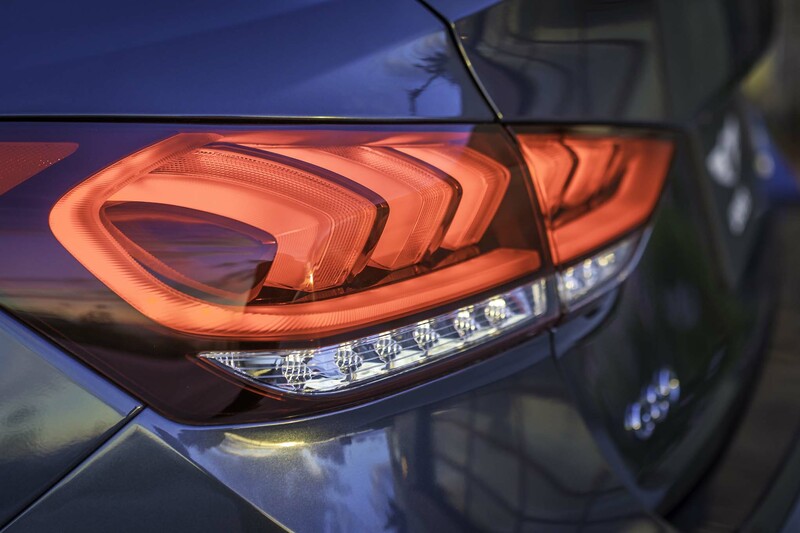 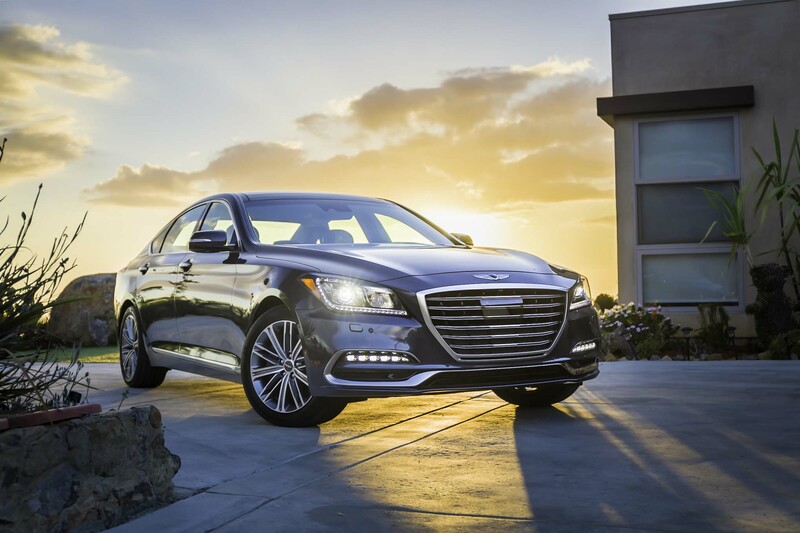 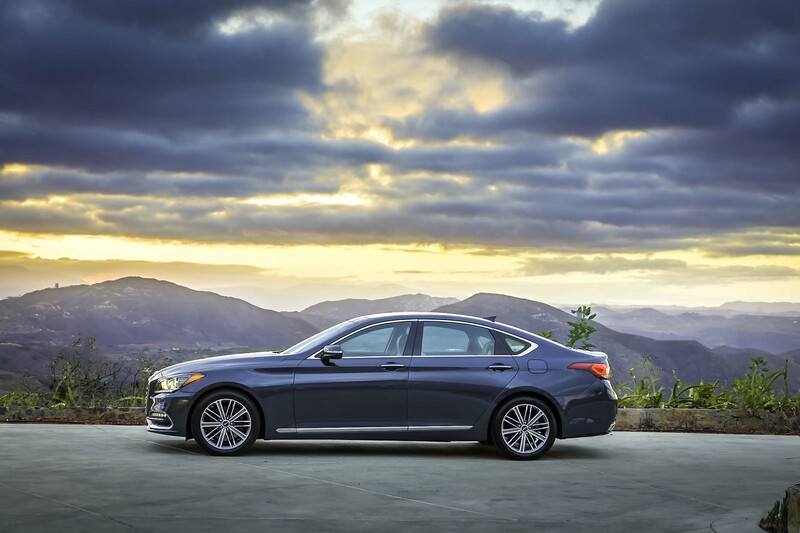 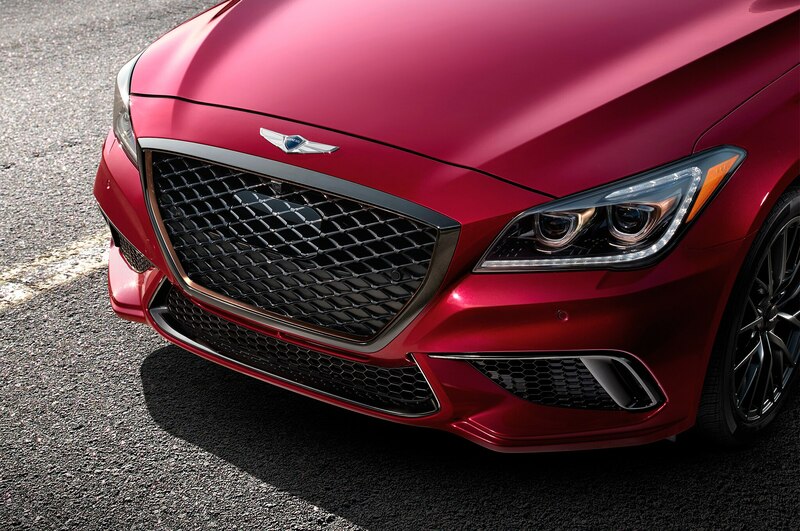 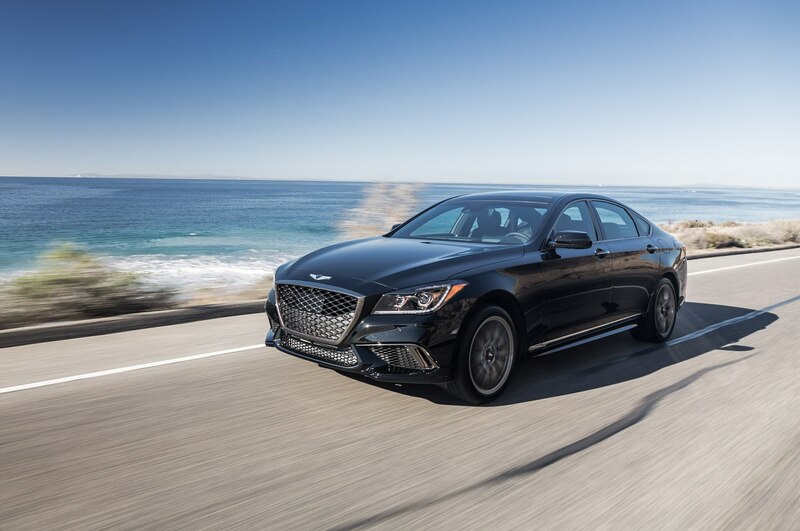 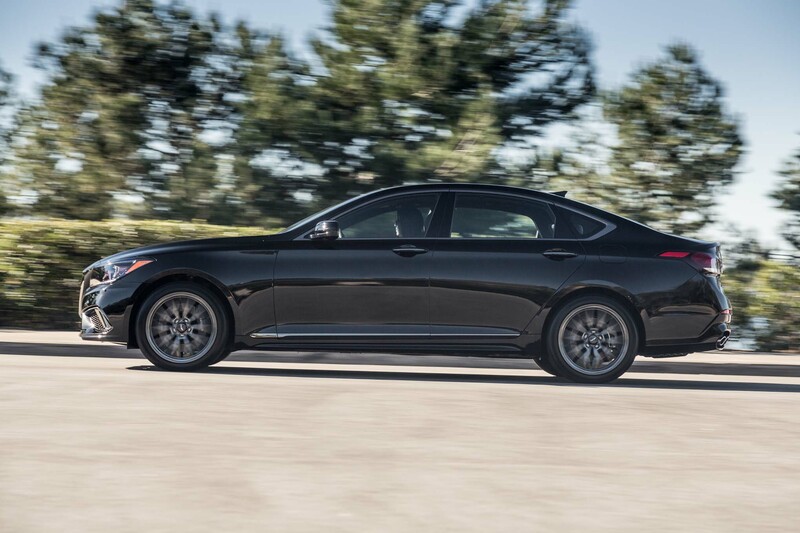 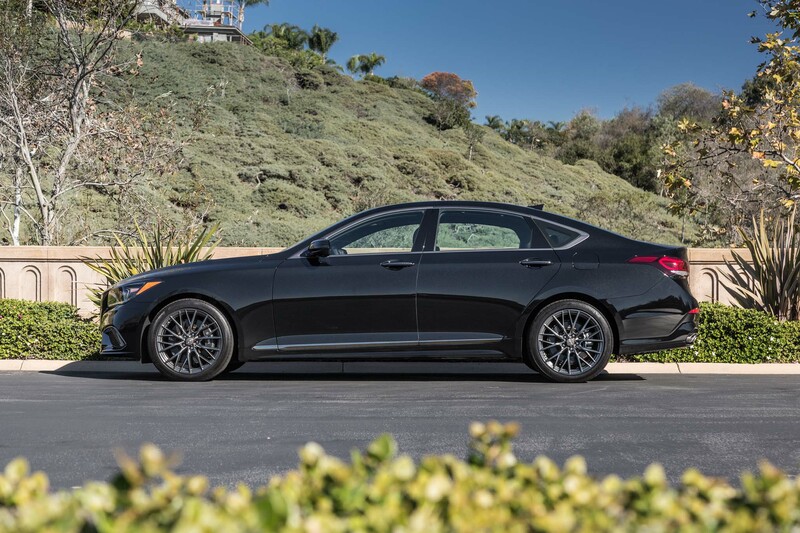 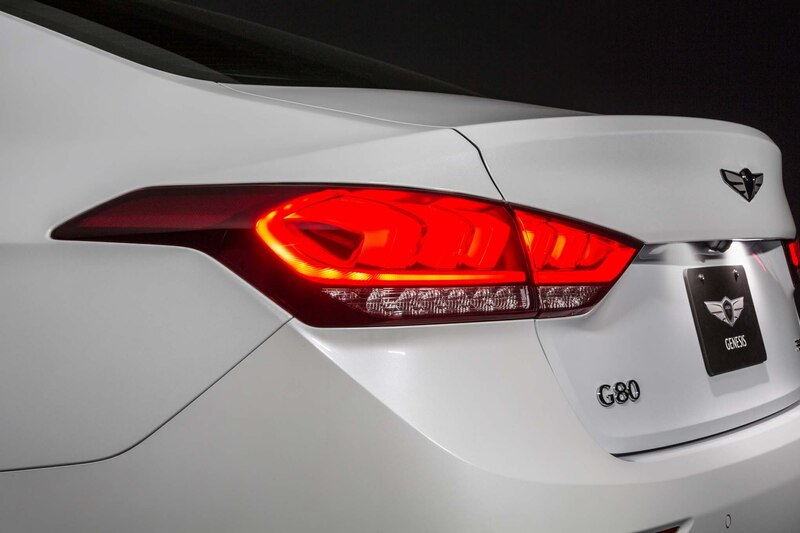 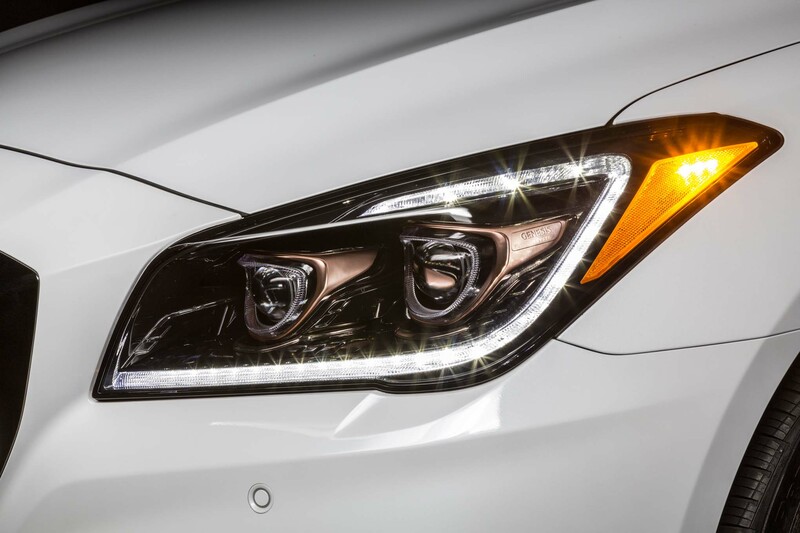 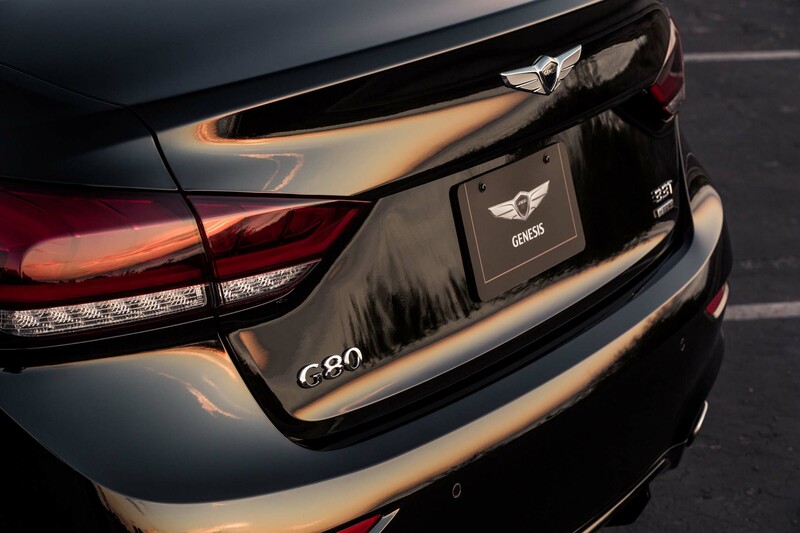 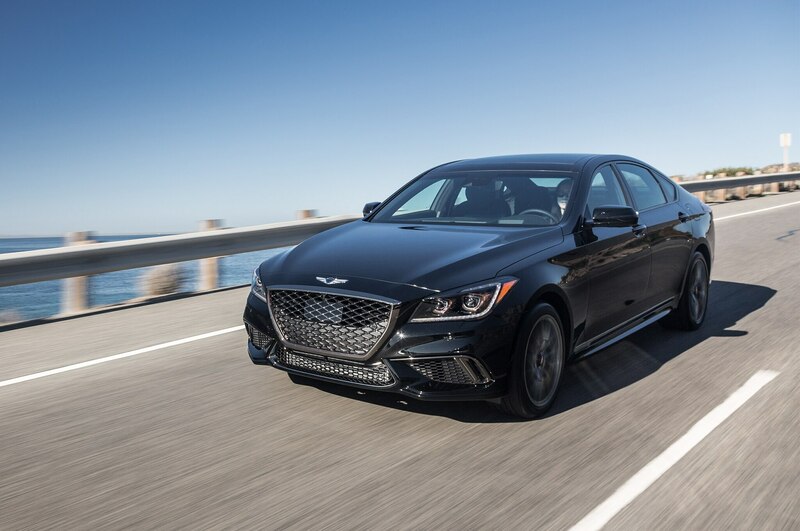 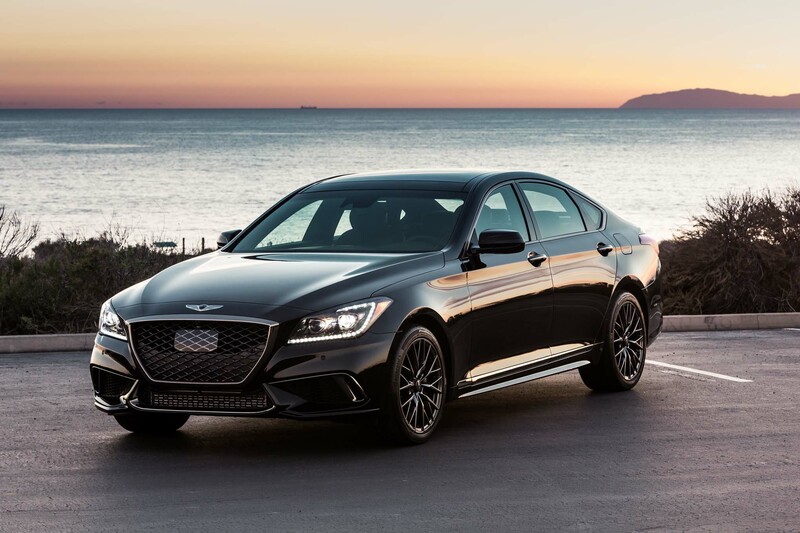 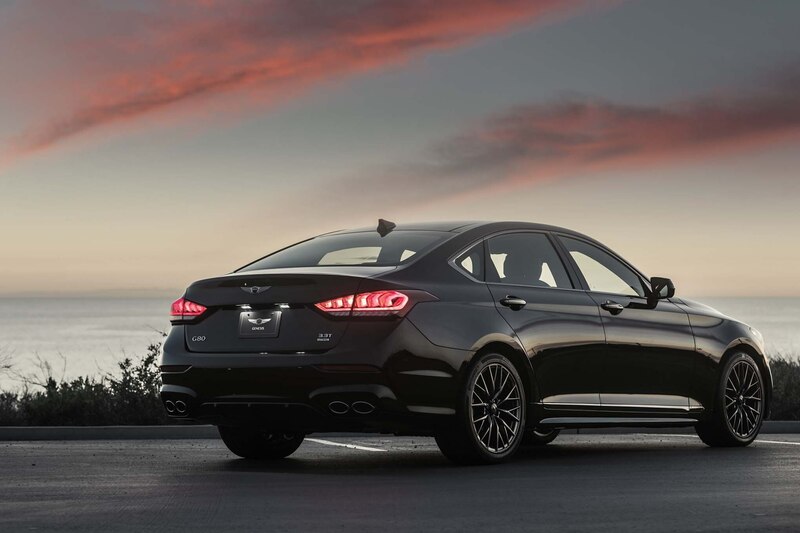 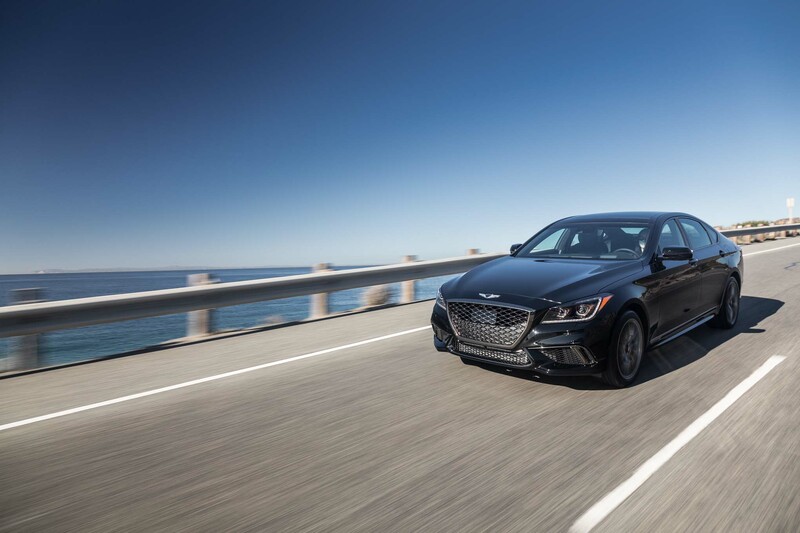 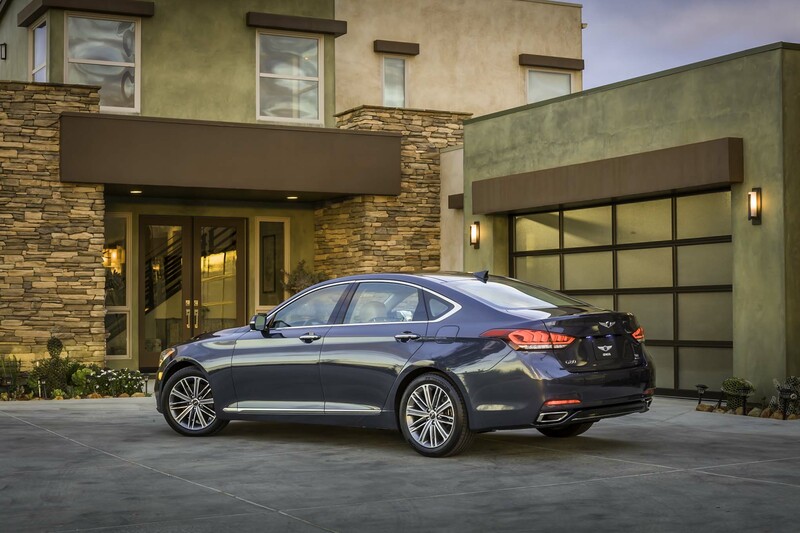 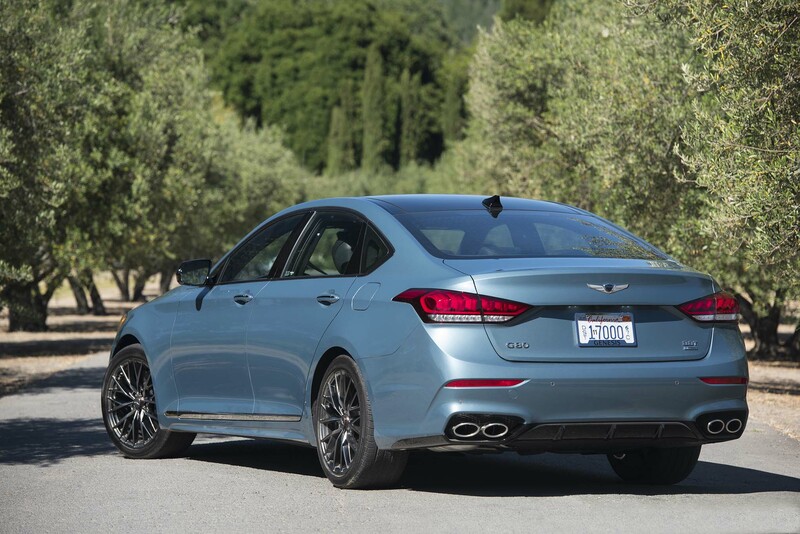 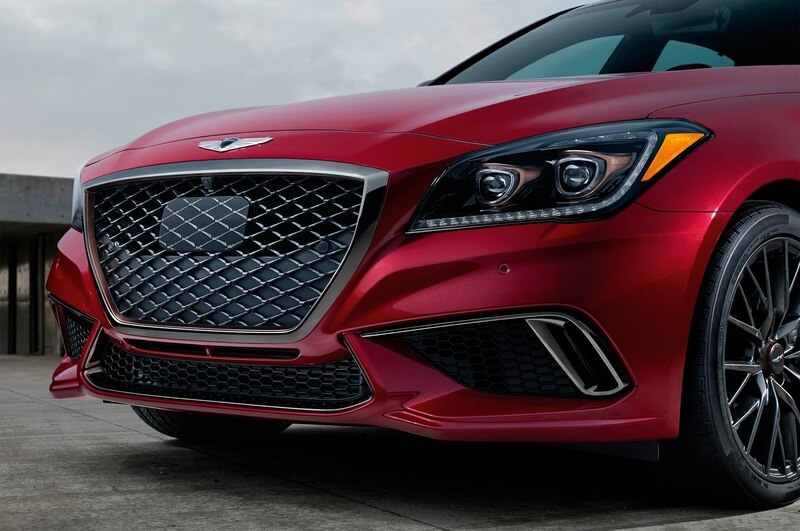 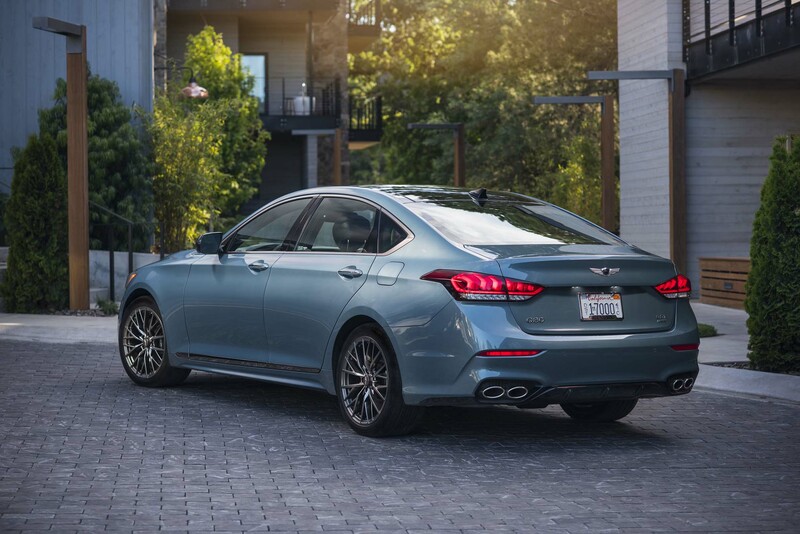 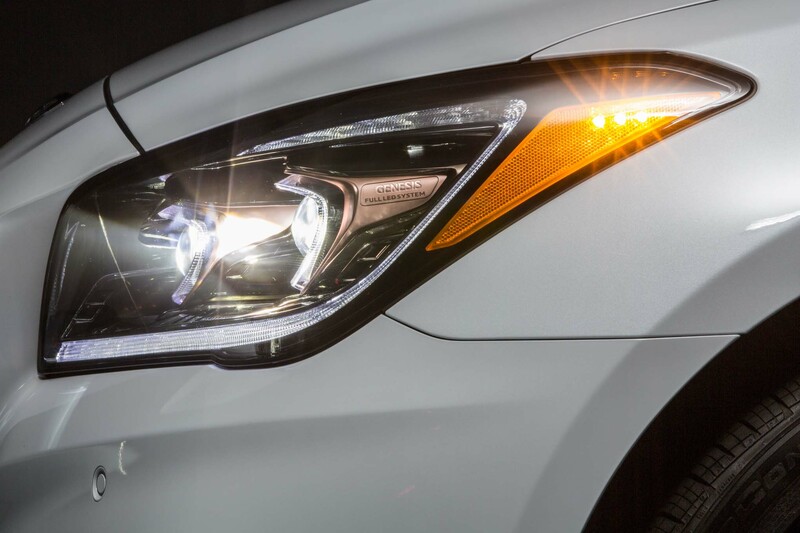 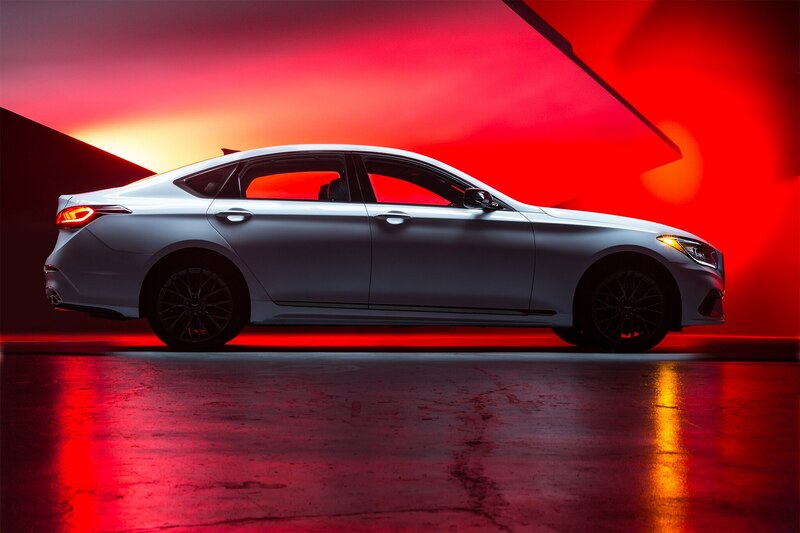 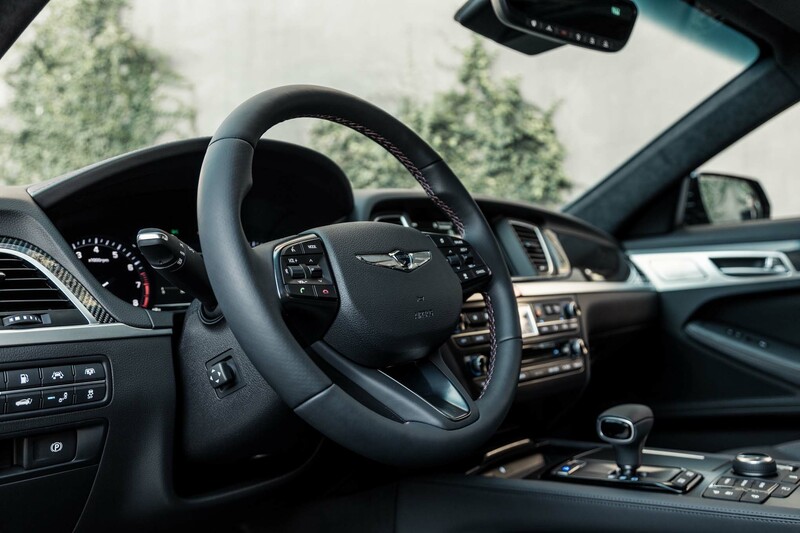 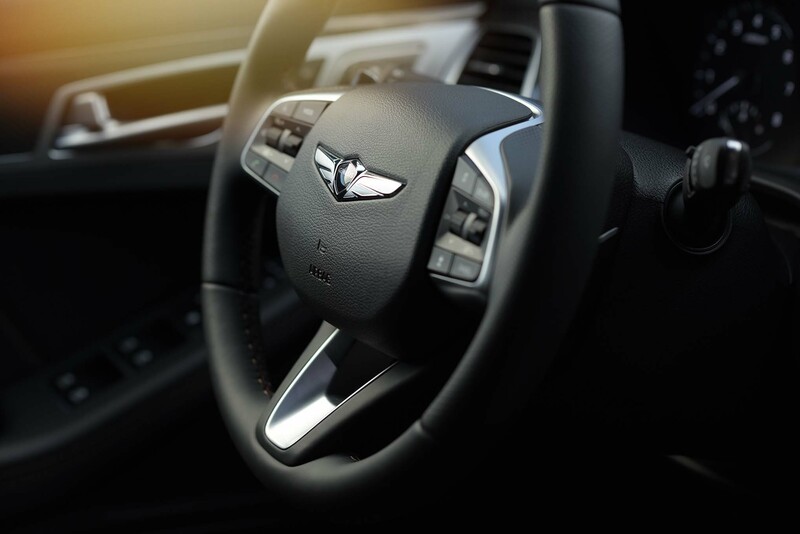 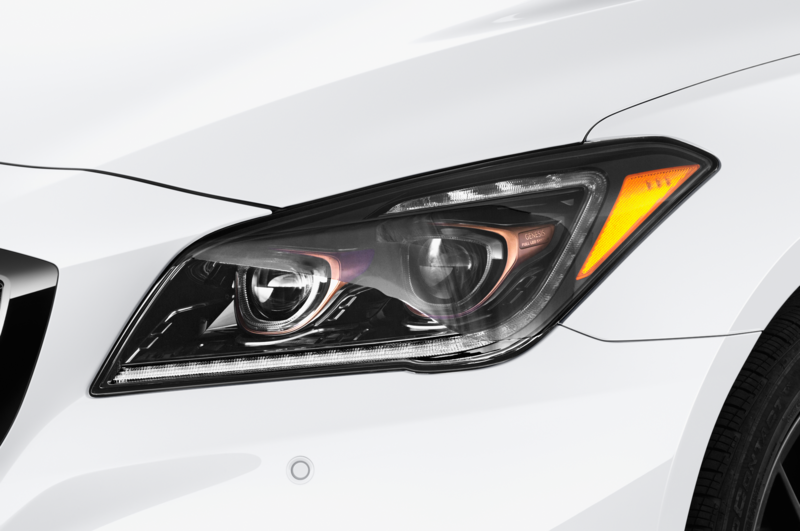 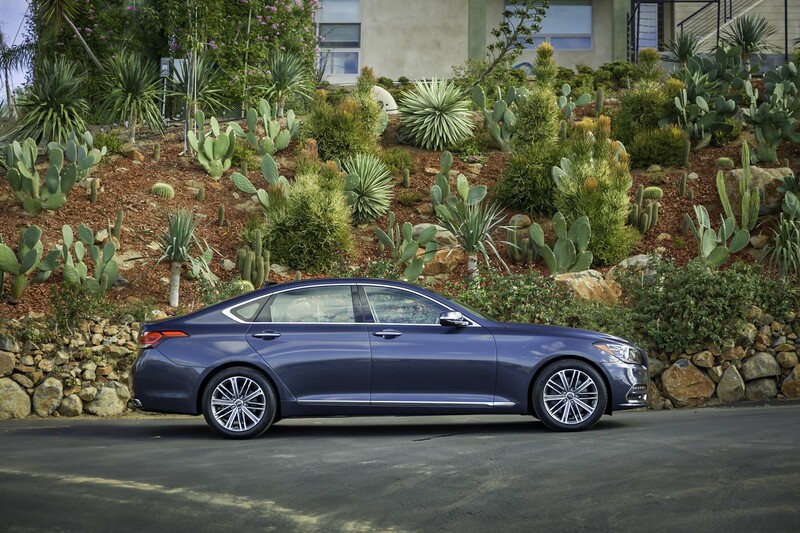 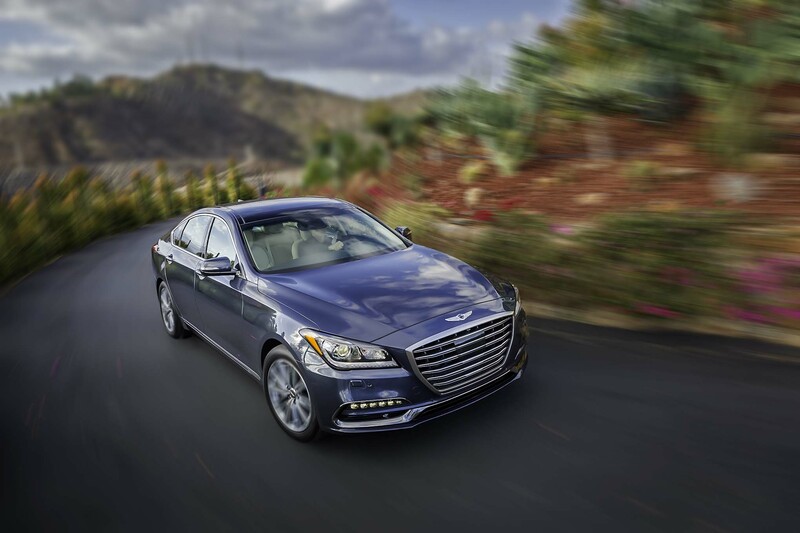 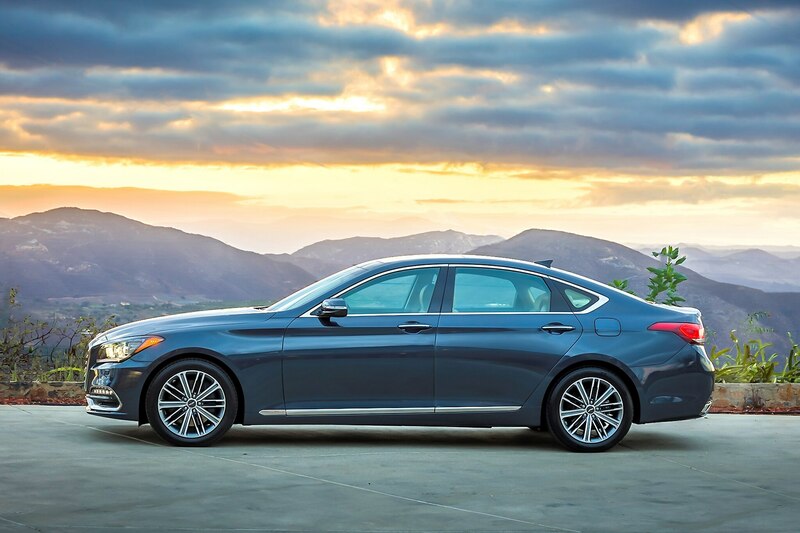 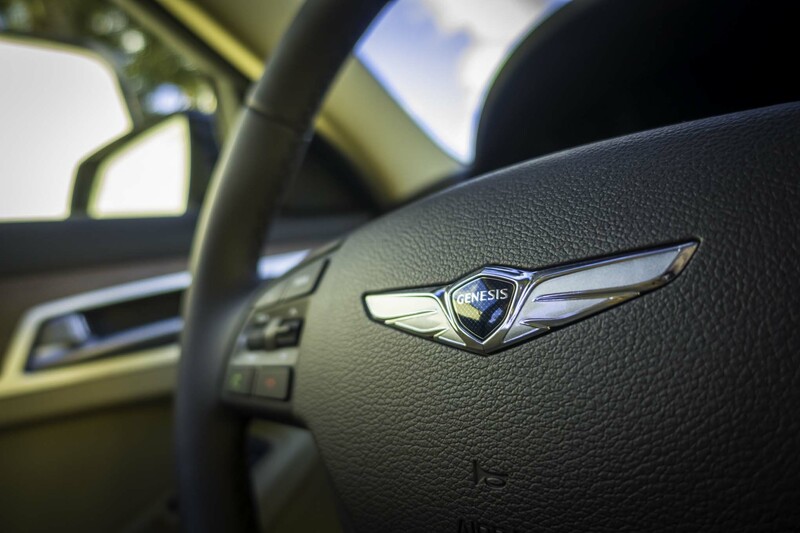 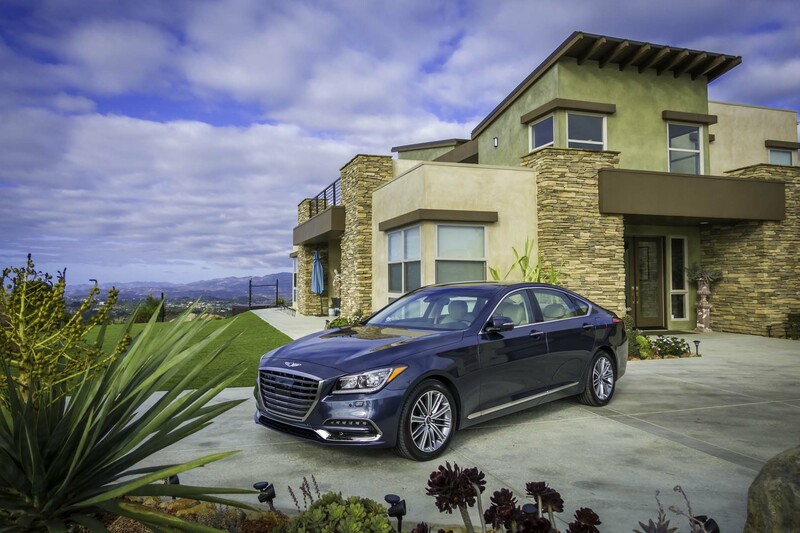 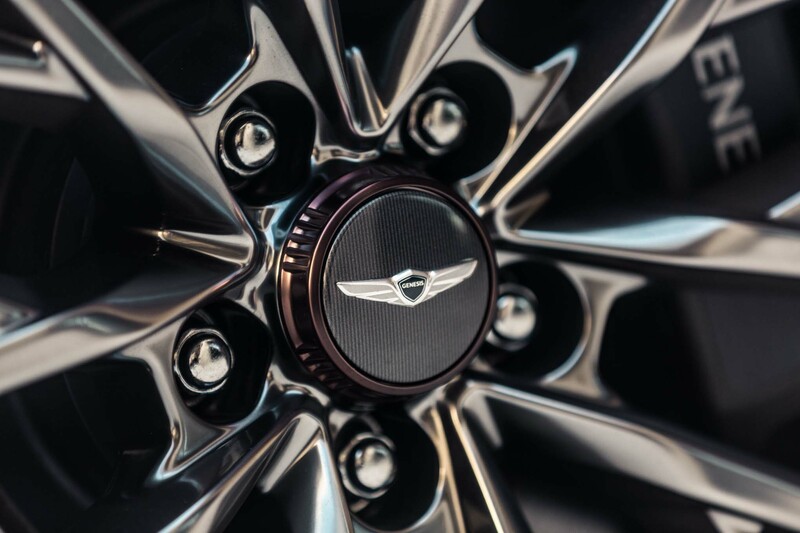 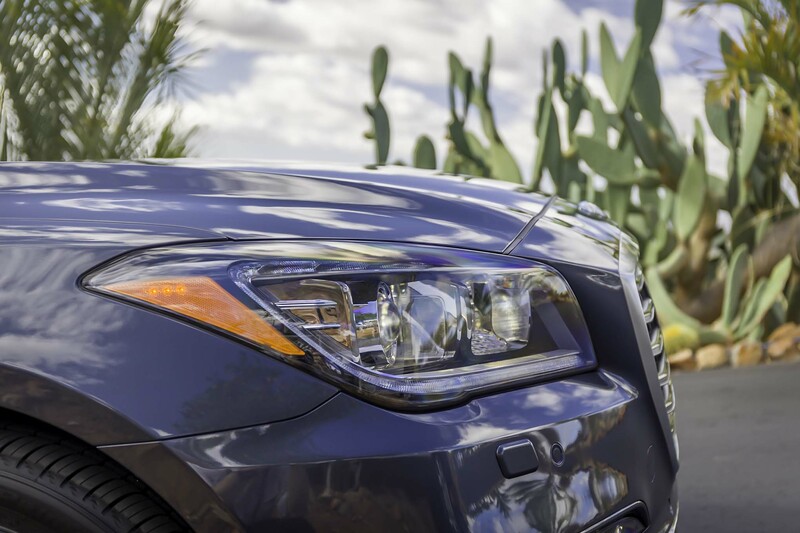 The Genesis brand must establish itself, and with the vast majority of Hyundai dealers selling G80s alongside Accents and Velosters, that could be difficult. 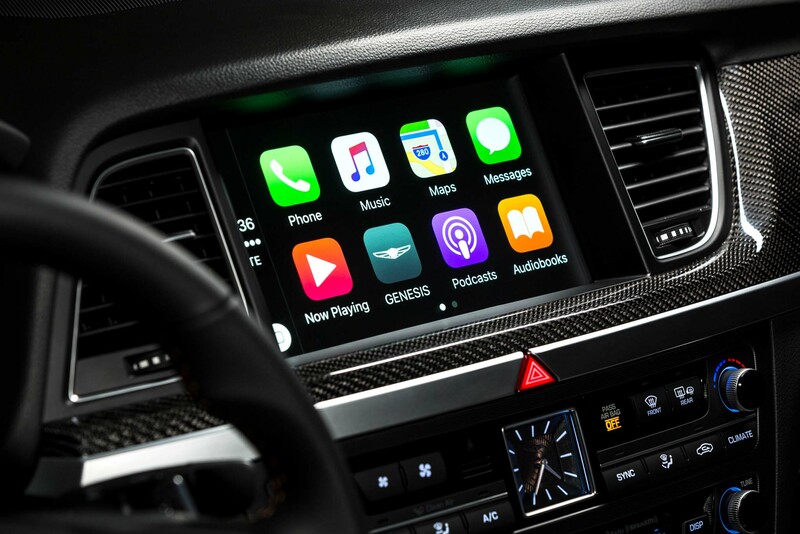 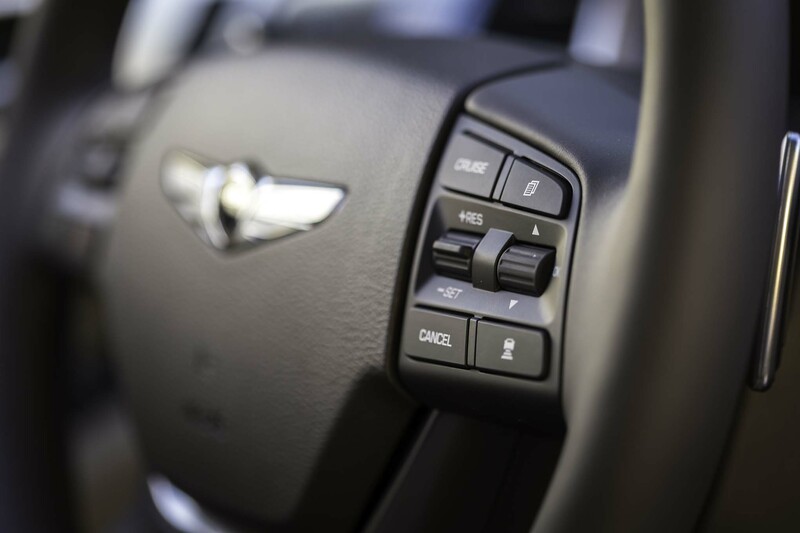 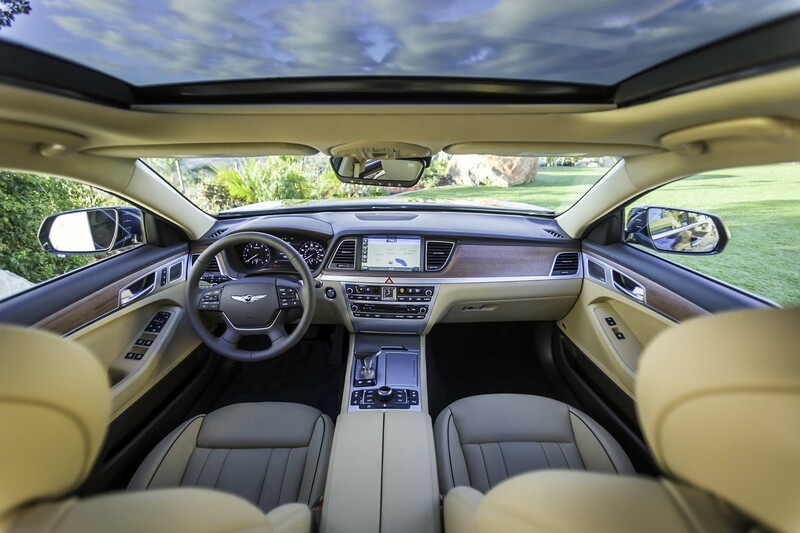 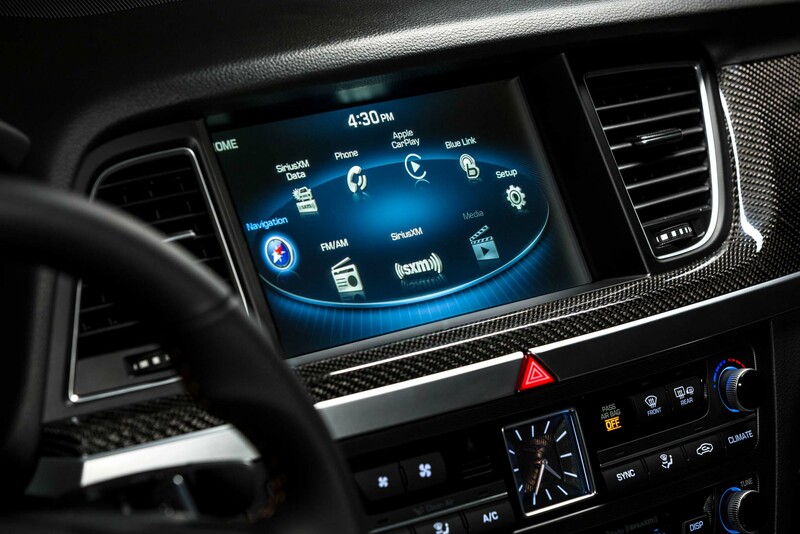 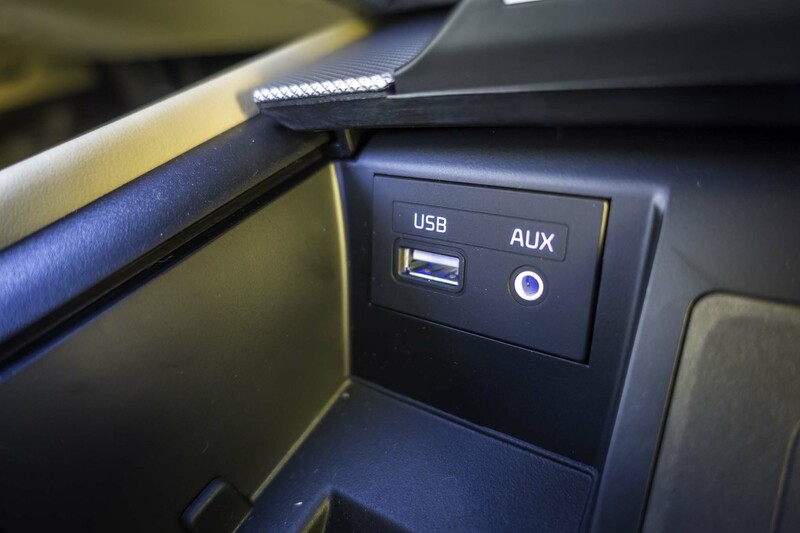 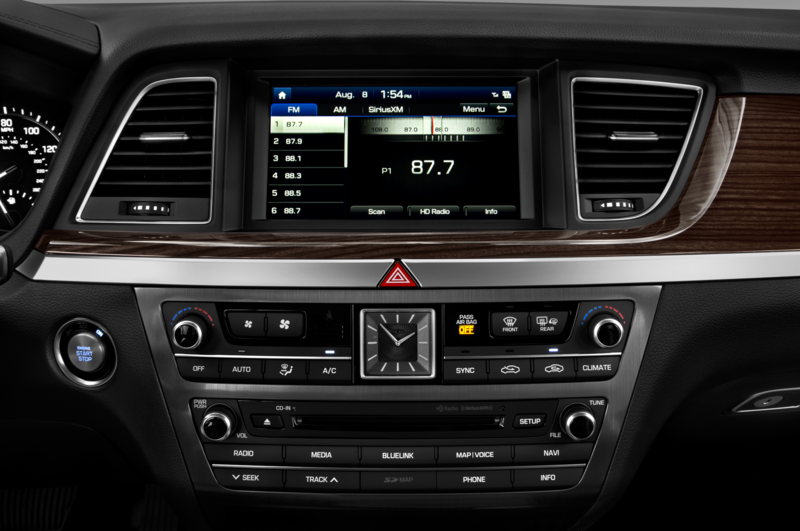 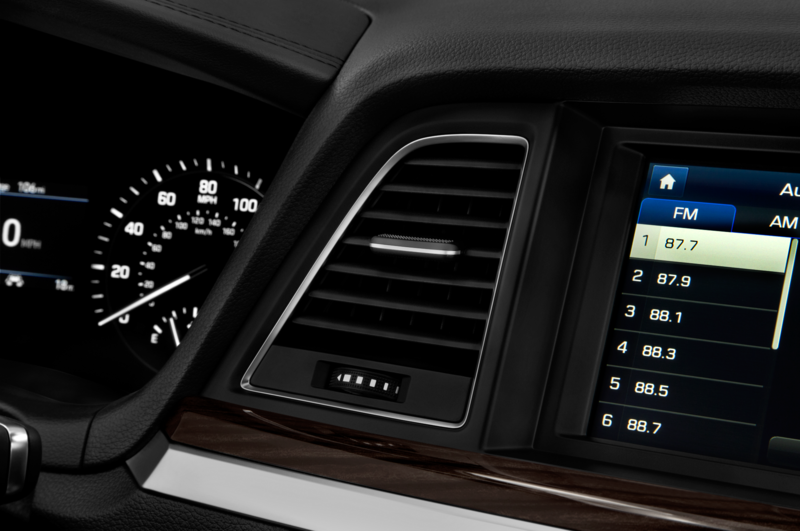 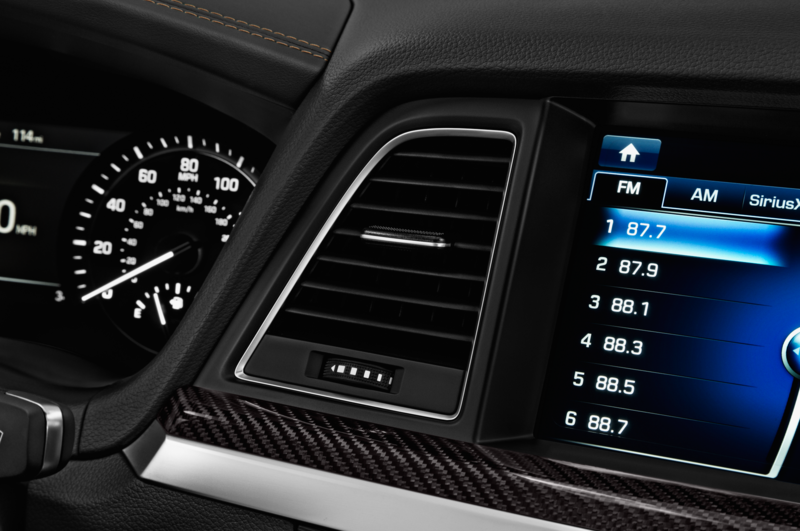 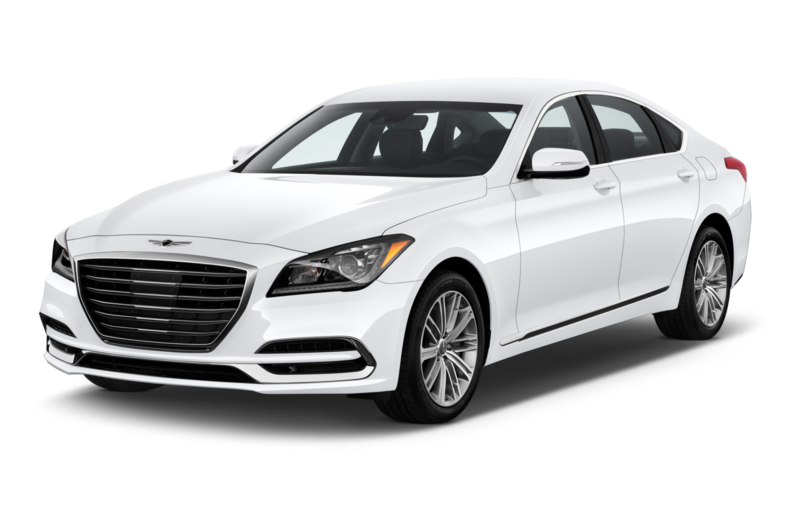 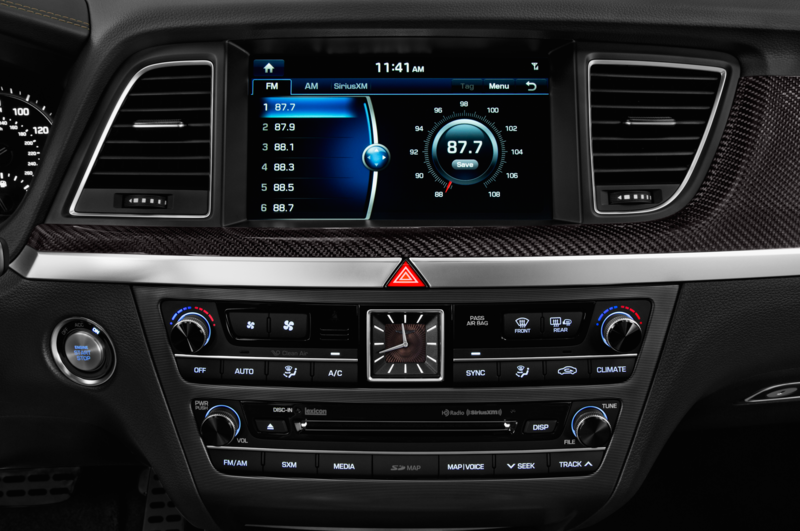 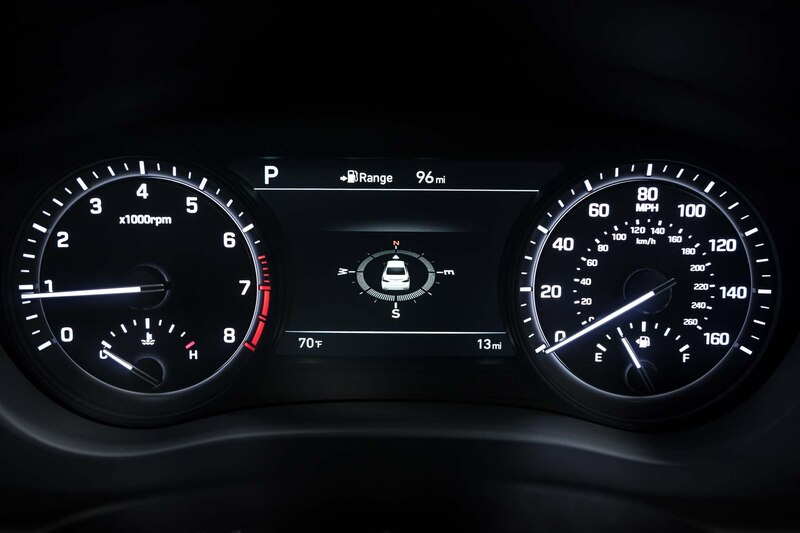 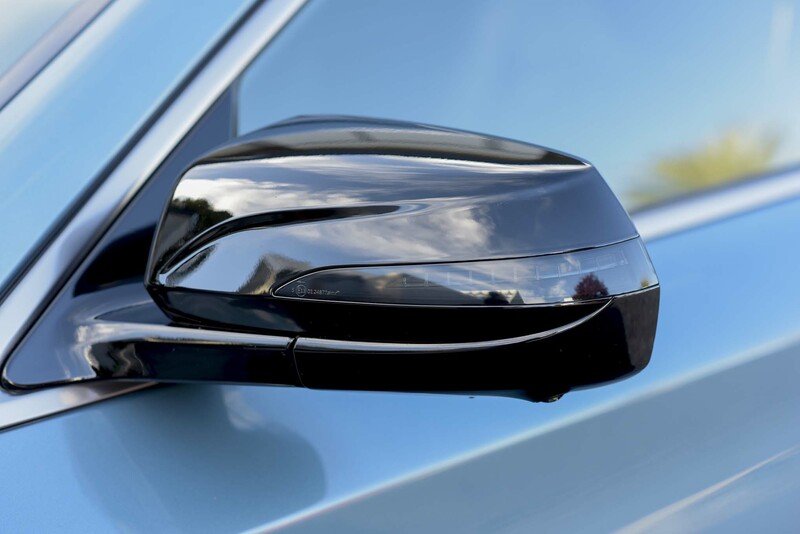 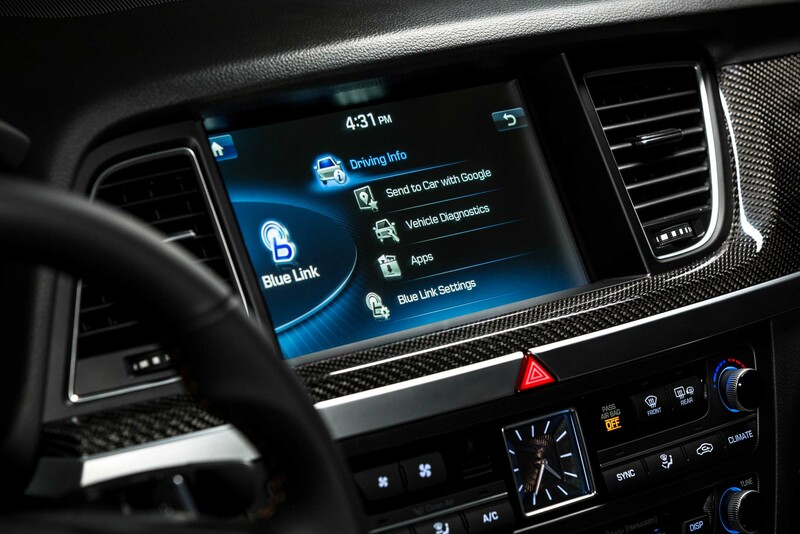 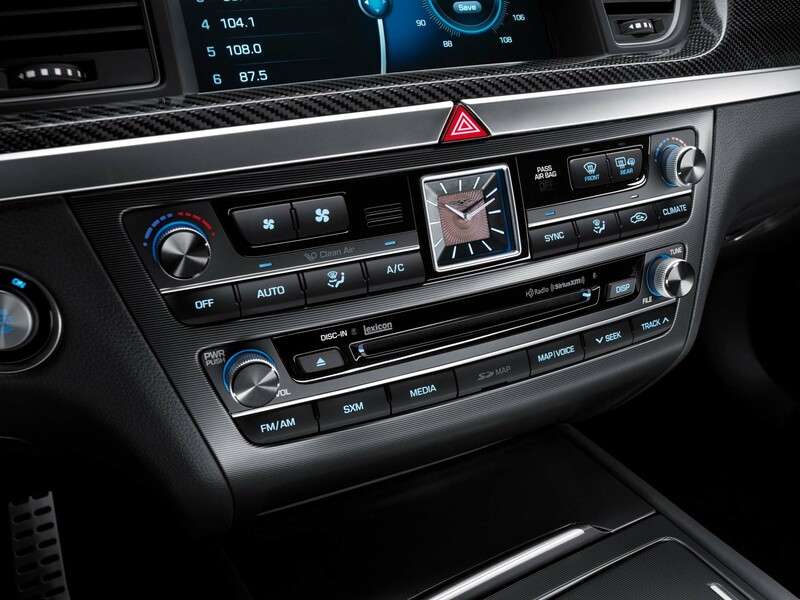 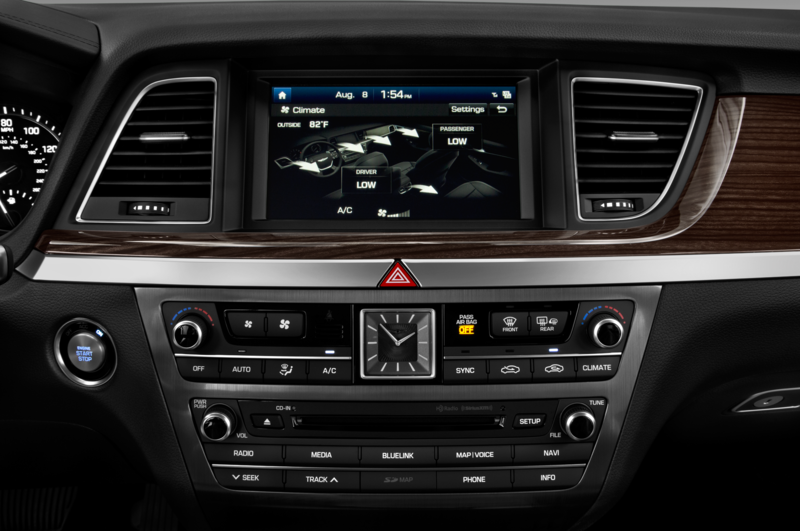 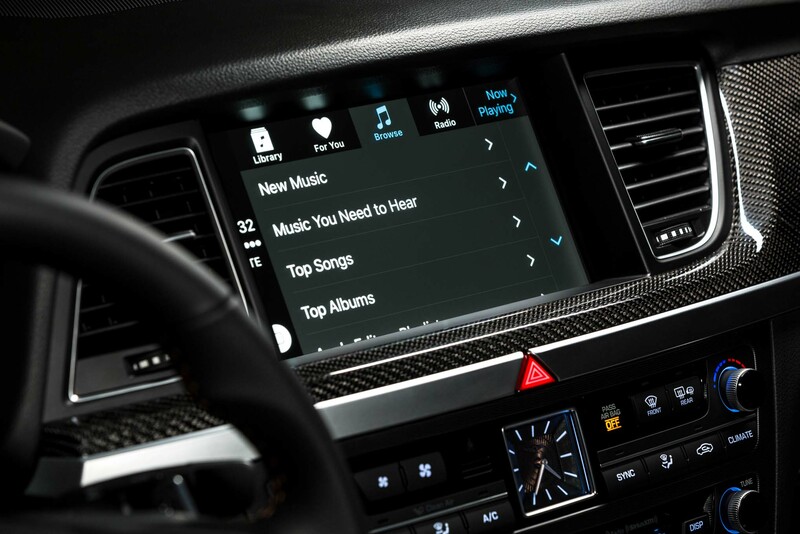 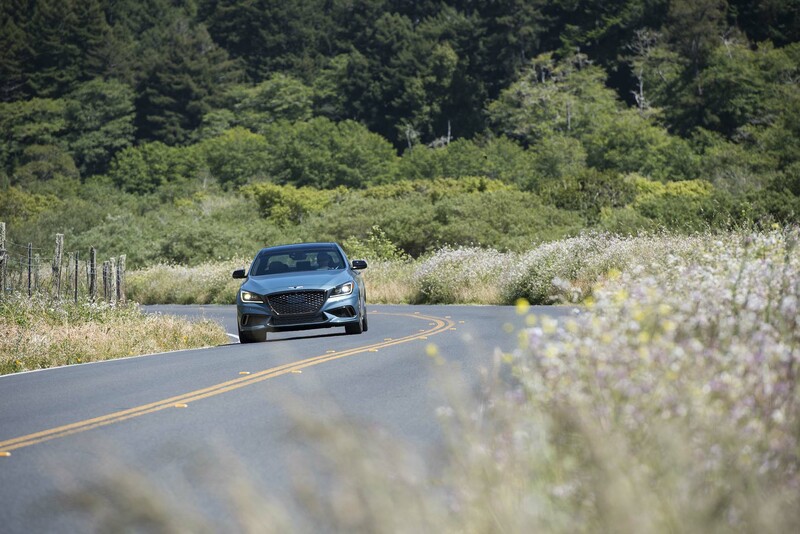 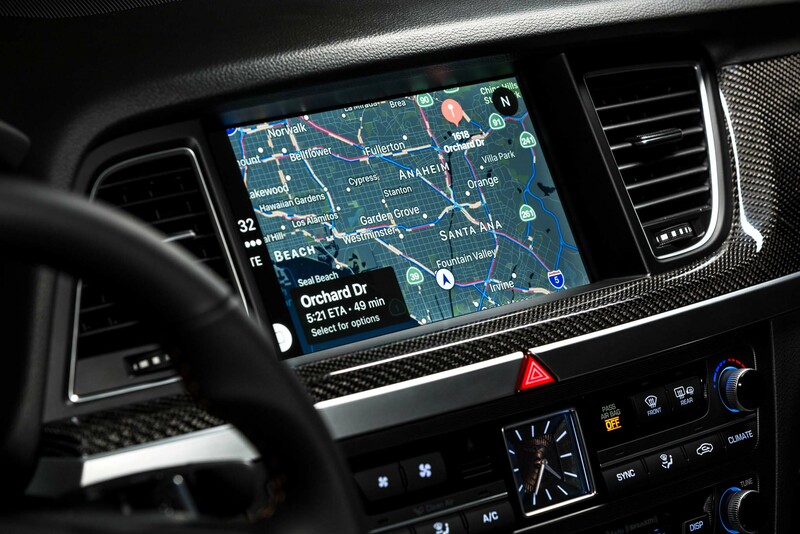 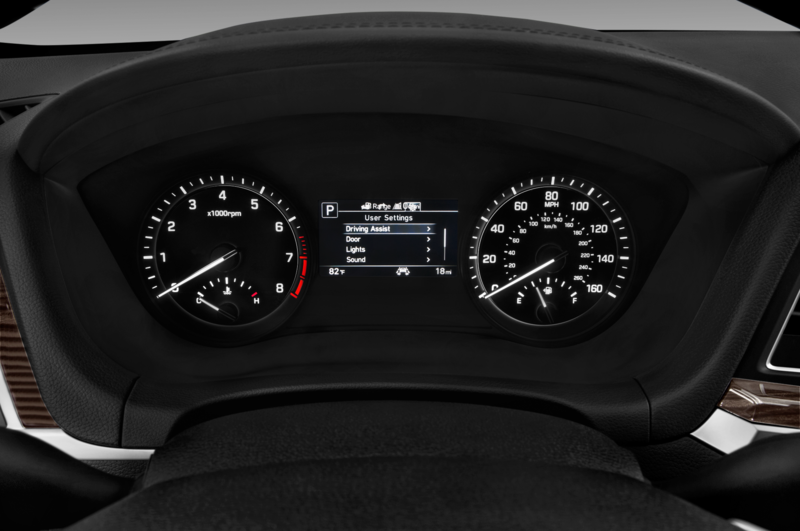 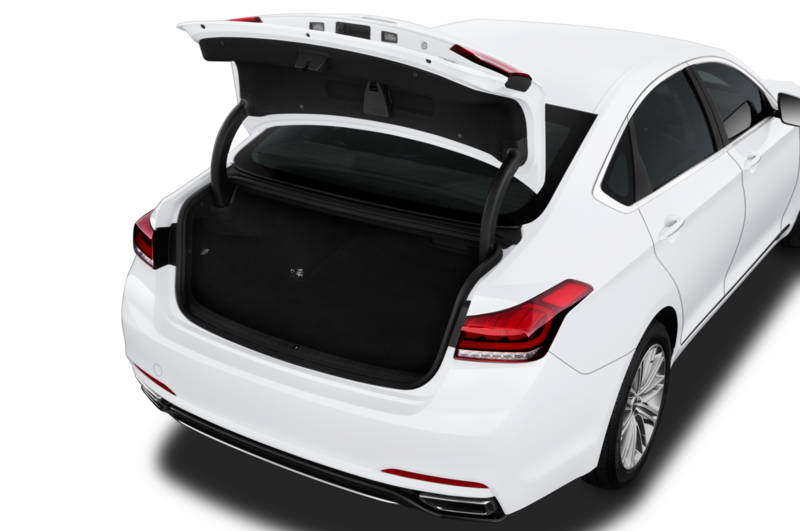 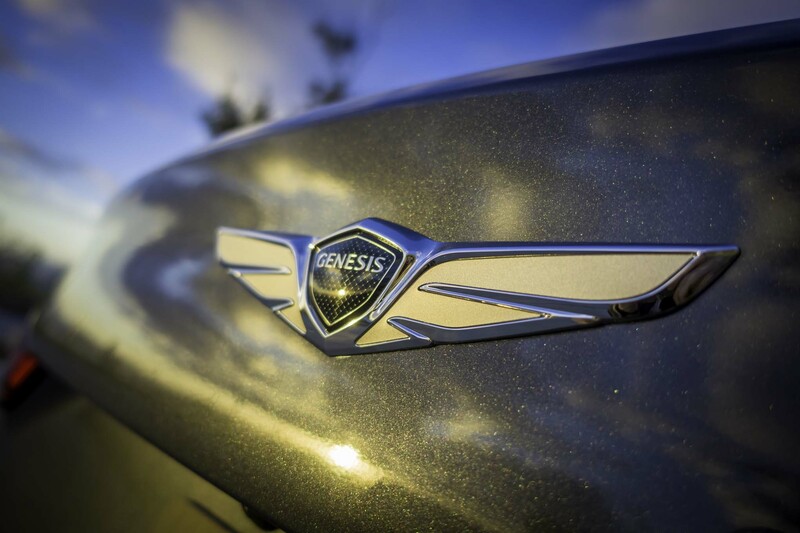 Still, Genesis is doing their best: All cars include three years of free maintenance with valet service (they pick up the car and drop off a loaner), navigation updates, and SiriusXM satellite radio. 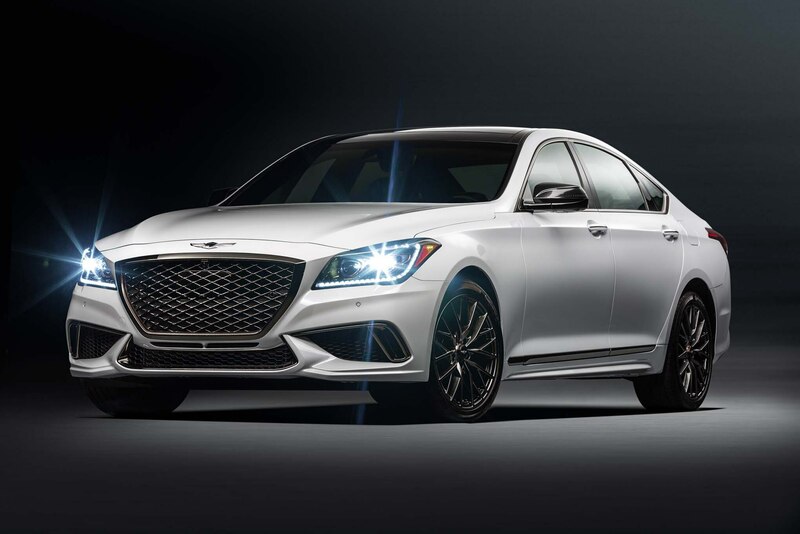 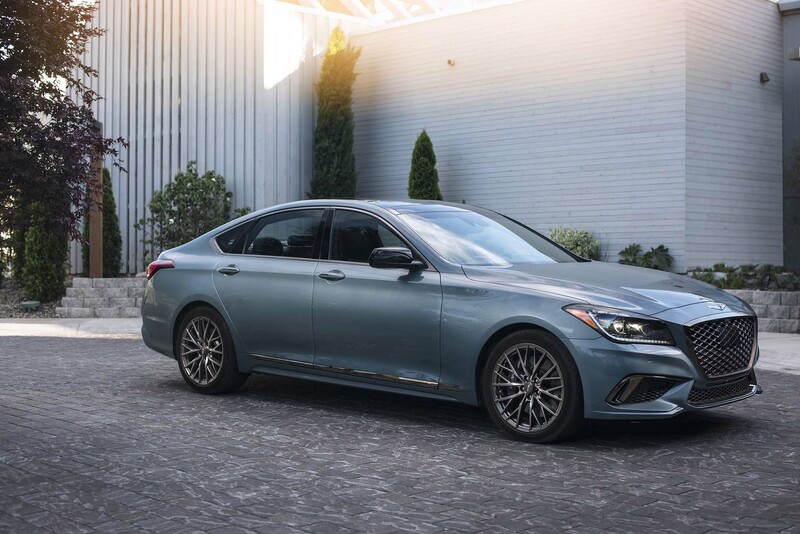 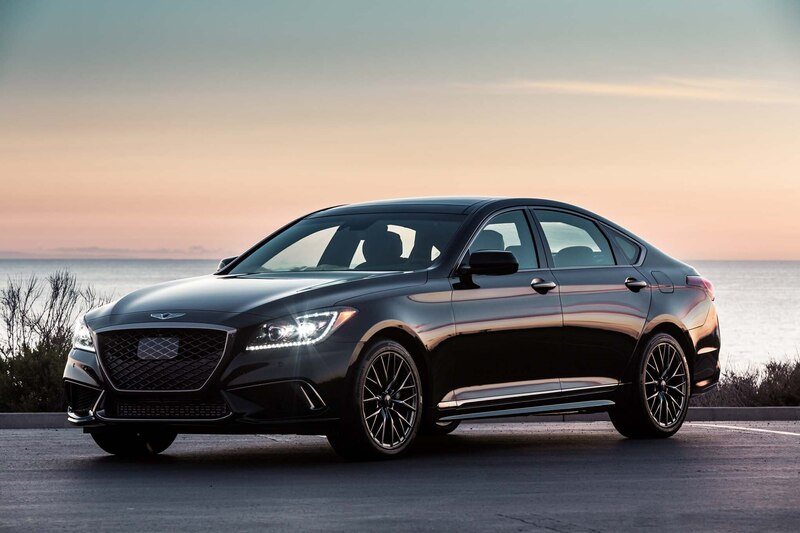 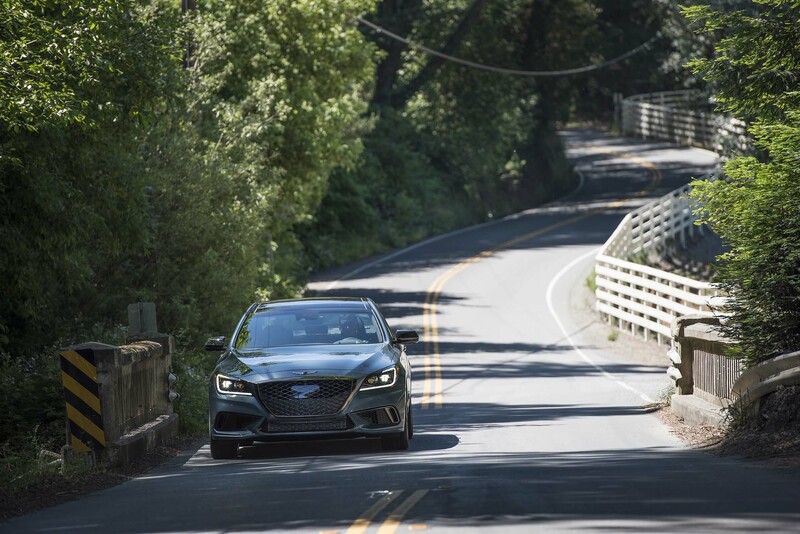 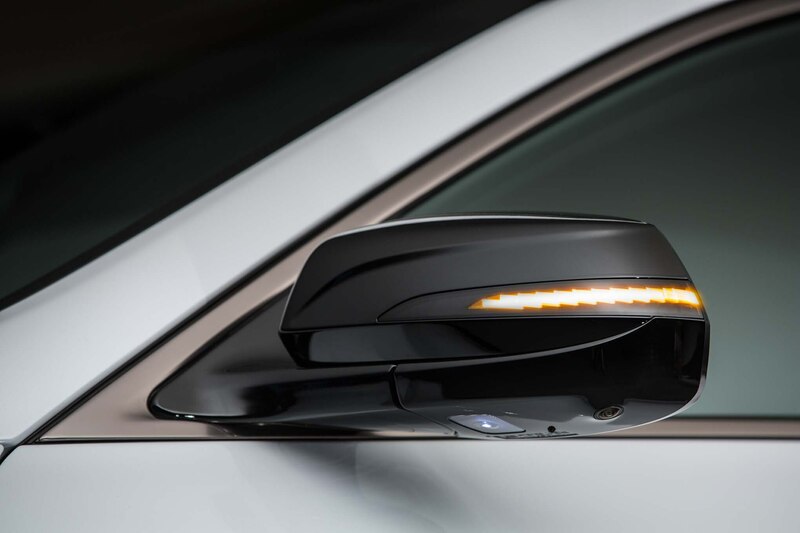 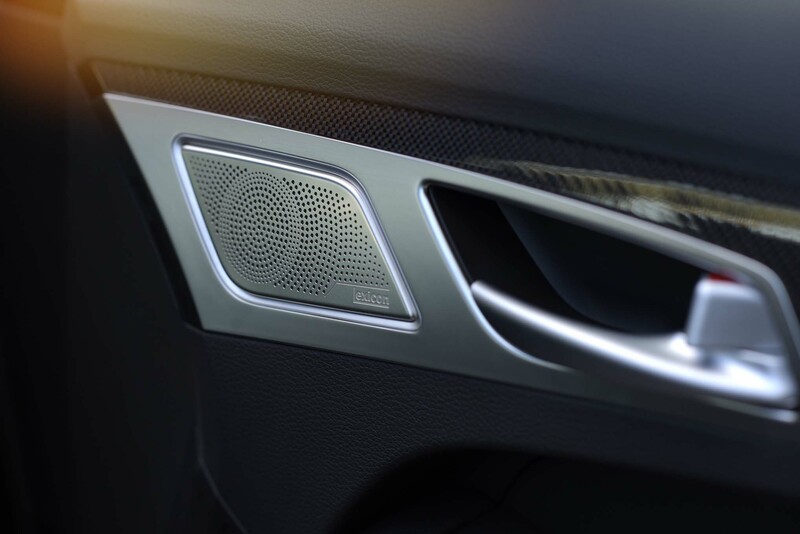 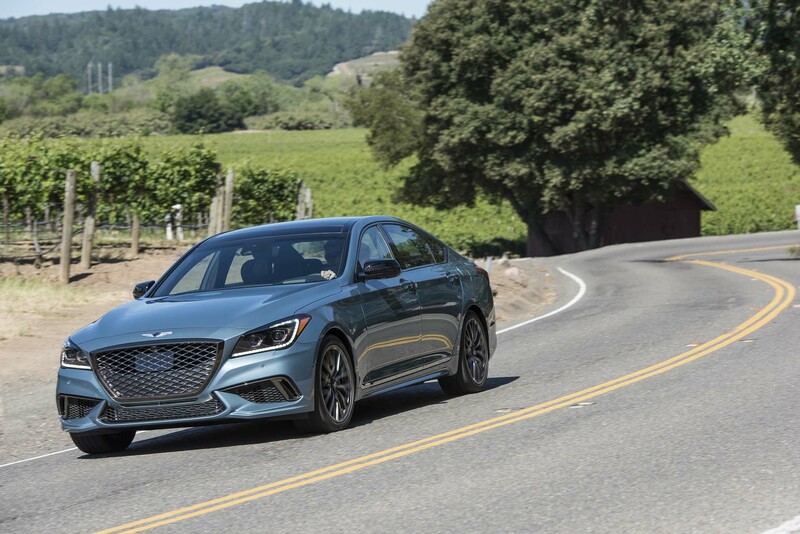 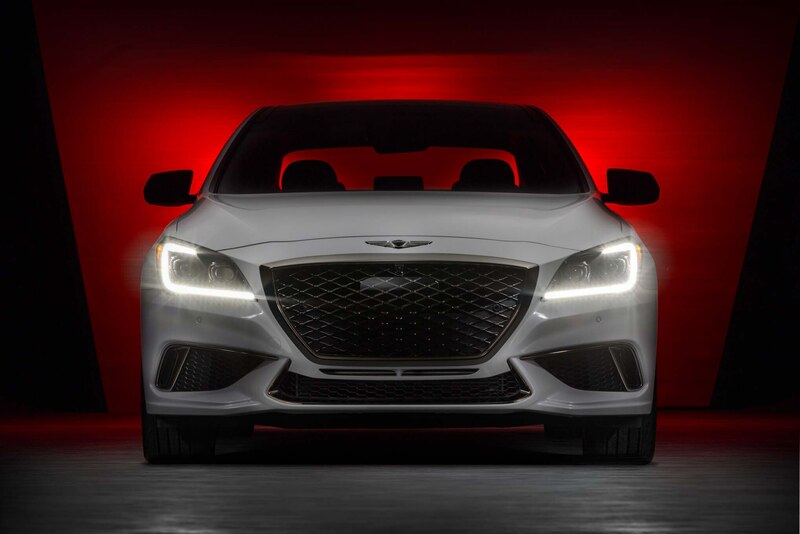 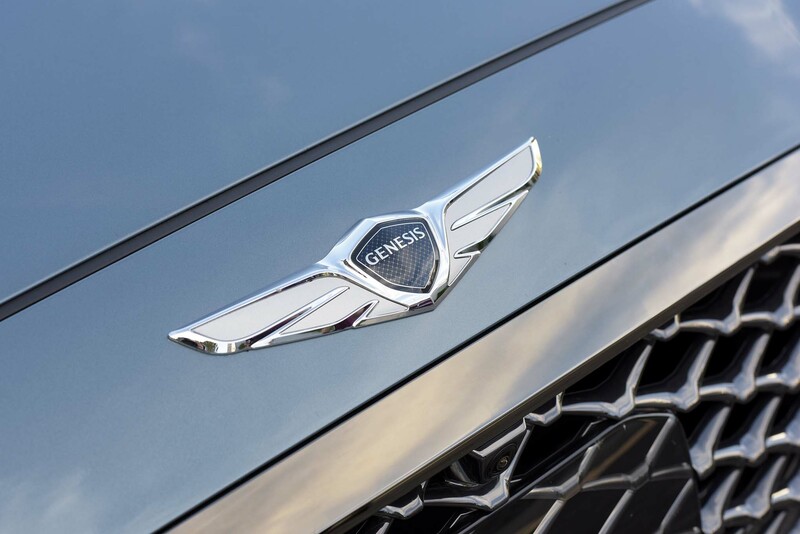 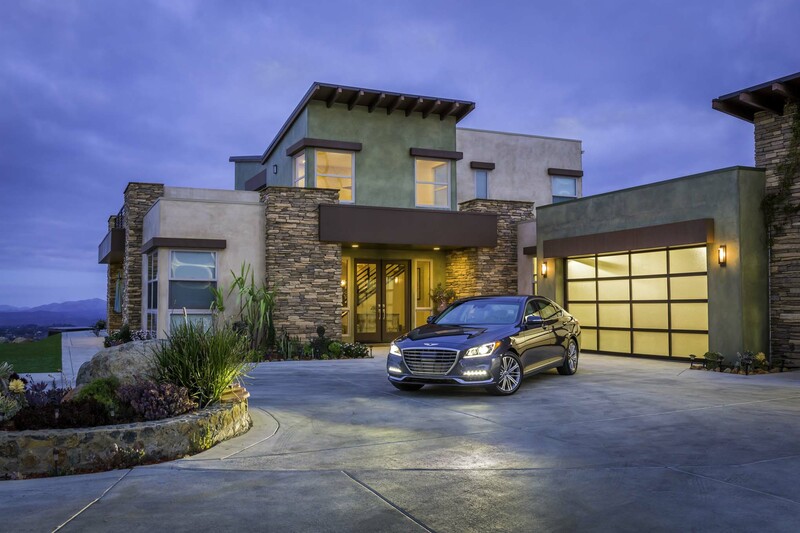 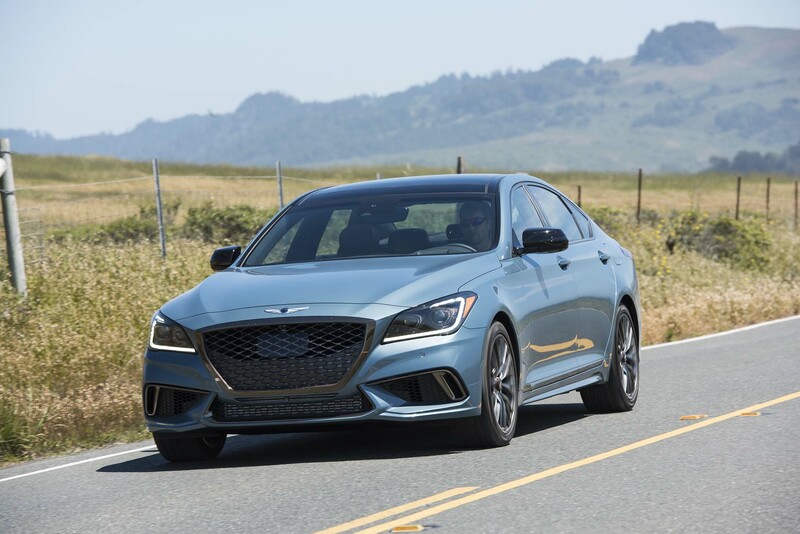 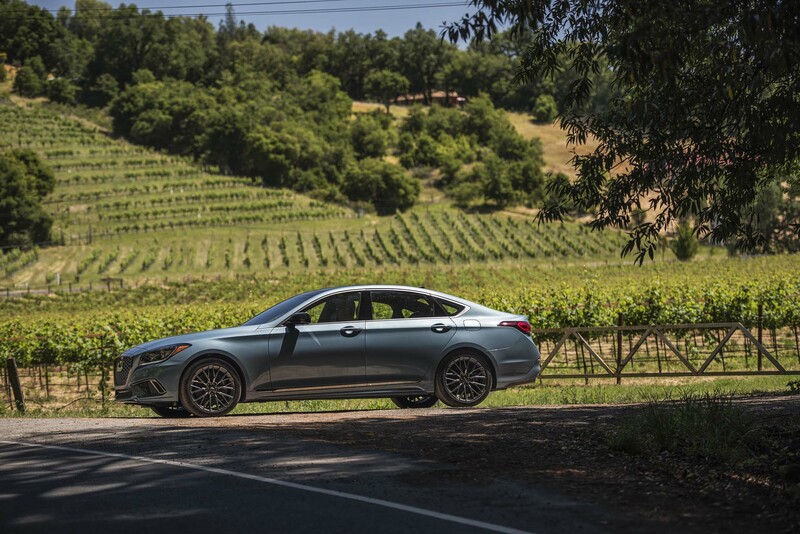 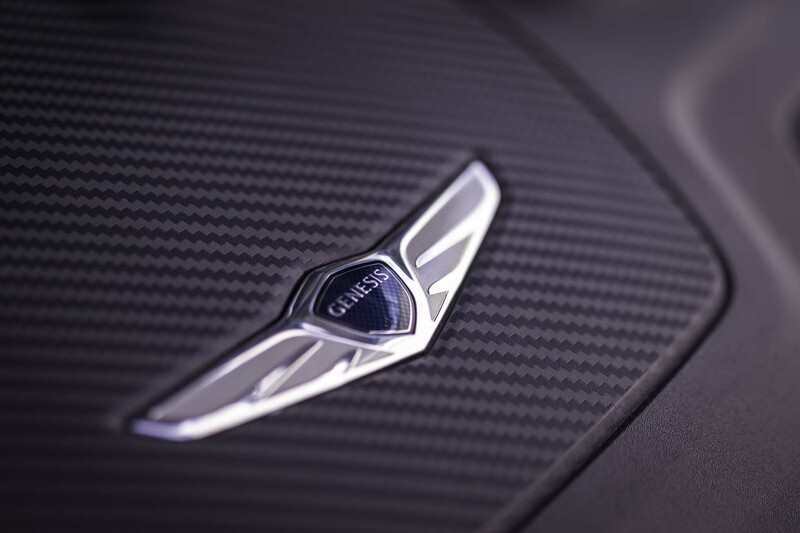 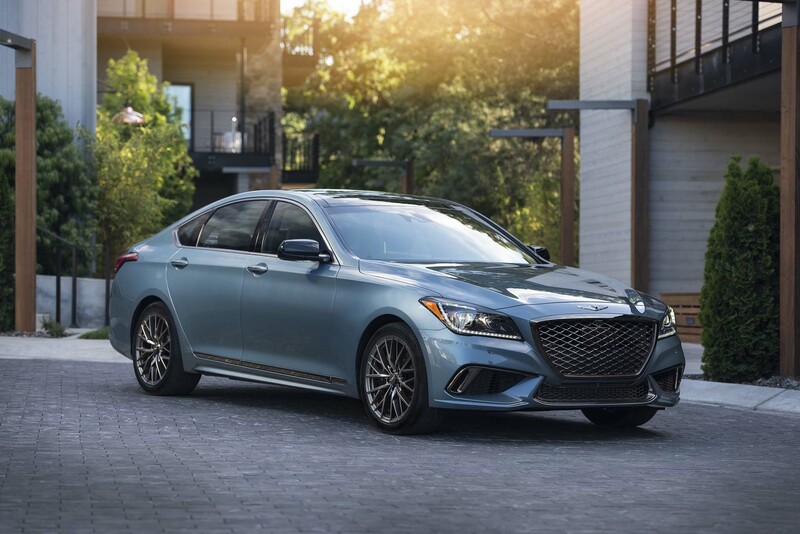 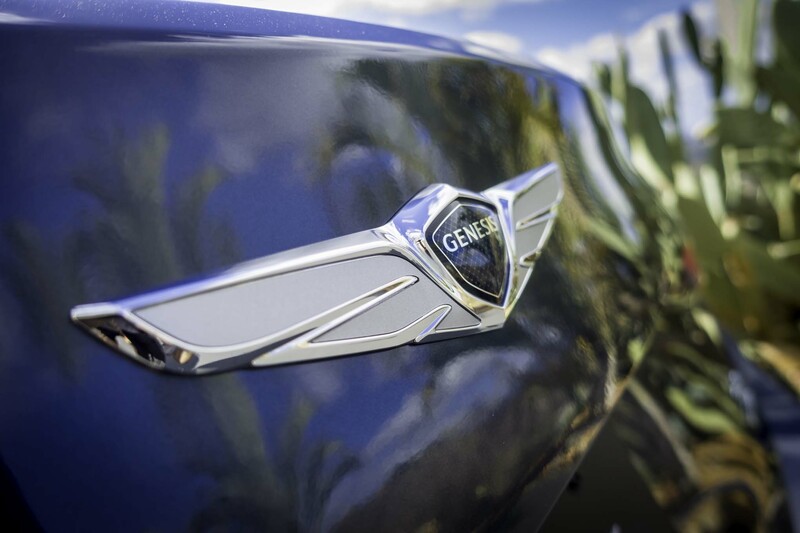 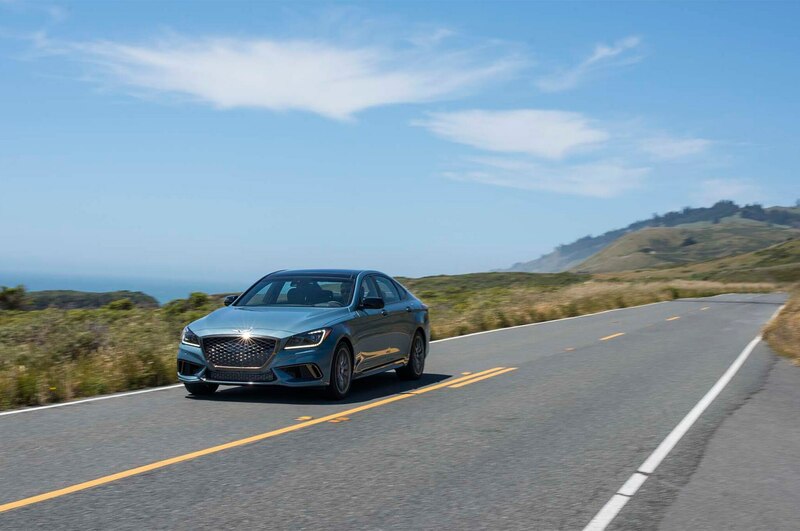 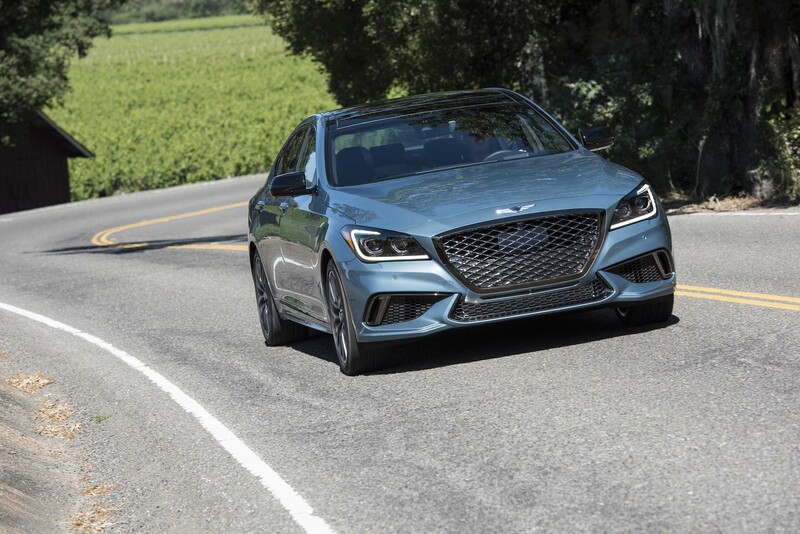 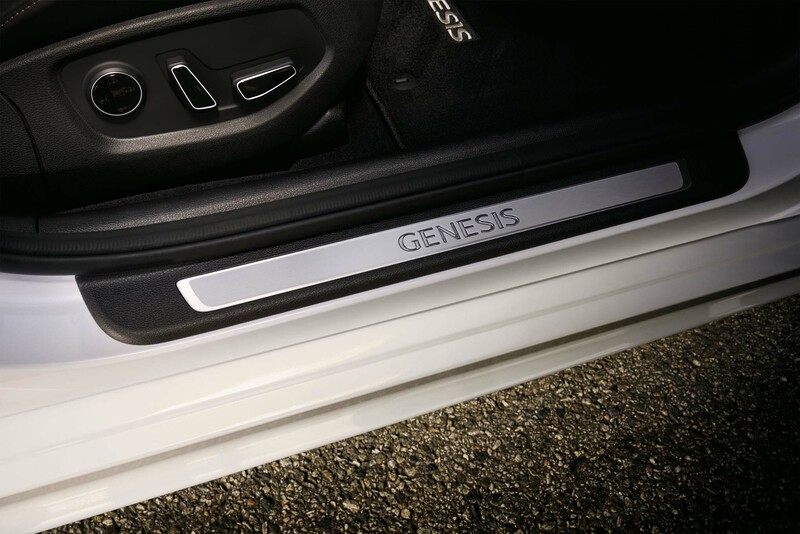 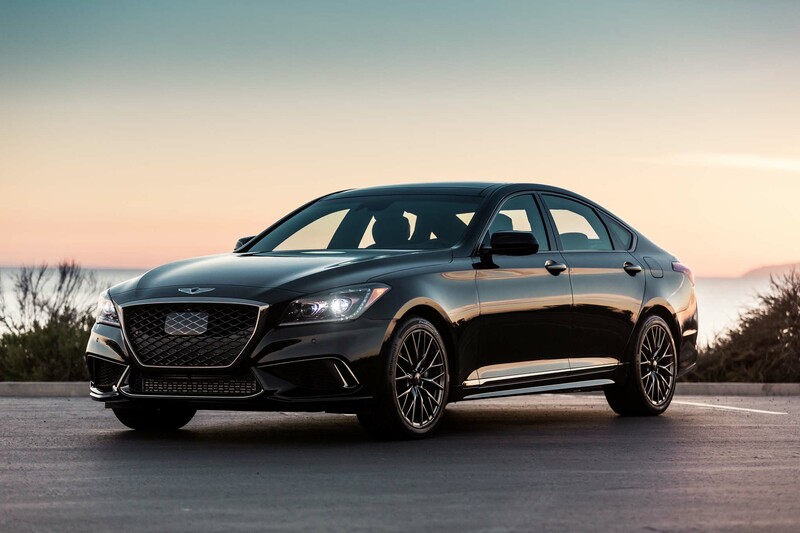 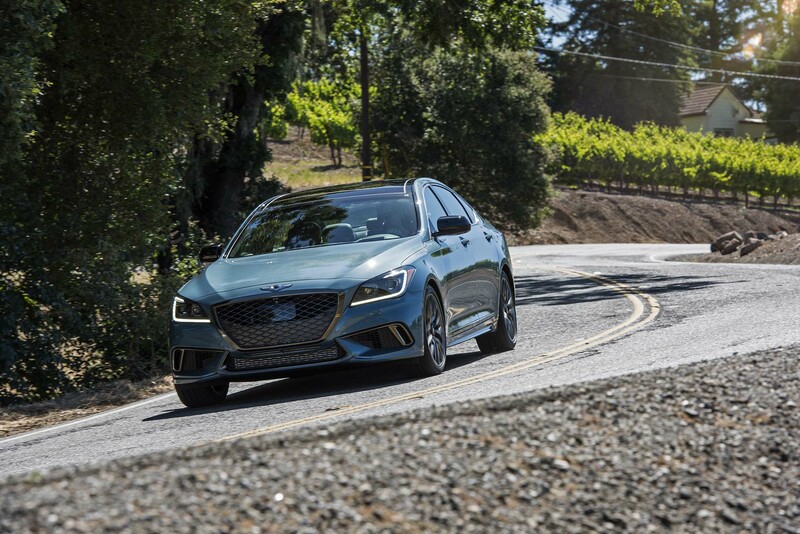 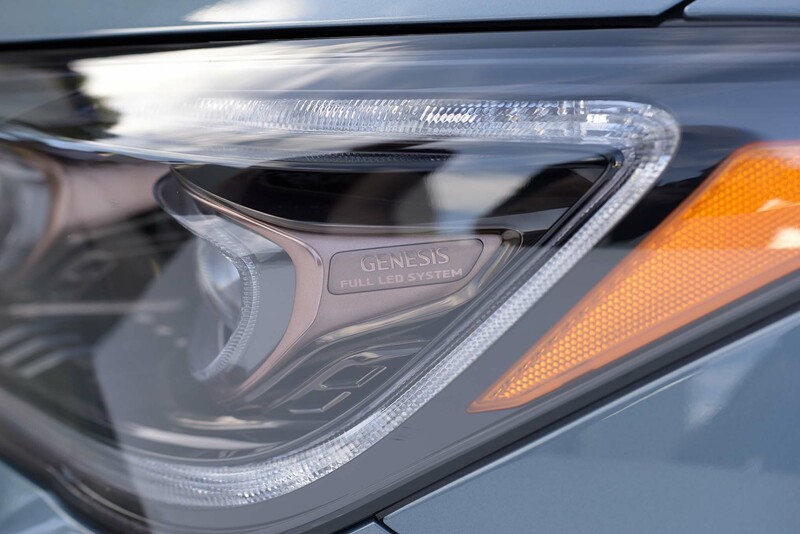 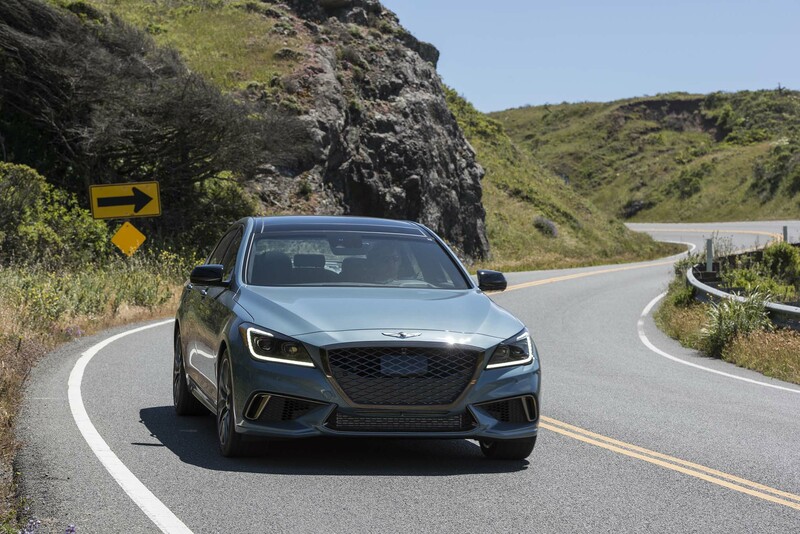 Genesis is holding events around the country to introduce buyers to the brand, and the G80 is already outselling the Audi A6, Cadillac CT6, and Lexus GS. 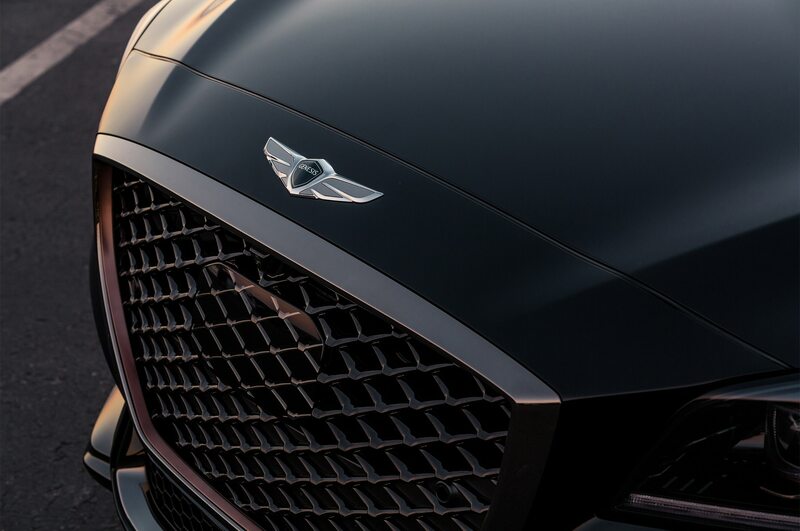 2018 will be the brand’s second year, and it sounds like they’re off to a cracking start. Perhaps buyers don’t expect much from Hyundai, just as we didn’t expect much from the G80 3.3T Sport. 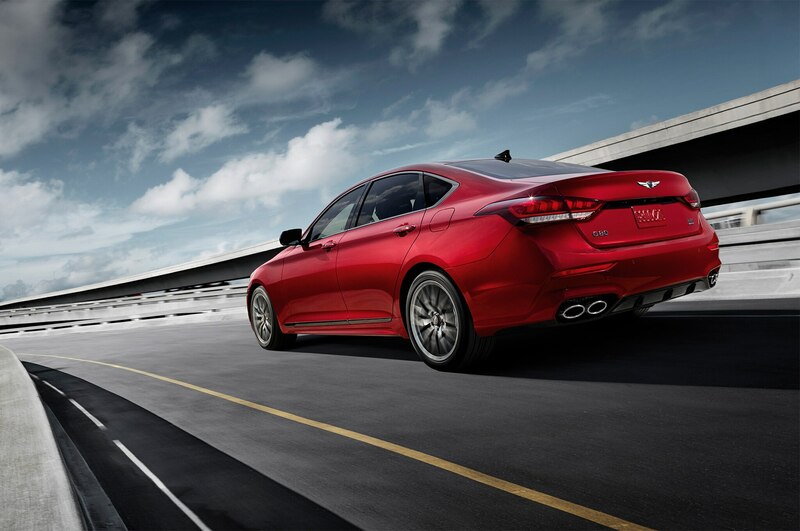 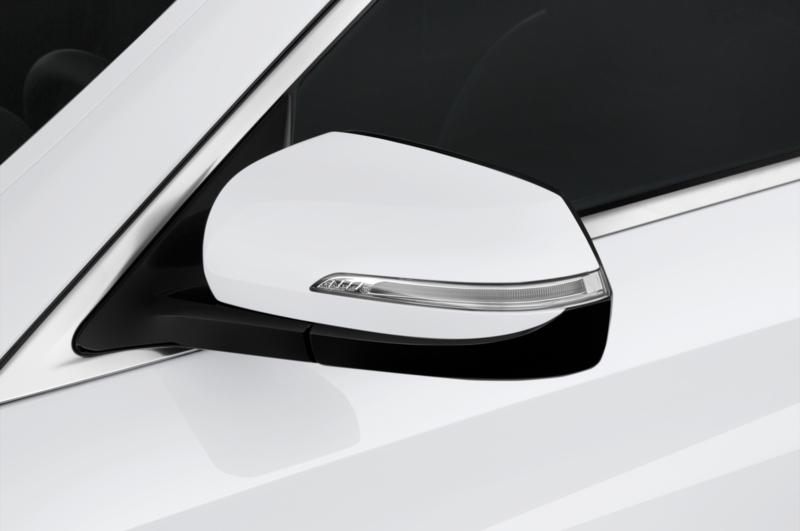 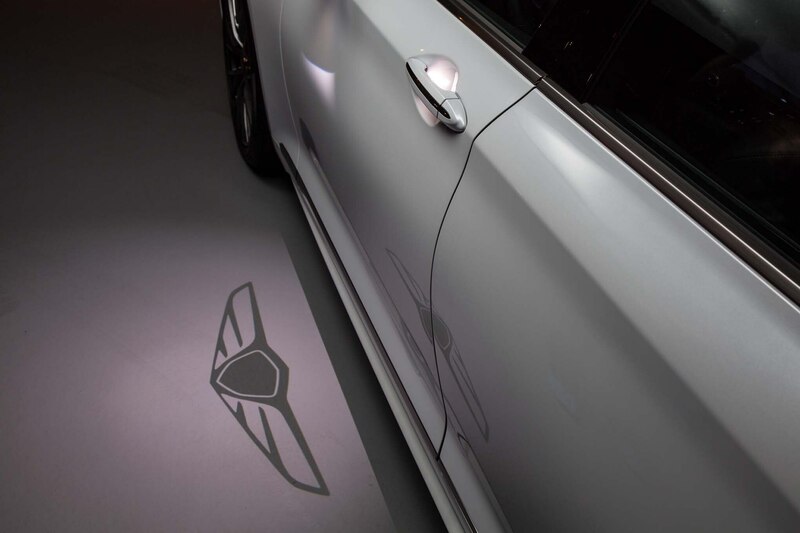 And perhaps those low expectations will be the key to success of both the brand and the car. 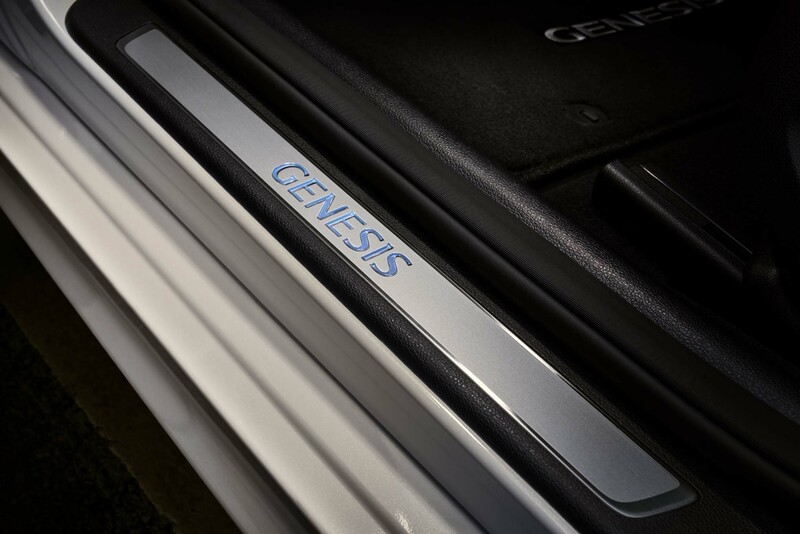 After all, if it works for my marriage, it can certainly work for Genesis.